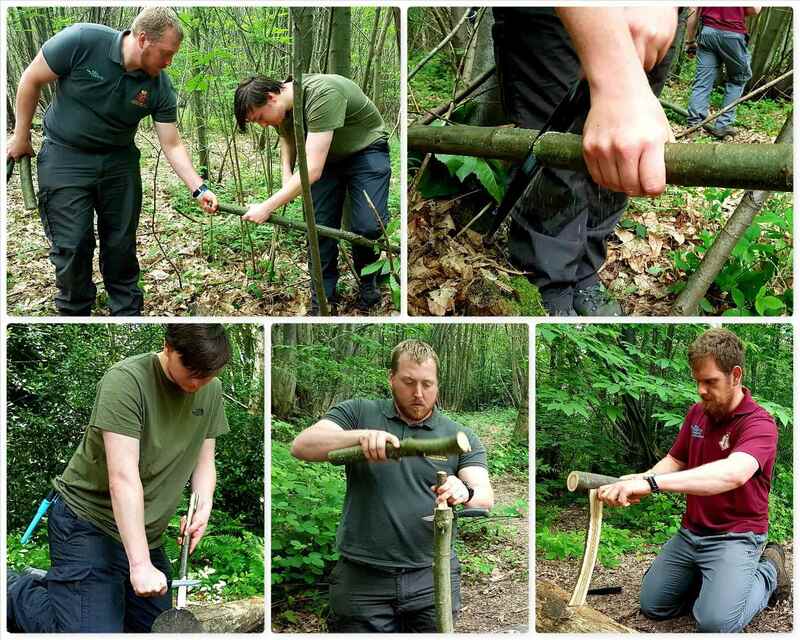 Over the last year or so I have found that my Bushcrafting has been taking a bit of a backseat to my other Adventure Training responsibilities so it was great to get back to some Bushcraft with fellow instructors from London Area Sea Cadets at one of our regular Multi Activity Staff Training (MAST) weekends. 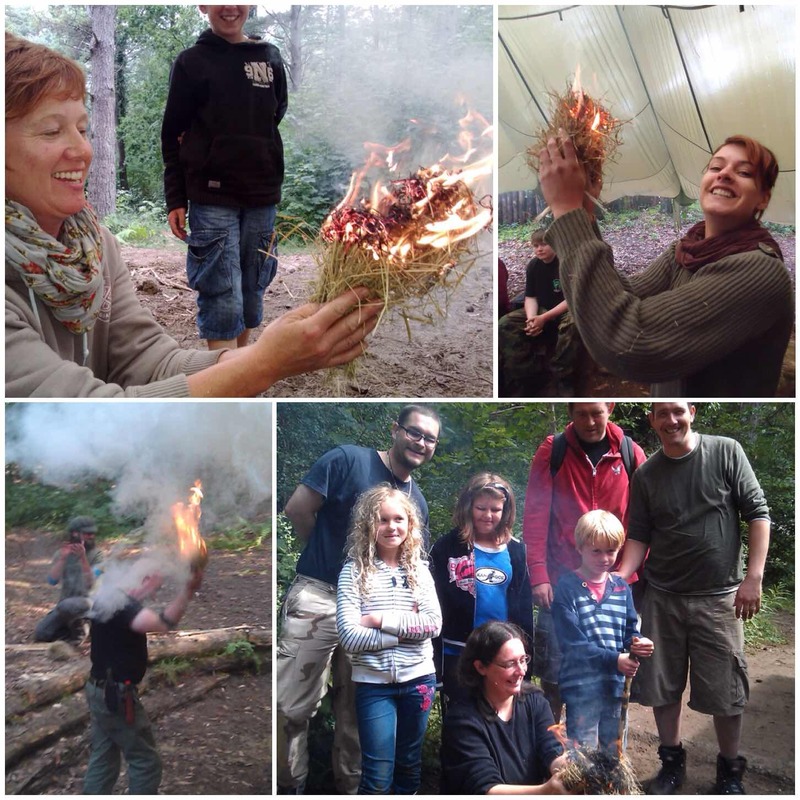 It was a bit of CPD weekend for some and a bit of a new adventure for others. 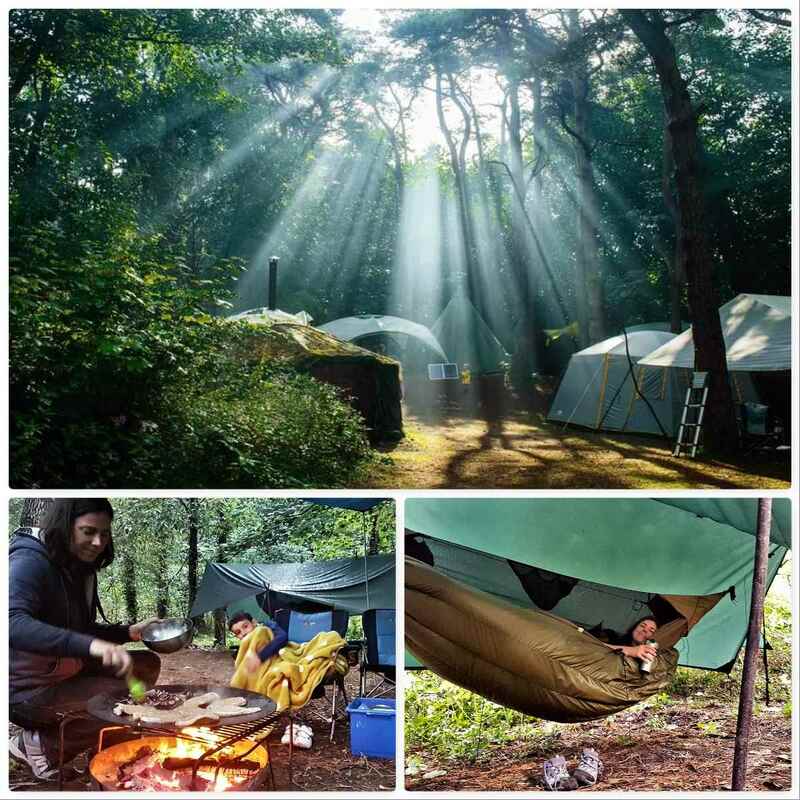 We took our time setting up camp on the Friday in the Mereworth Woods training area we had been given access to as the students were not due to join us until the Saturday morning – a kind of calm before the storm you could say. 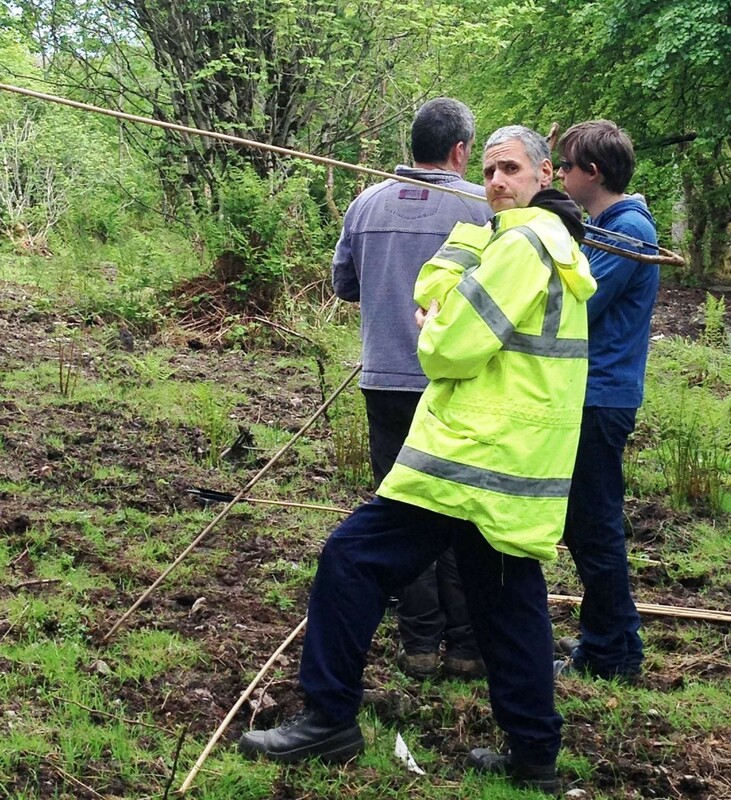 Along to help out and do some CPD were Dave, Alan, Charlie and Graham. 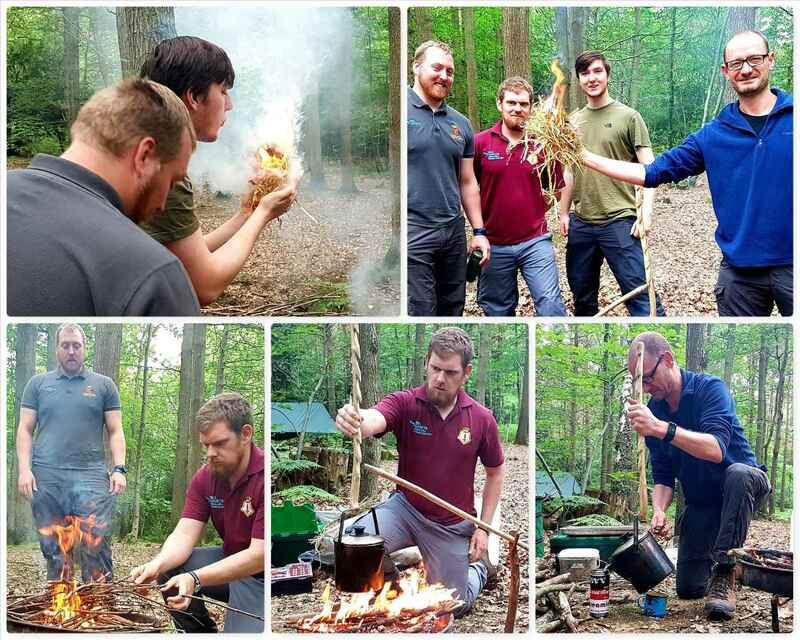 The instructors from the Adventure Training team looking to learn the basics of Bushcraft were Ben, Lee, Sam and Gary. 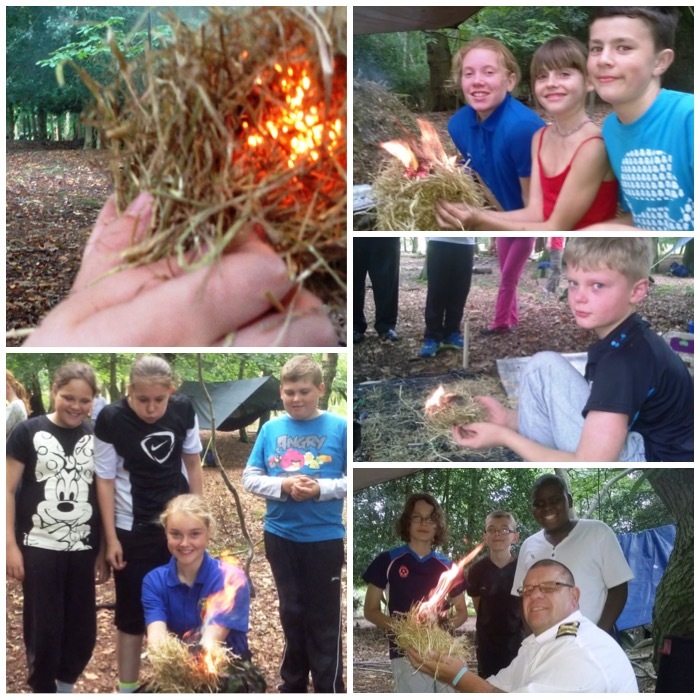 We like to run these Bushcraft courses from time to time to expand out Expedition Leaders skill set so that they can pass the knowledge onto their cadets. 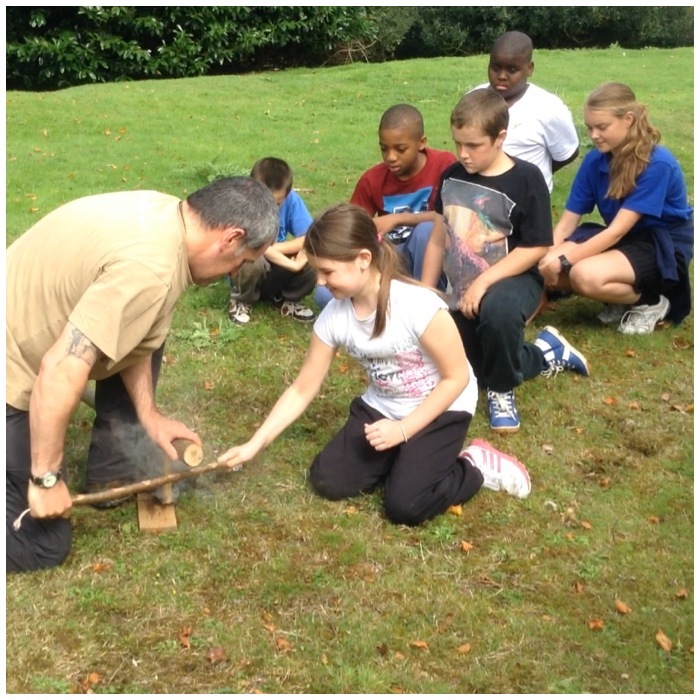 Before they were allowed to have a cuppa on the Saturday morning the students had to learn about lighting a fire. 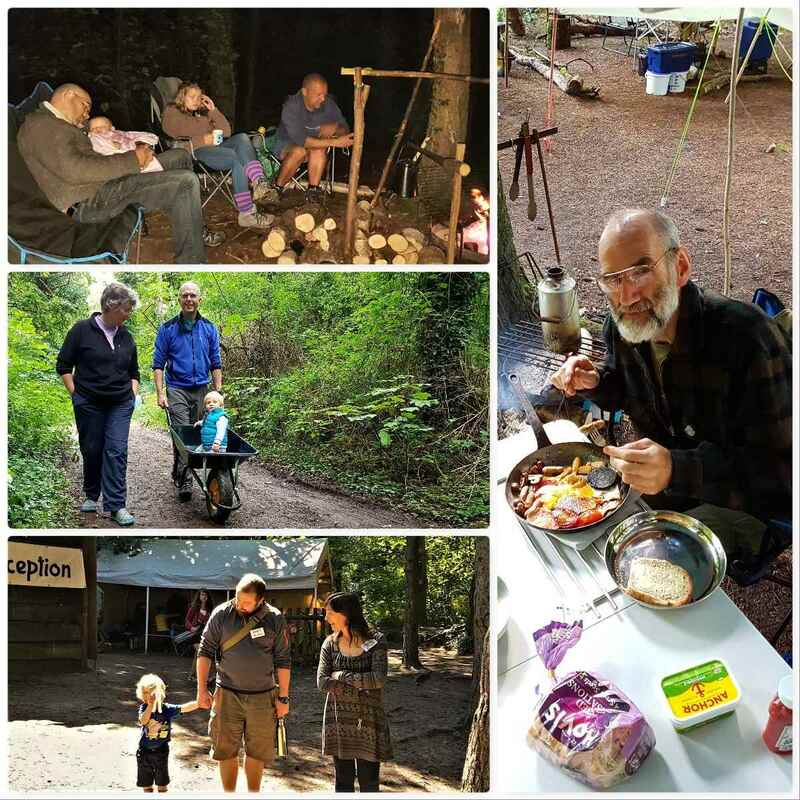 Off they went to learn about gathering dead standing wood, processing and grading it before learning to use firesteels – needless to say the tea and coffee was soon brewing. 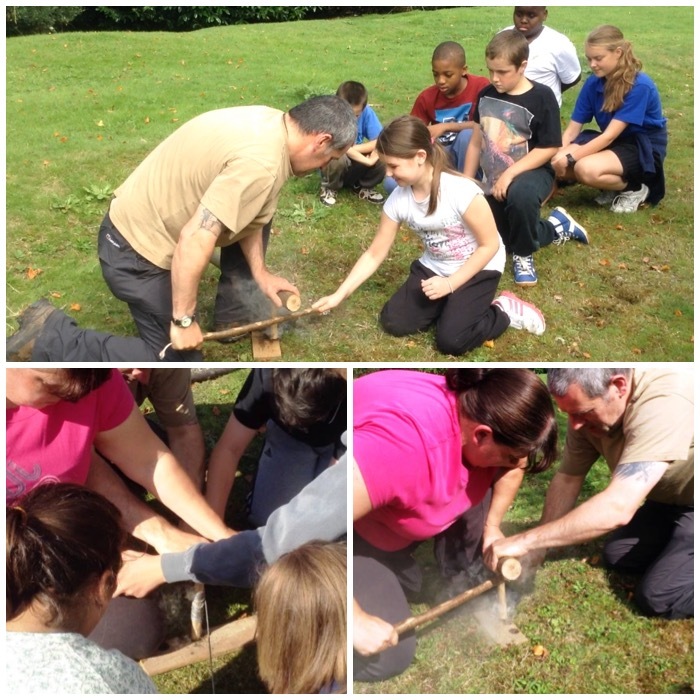 After their brew it was time to learn how to use saws and knives safely. 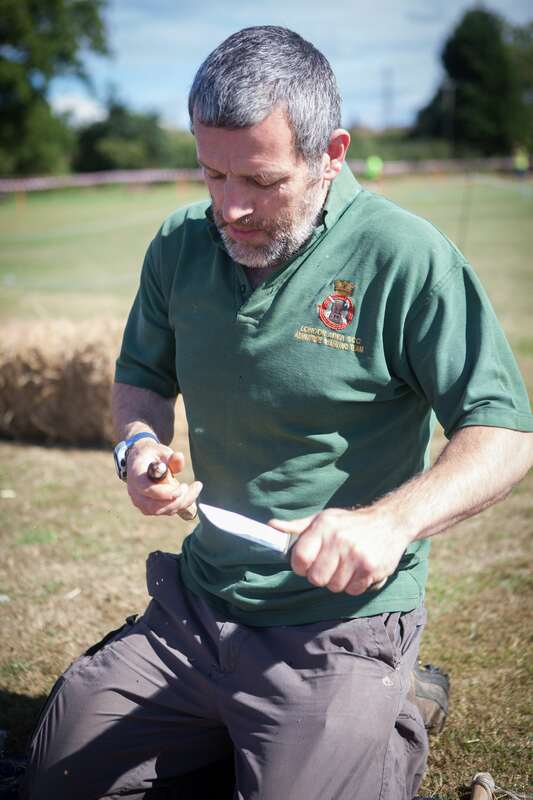 Once the wood was gathered they learnt about safe knife cuts and battoning. 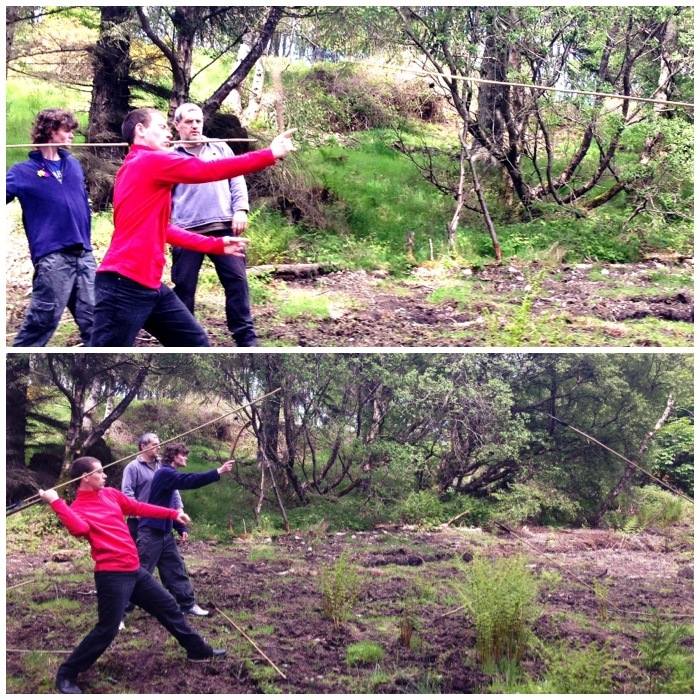 I like teaching in this way as there is no need to get axes out (and we did not have time to cover them anyway). 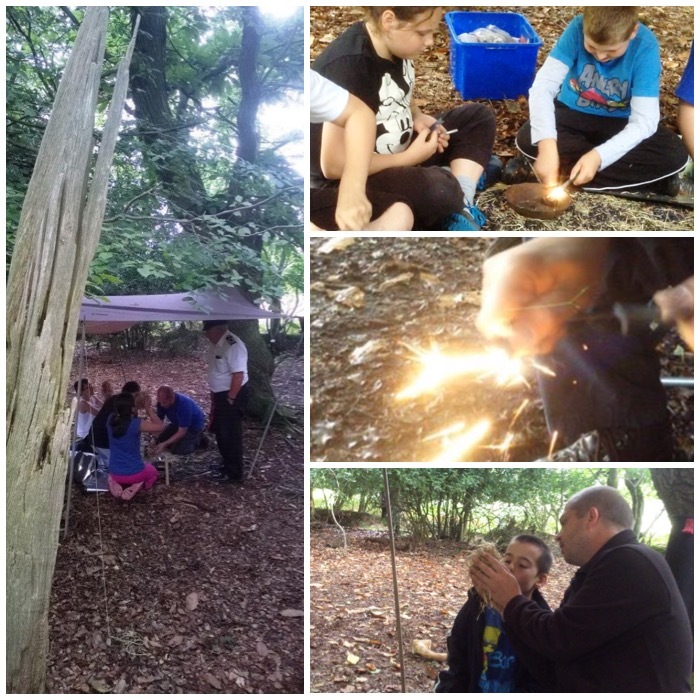 The students produced some strong tent pegs and looked at the techniques for making feather sticks for fire lighting. 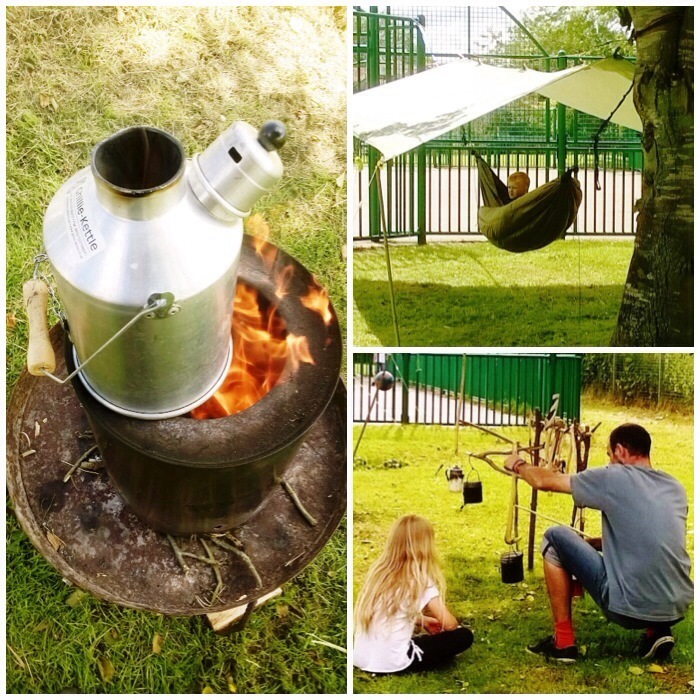 One of the things I wanted the students to do over the weekend was to set up their own camp. 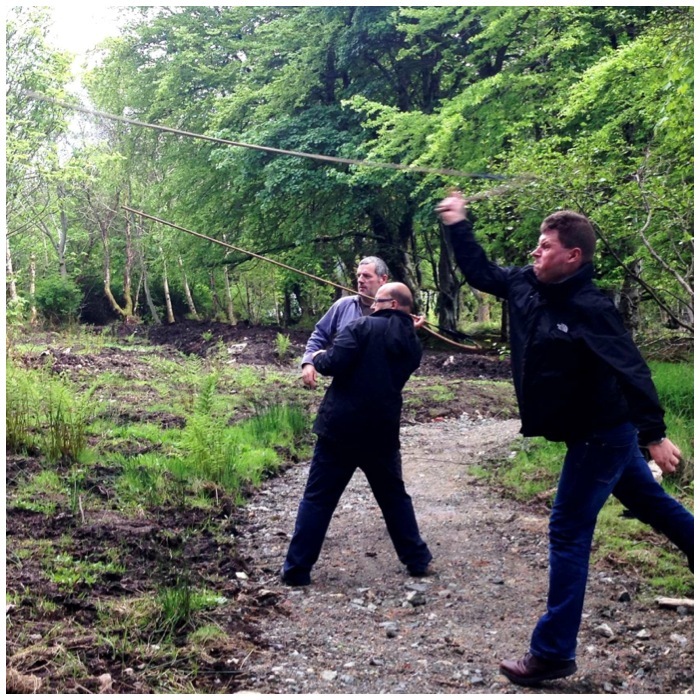 They learnt some of the basic Bushcraft knots with Charlie and how to throw a line through the trees. 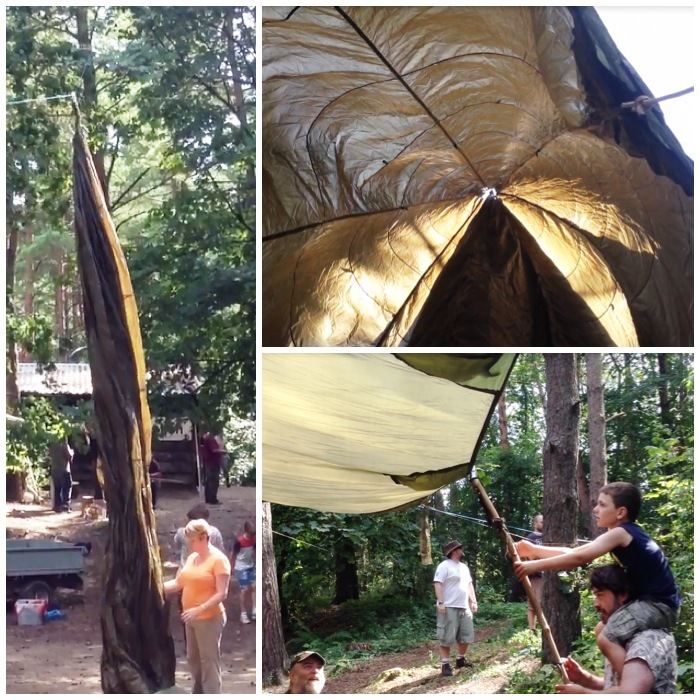 Soon they had their parachute up and firewood collected. Once that was all done they spent time with Dave and Graham learning how to put hammocks and tarps up (no ground dwelling on this weekend). 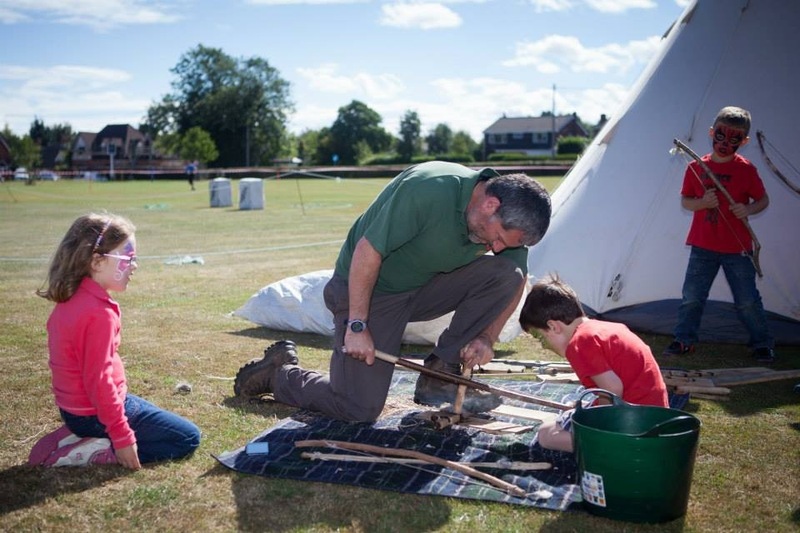 A popular activity at cadet camps is Atlatl dart throwing so Dave and Alan spent a couple of hours with the students getting them to carve their own Atlatl throwers. All the skills that they had learnt in the morning with the saws and knives were used here with some finer knife cutting technique thrown in to get the points done. 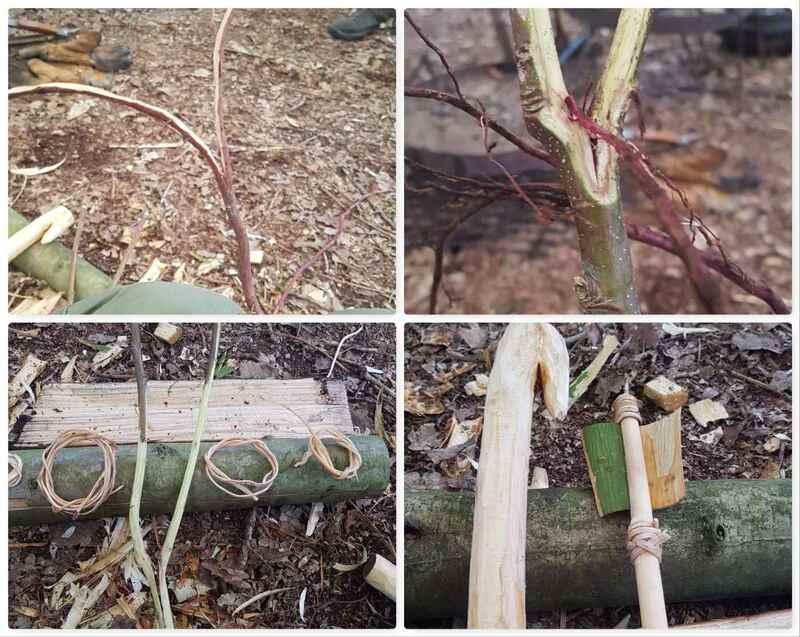 As this was CPD time for the experienced instructors Dave went off earlier on the Saturday and experimented with Spruce roots as cordage. 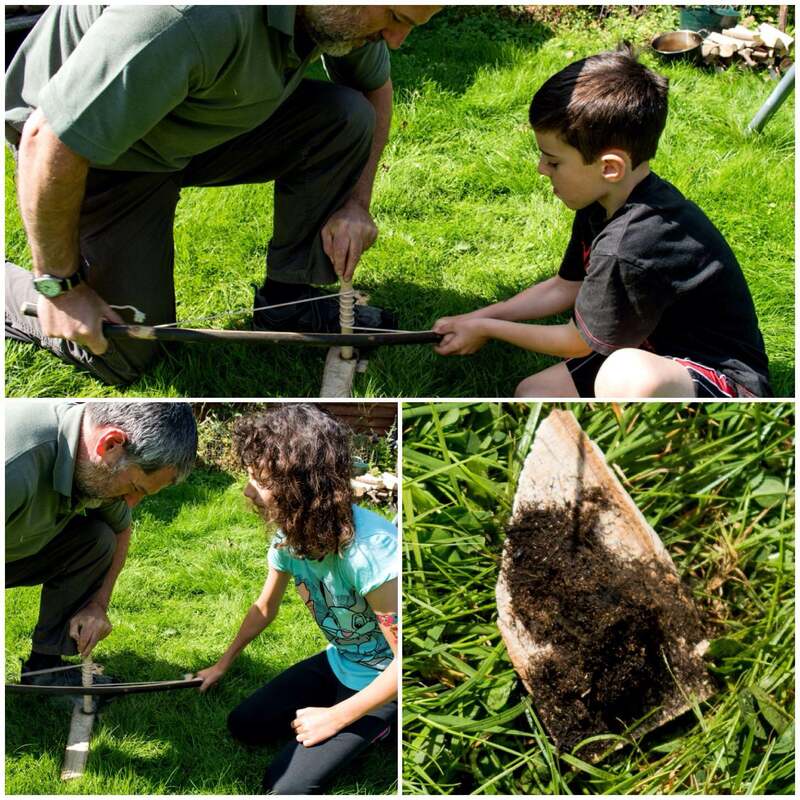 After digging up a little he split them down and removed the bark (with the forked stick) before using it to bind his demonstration Atlatl dart for his class. 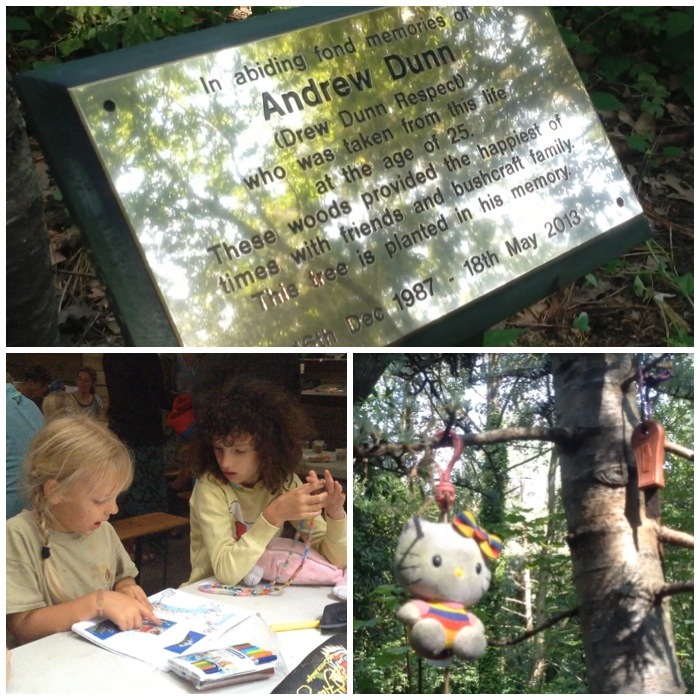 He also used Sweet Chestnut bark as a flight for his dart – worked perfectly well. We had a nearby glade that was soon set up as arrange and the darts were soon pinging away. 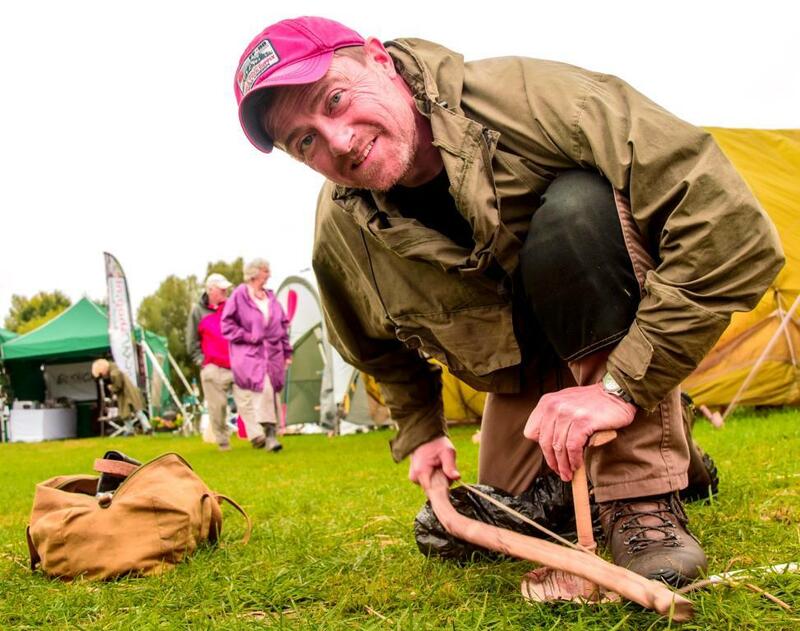 I have used Atlatls for years and shown hundreds of people how to use them – they never fail to intrigue people and offer hours of fun either in their construction or use. While Dave and Graham ran the range I went back with Charlie and Alan to help gather the material for ponassing some fish. Dinner was to be Trout, Chicken and Vegetable Kebabs. 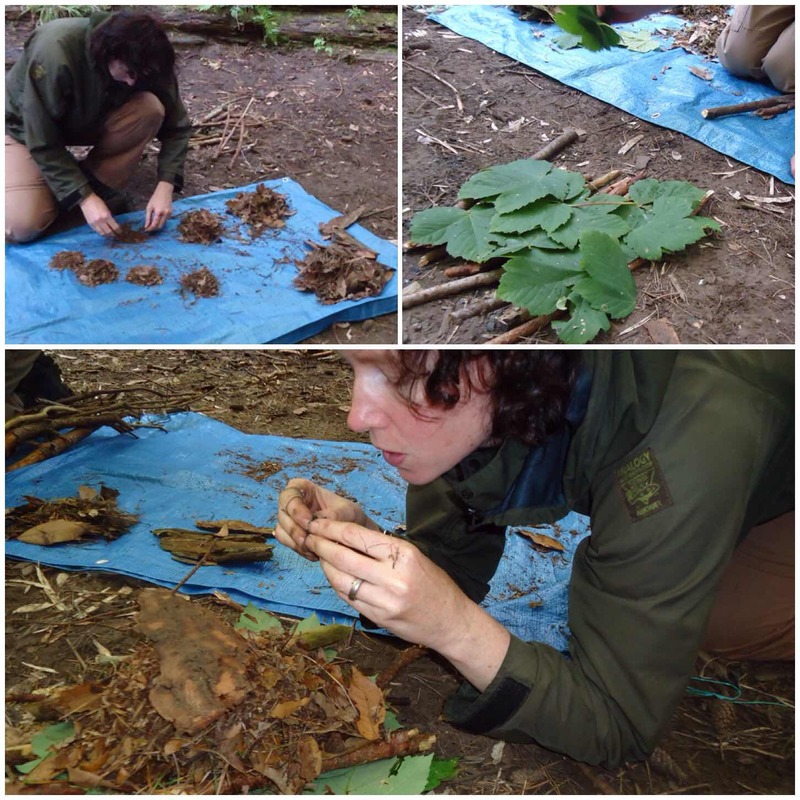 As well as ponassing we wrapped and bound one Trout in Sweet Chestnut leaves (these were the biggest we could find) and its inner bark. 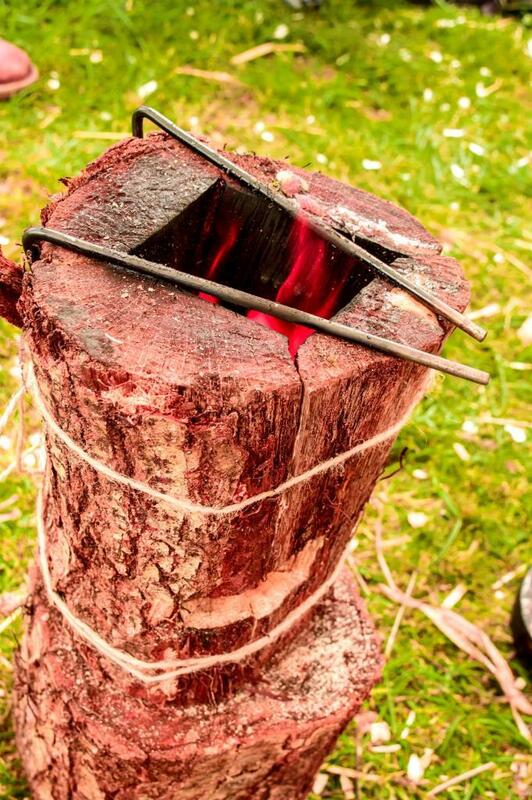 The fish was then cooked over the open fire when the coals were nice and ready. Alan ran our little galley and had the students helping him out on all the stages. It was not long before everything was cooked and even less time until everything was eaten. We retired to the students parachute for the evening to watch the fireworks display – Sweet Chestnut wood sparks fantastically. Luckily we did not get one of the many thunderstorms we could hear nearby pass over us, so we remained dry while we watched the fireworks. After a good nights sleep it was time for the breakfast feast. 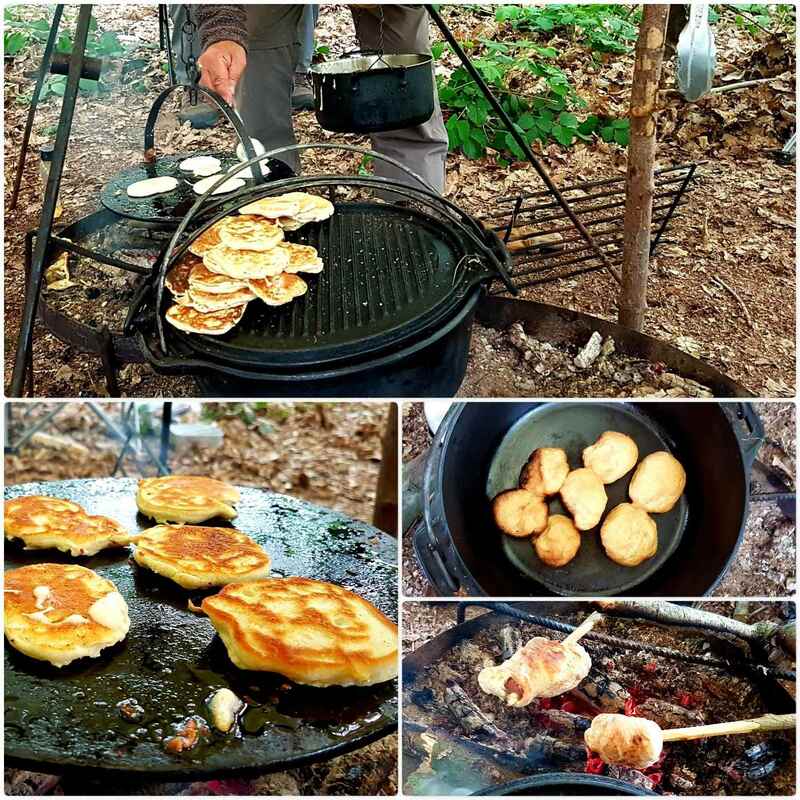 My wife Alison had made me up a pancake mix and Alan soon had the skillet working hard cooking pancakes (with a few rolls baking away on the side in the Dutch Oven). 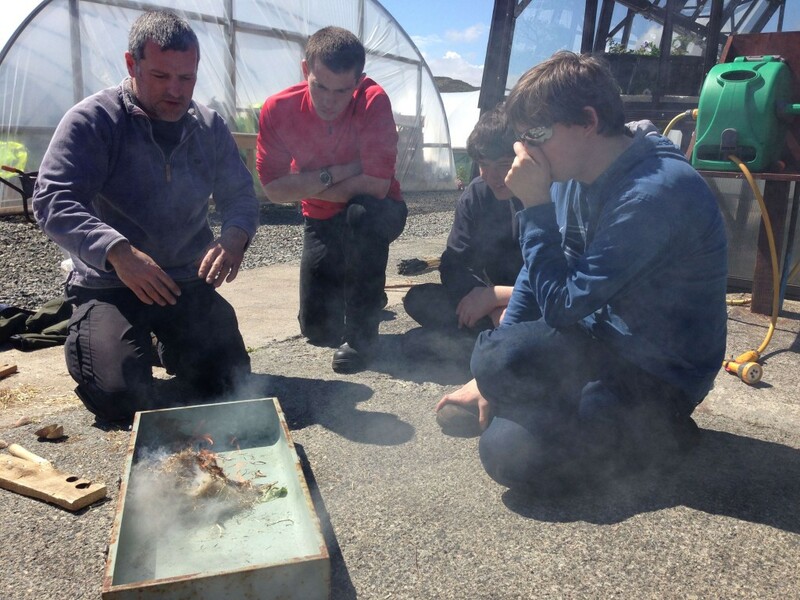 As well as pancakes we had the students cooking fresh sausage rolls over the fire (another great cadet pastime. 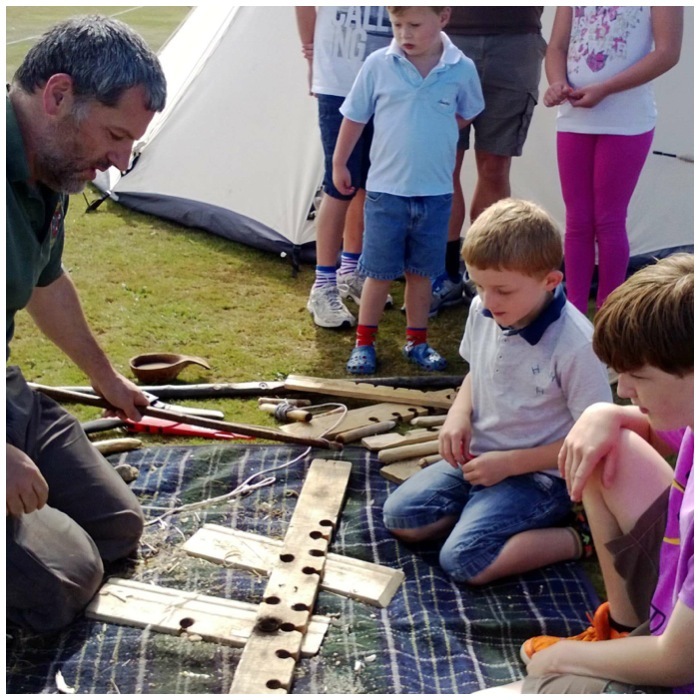 Straight after breakfast – out came my bow drill kit. 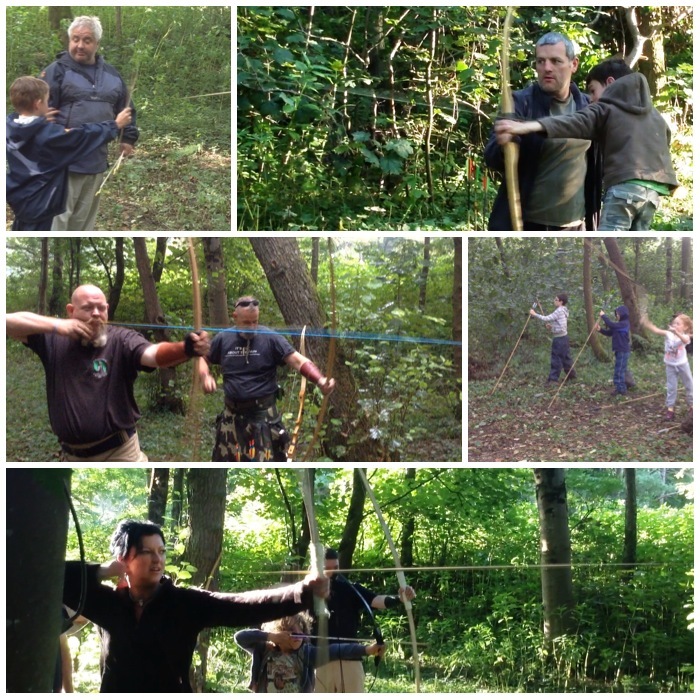 This was not a full on bowdrill workshop but a taster to show how ‘assisted bowdrill‘ works. 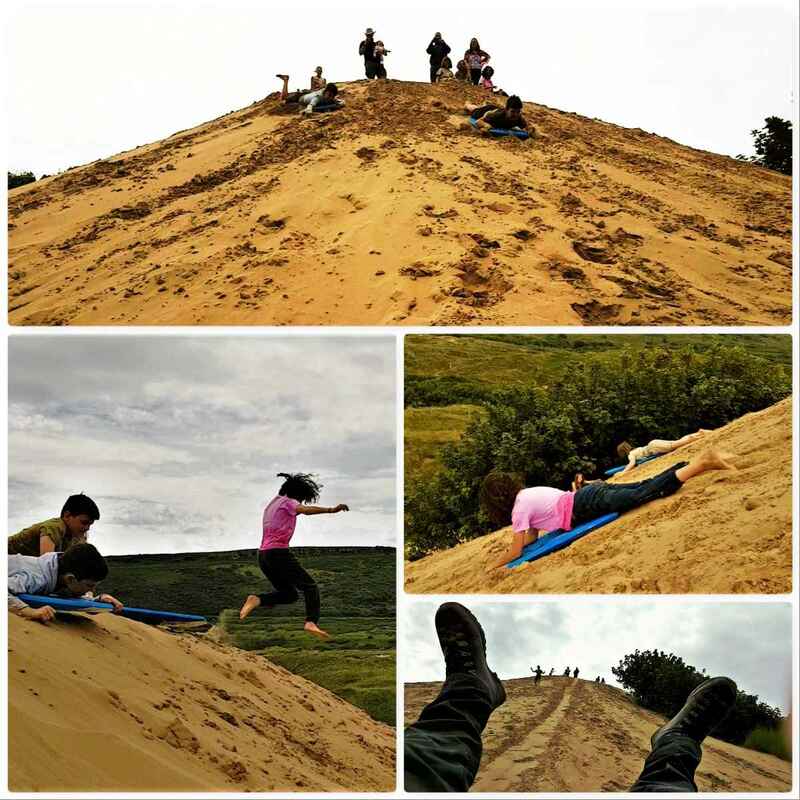 When we do this activity with cadets we always do it with the assistance of an instructor (or as a group of four or five) due to a lack of time usually. 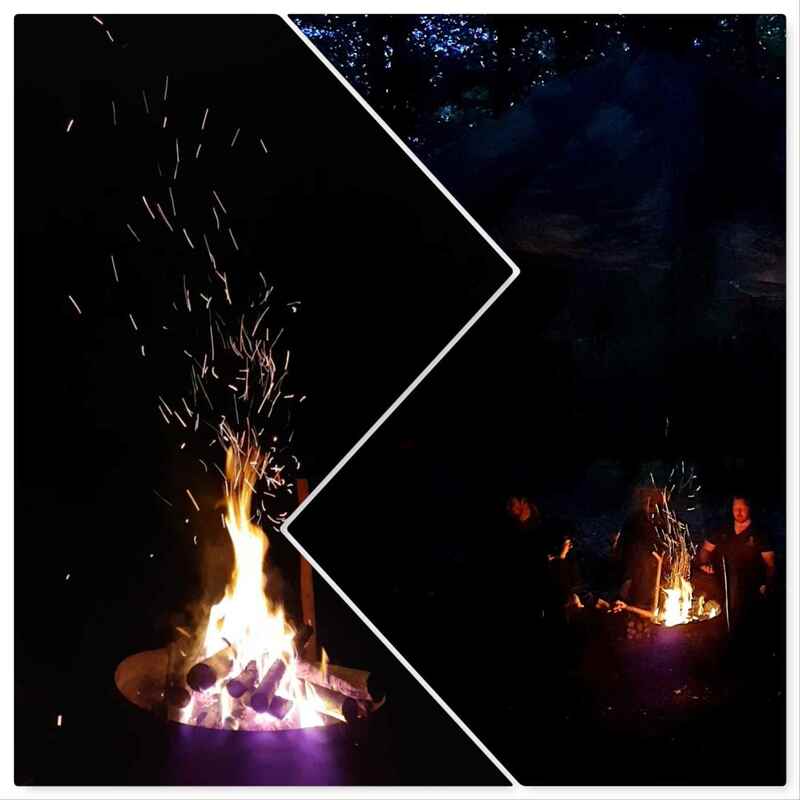 We used a couple of different methods and got good embers every time. 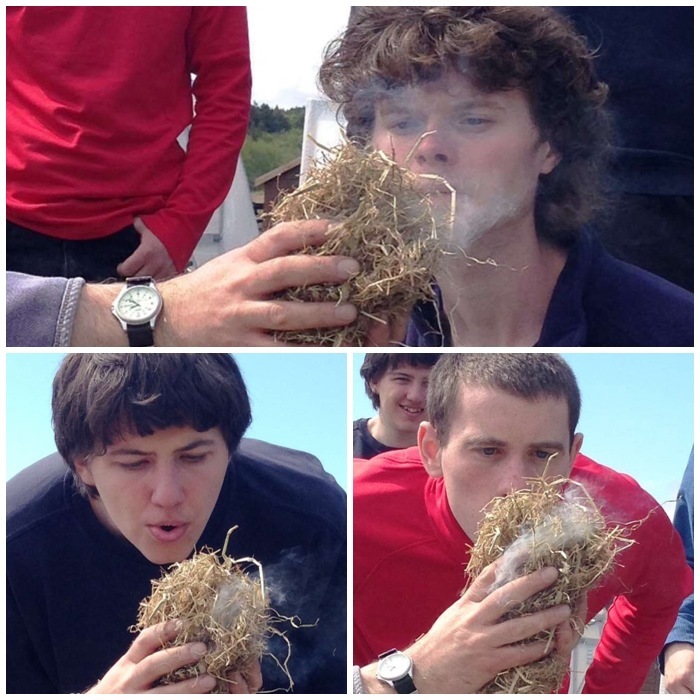 In the Sea Cadets we work with ropes a lot (seamanship and all that) so I showed the guys how to make rope using grass. 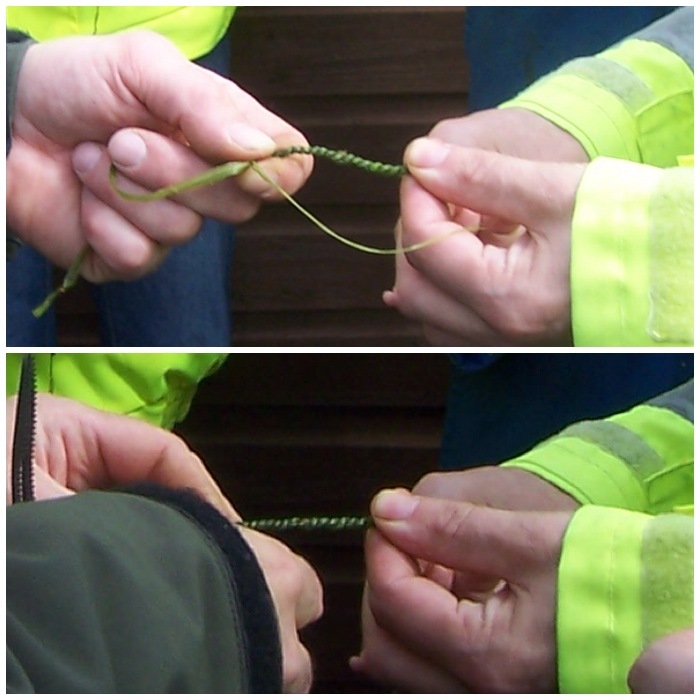 This is a fast rope making technique and we can create enough (with the right material) to make enough rope to do a seamanship class if needed (or just make earrings). To finish Dave showed the students how to make some char cloth in a tin – we did not have time to finish it all off but they got the principles. It was soon time to pack everything up and head home. 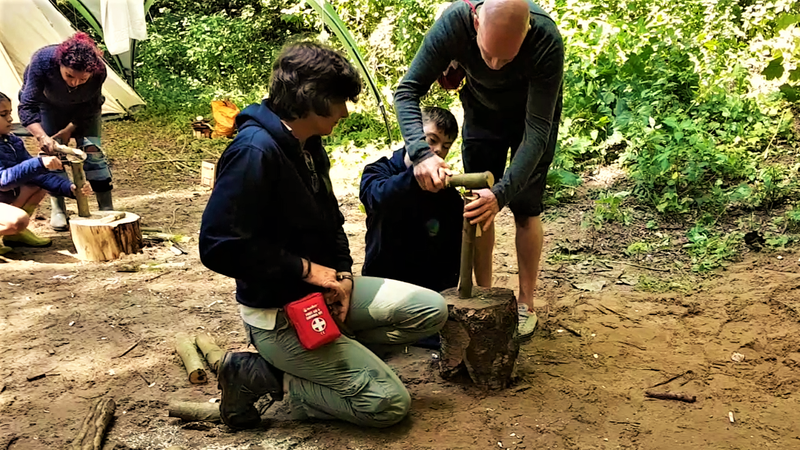 Normally it is just the instructors that do most of this work so it was great to see all the students getting stuck in to put everything away in the correct manner so that it can be deployed quickly the next time we run a course. 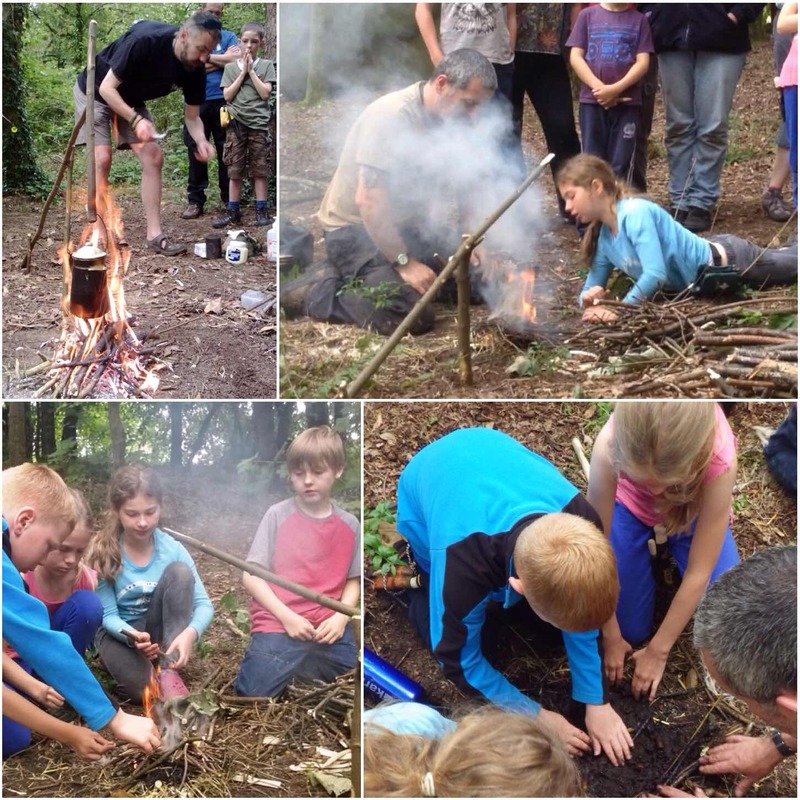 It was great to be back out doing Bushcraft again and sharing knowledge on the subject. 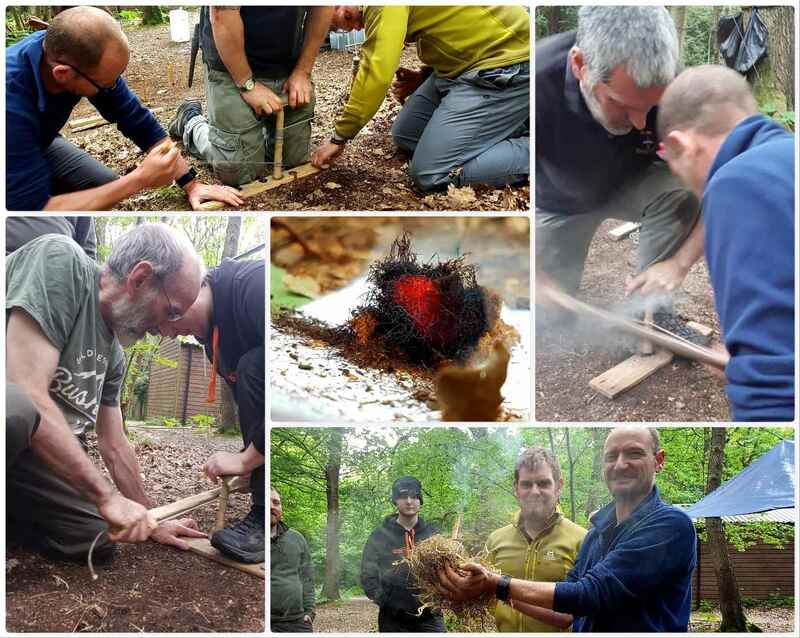 I hope some of the guys are with us in a few years helping to deliver this course as having a good understanding of Bushcraft really enhances their skill set for teaching cadets. I hope to be back running another course at MAST next year. 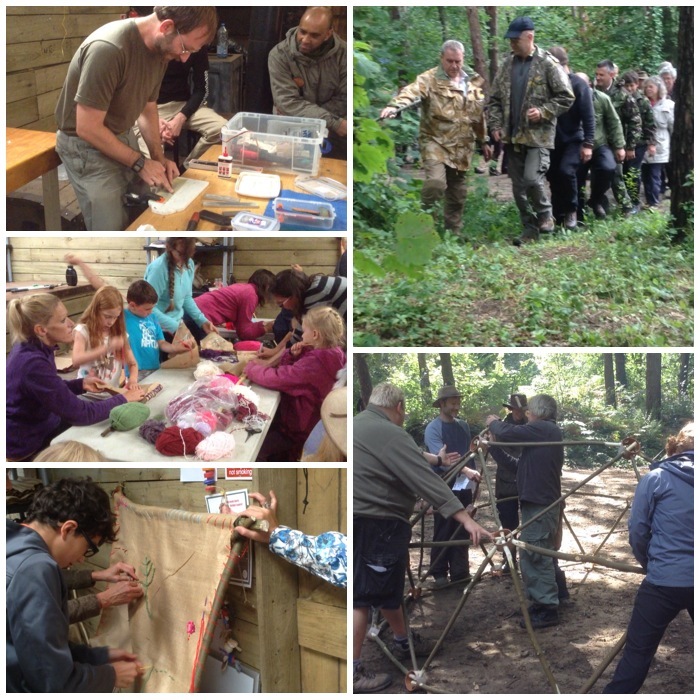 Catching up with friends, learning skills and getting some new kit – that is what the Wilderness Gathering is to me. 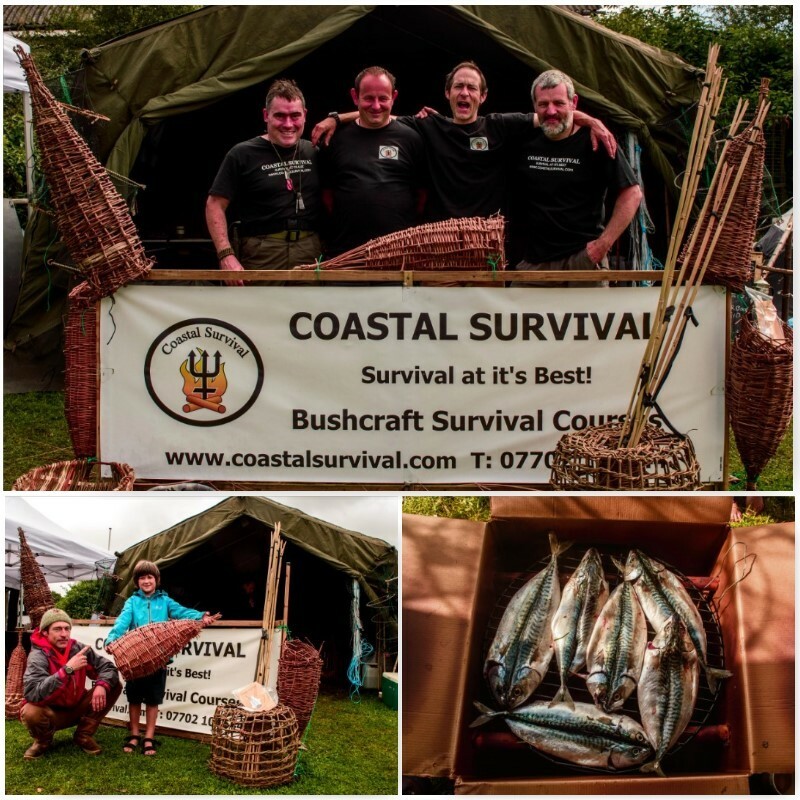 Coastal Survival has been attending The Gathering for quite a few years and this was a busy one for me as they went. 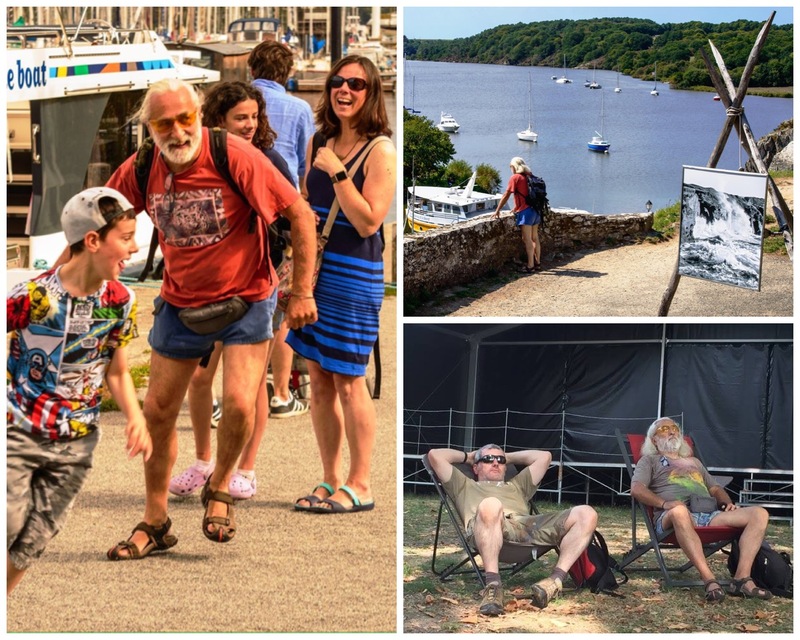 I could tell that as most of my pictures this year were of what we were up to and not about what everybody else was up to. I was working alongside Fraser Christian, Danny Stocks and Chris Lundregan (we were also joined by Lorna Stocks). 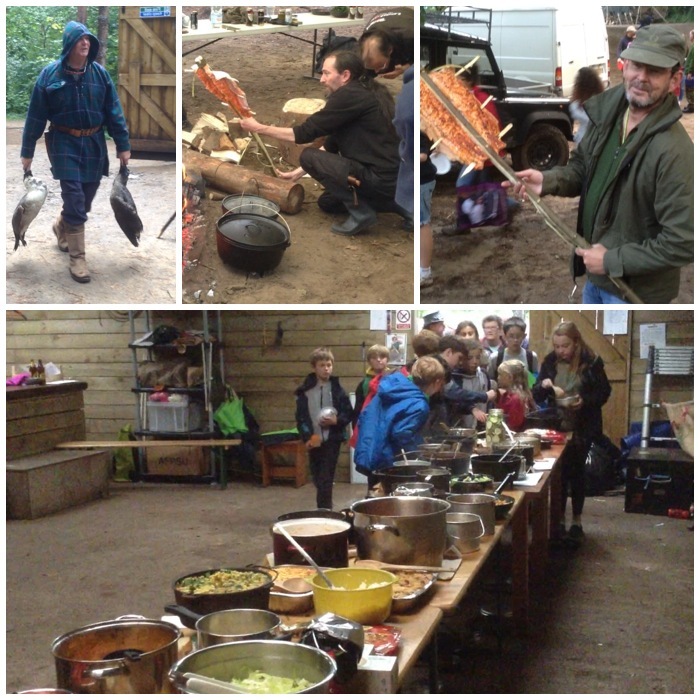 Food and skills were the order of the day for us at this years show. 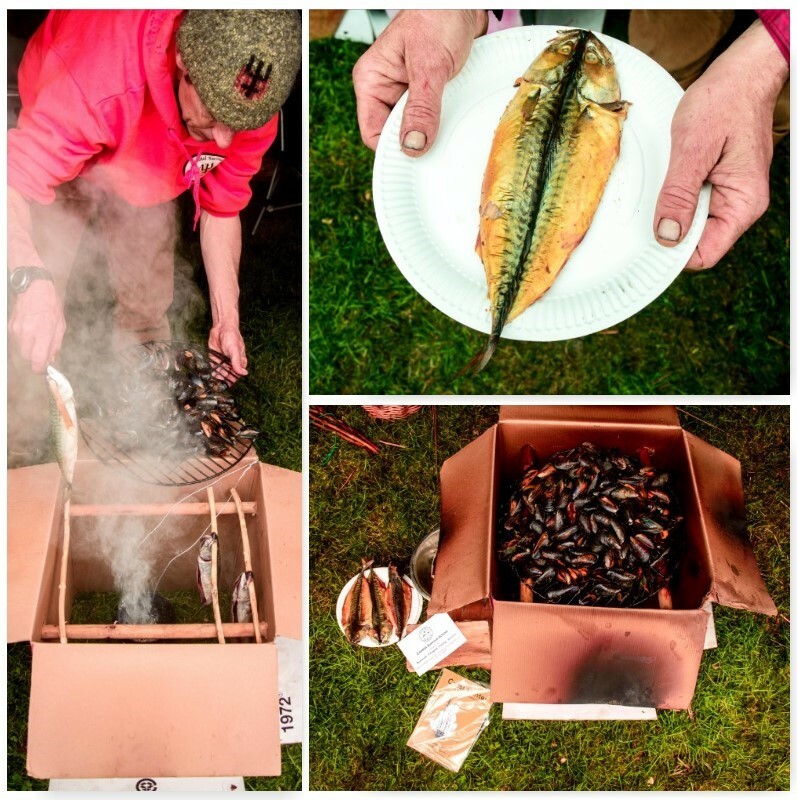 Over the weekend we kept a hot smoker going producing smoked mussels and mackerel. This kept a steady stream of visitors coming up to the stand. So much so that I did not get a great deal of time to wander around the rest of the show. There was some time to get out though and catch up with folks. I missed Steve’s class on prepping rabbits but by the look on his face it went well. Our neighbours at the show were Sonni and Angela from Beneath The Stars Leathercraft – the nicest set of neighbours than you could wish for. Also spotted frequently was Jason bowdrilling away for the visitors. 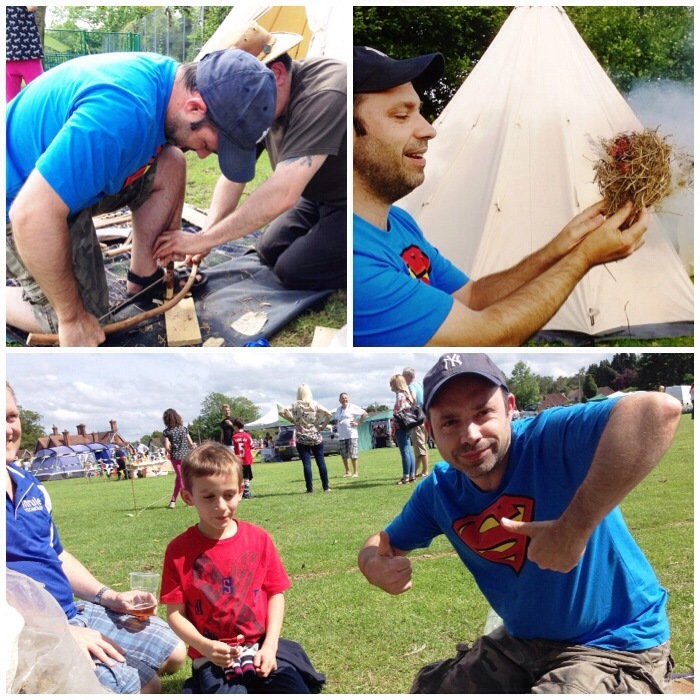 I sat beside him for one of his demonstrations and got some cracking pictures that I made into their own blog – Jason and the Ember Extender. 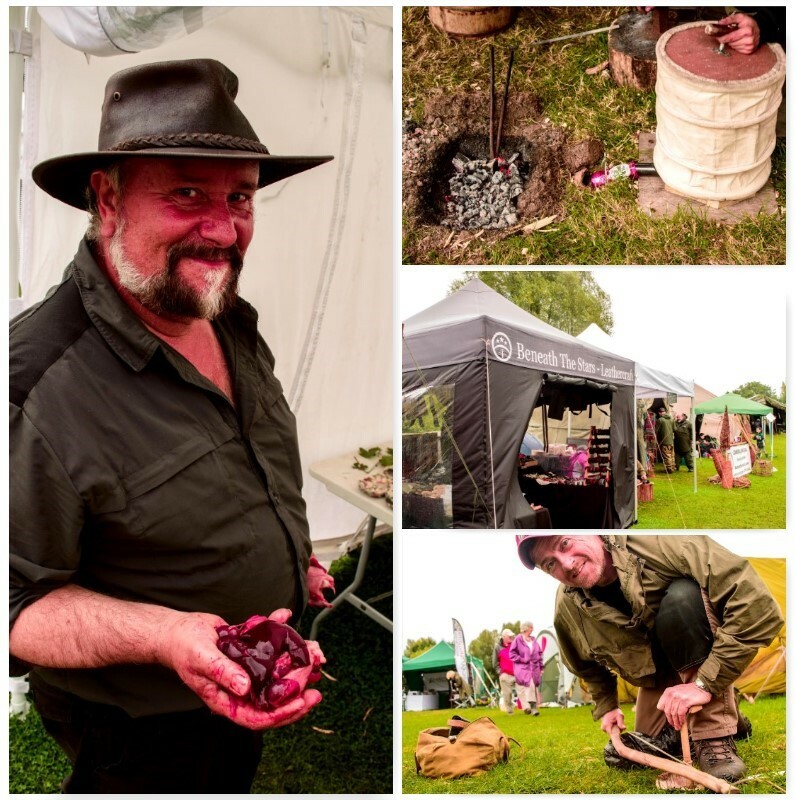 Regular readers will know I am a fan of Damp Log Rocket Stoves and Des was there this year firing them up. 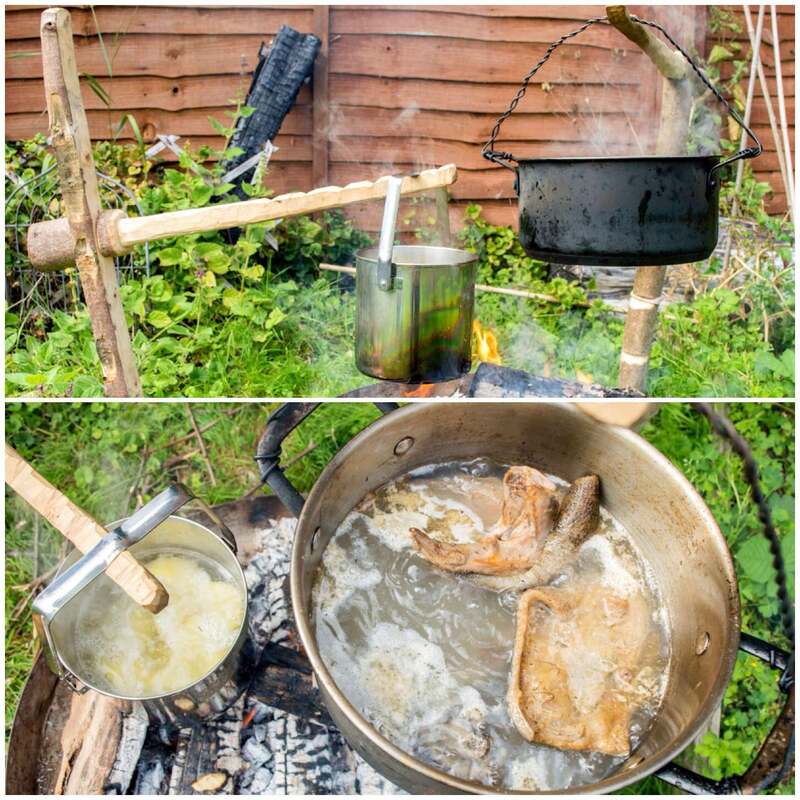 This particular Log Rocket was very damp but he persisted and soon had a hearty stove that produced plenty of brews. 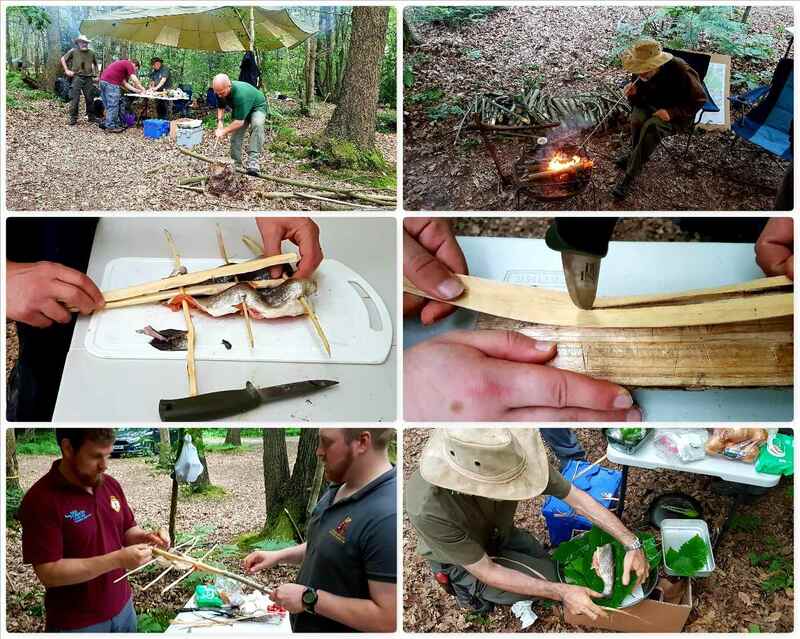 As well as producing smoked food we spent time giving various classes such as this one on making a Bamboo Fishing Spear. This simple device does not take long to make and really packs a punch. 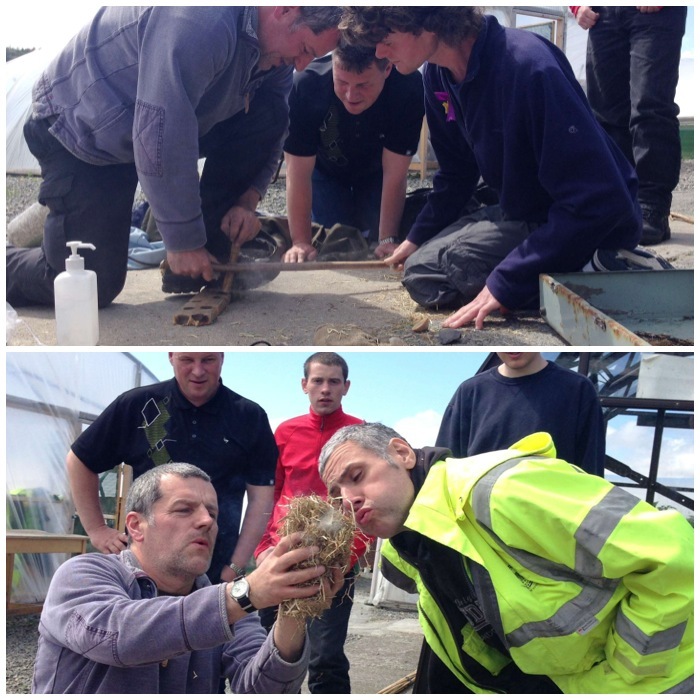 The Masterclass this year was on constructing a Stick Fish Trap. This was planned to take 3 hours but it took most of the day for the students to complete (and for some part of the next day) but it was worth it, These traps are designed to work and do the job of catching your dinner. 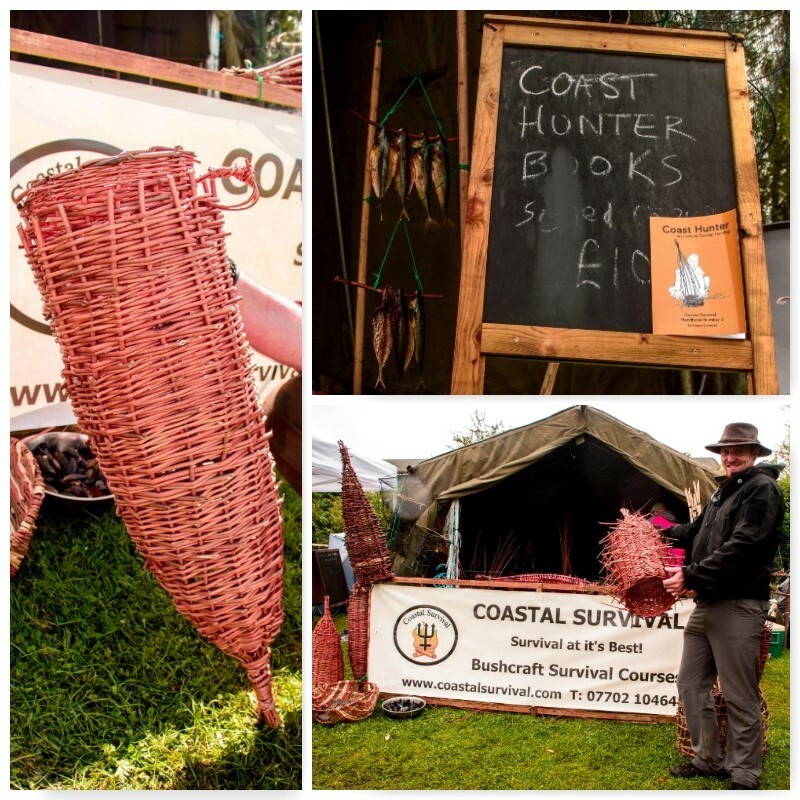 These Stick Fish Traps are featured in Fraser’s new book Coast Hunter. This is the 2nd book in his coastal series and his copies sold out at the Wilderness Gathering. Look it up in Amazon if you are interested in all things coastal hunting. 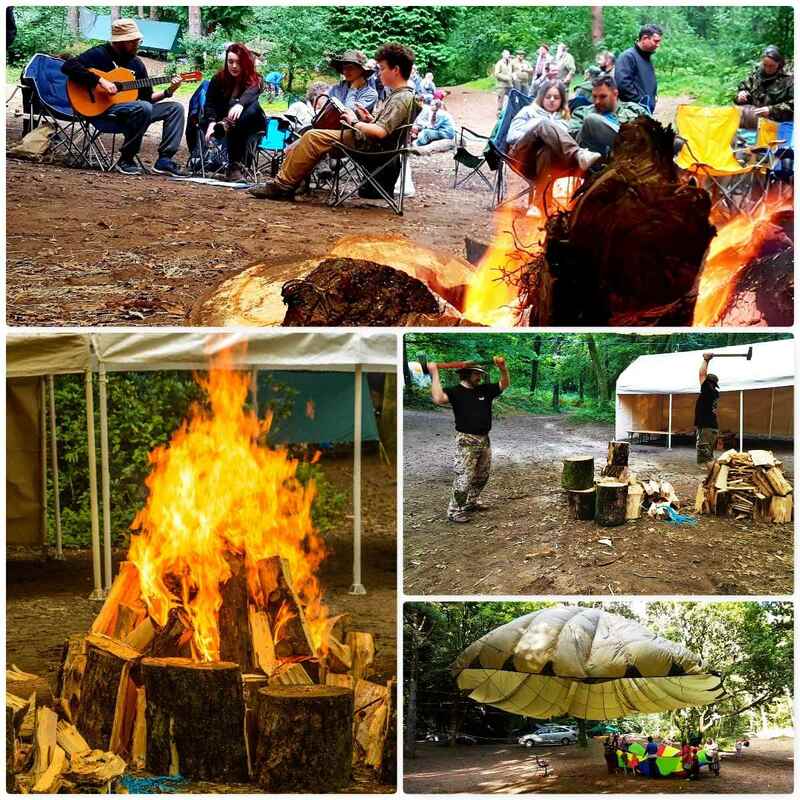 Last August I was at the Wilderness Gathering here in UK with my friends from Coastal Survival. 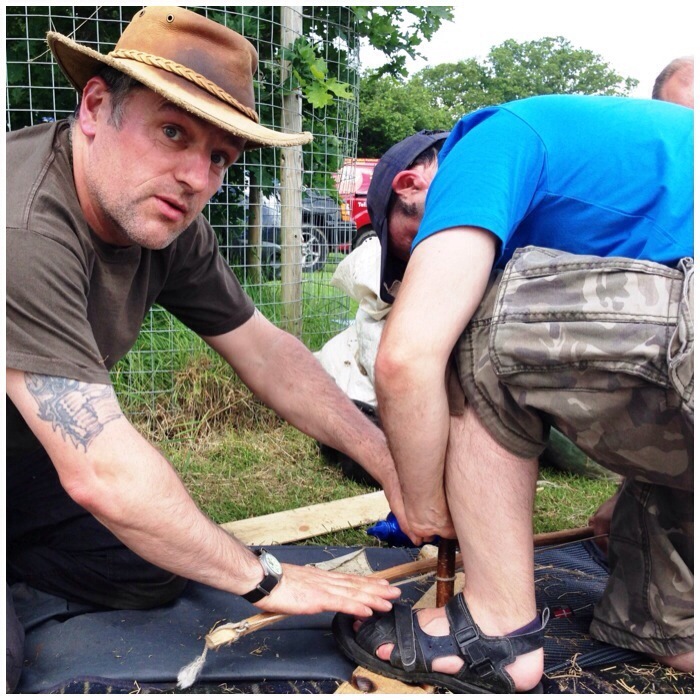 Just across from us was my friend Jason Sears demonstrating the use of a bowdrill to visitors. 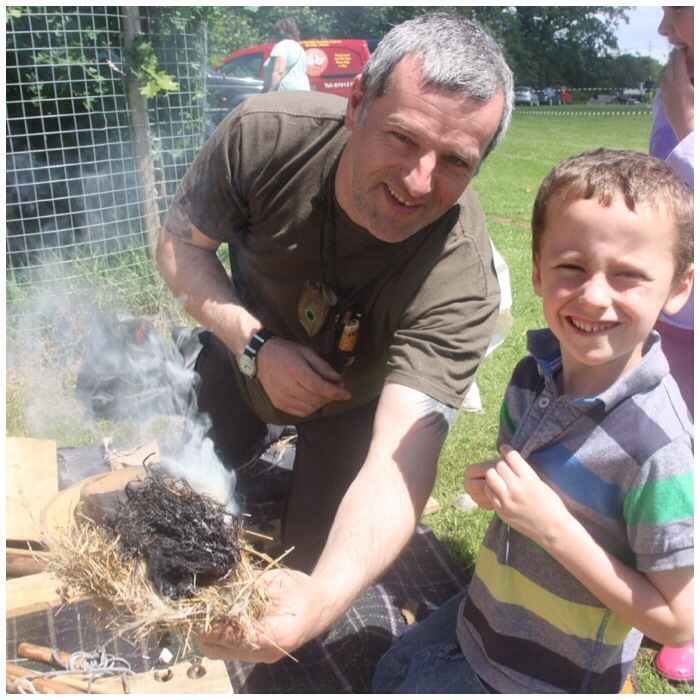 Jason is passionate about fire lighting and passing this skill onto others. I decided to sit back and watch his progress. I cannot remember the combination of wood types he was using but he did spend a minute gently warming everything up with some slow rotations of the spindle. Once he felt everything was a dry as he could get it where the spindle meets the hearth board he really powered up to produce a hot ember. The day had been really wet so all this preparation was essential – all the while he was talking to the visitors explaining what he was doing. 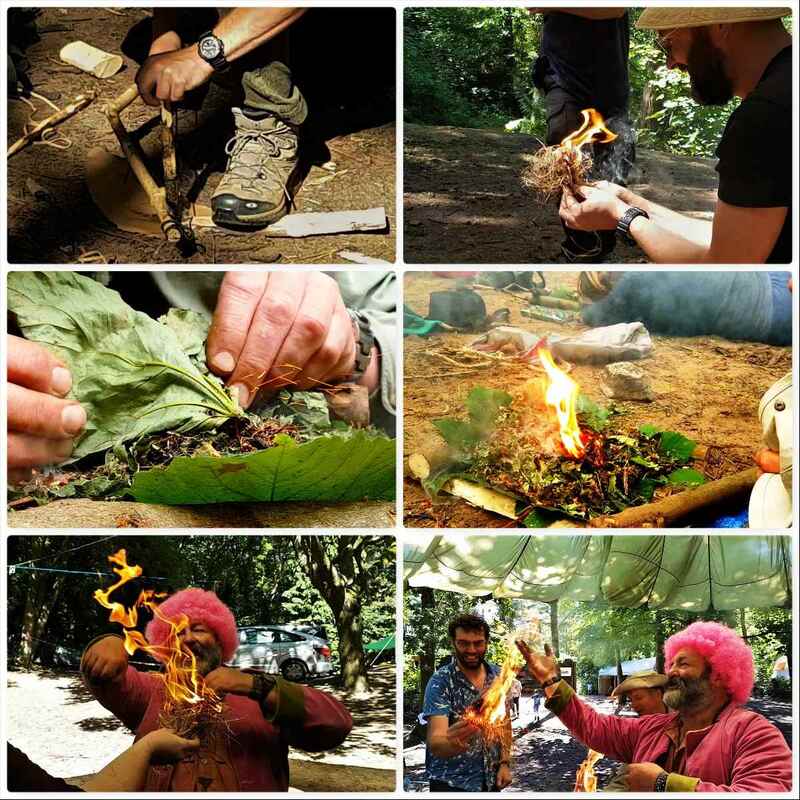 To help himself along in getting his flame Jason had a piece of Cramp Ball fungus (Daldinia concentrica) on hand. He gently laid the piece of Cramp Ball beside the glowing ember to get it alight. This is a handy trick to remember in damp conditions as the ember created from the bowdrill can easily die out if you are not careful. Jason’s straw was also a bit damp so he spent a few moments just drying out the area around the cramp ball by gently blowing into it. 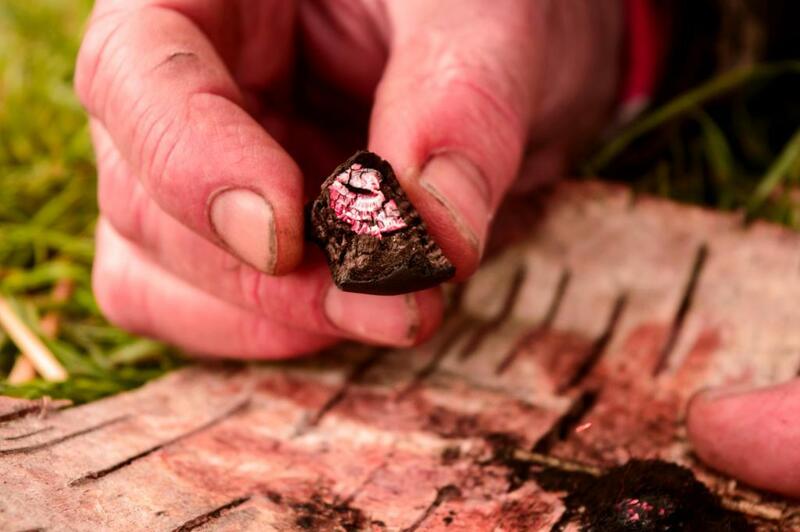 It is at this stage that many embers disintegrate if you are not careful or they simply die out as they are too small to overcome the damp material. Which he did – one impromptu looking candle in fact. 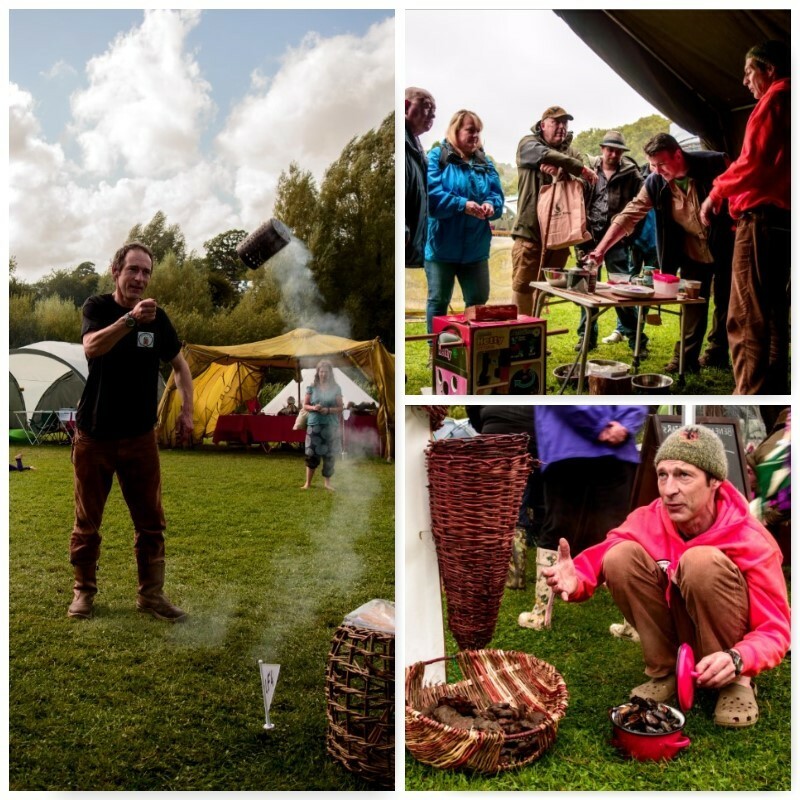 It is always a pleasure to watch Jason at the Wilderness Gathering teaching visitors fire lighting, so if you are thinking of coming along next year check him out. A package arrived in the post for me yesterday from my sister Tina in the Isle of Lewis: our annual treat of Guga. 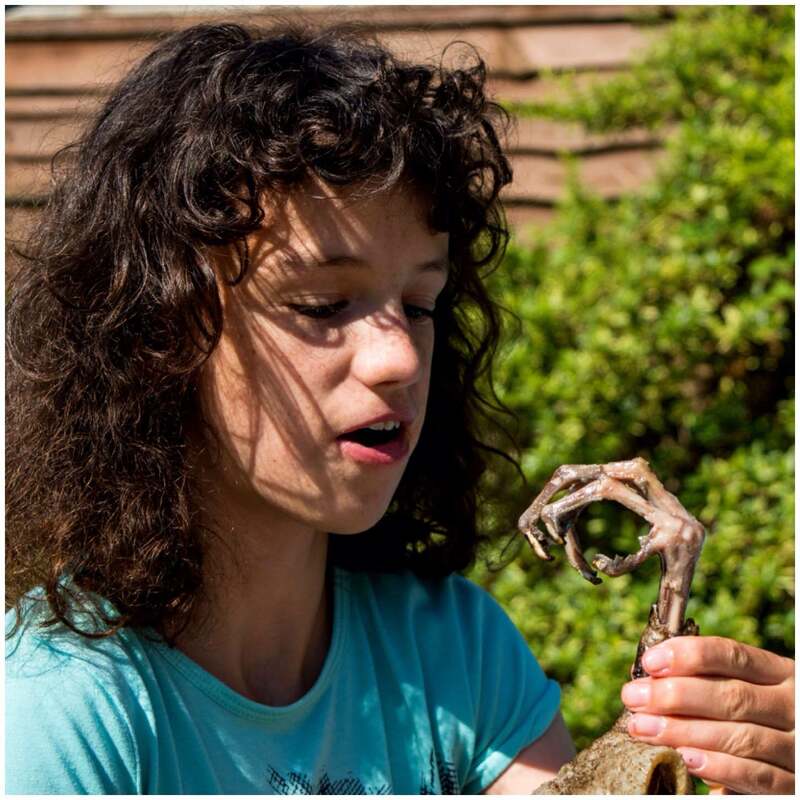 Guga is salted young gannet – my family are amongst those allowed to undertake the annual Guga Hunt to a rocky island called Sula Sgeir off the coast of the Isle of Lewis every August. The hunt is covered by the Protection of Birds Act 1954 – the men are allowed to catch up to 2000 birds a year. 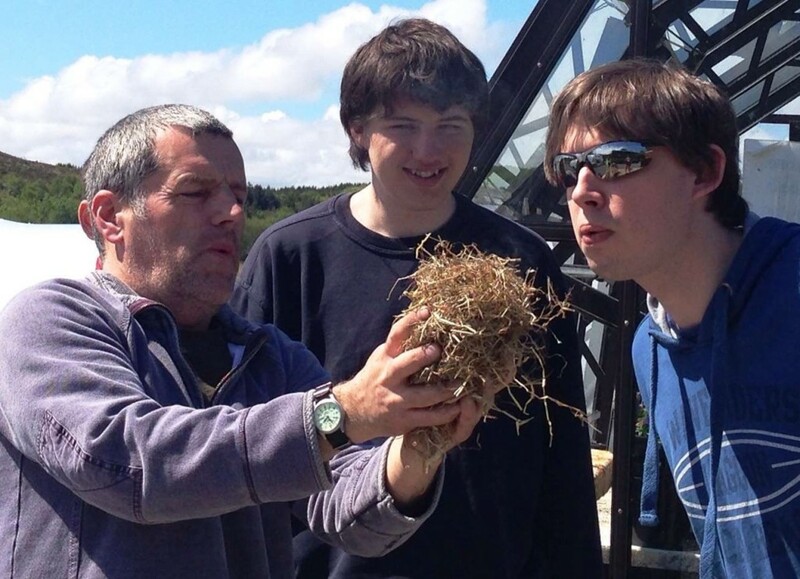 A great description of the whole hunt can be found here – The Guga Hunters of Ness. Guga has a very strong taste and smell (which I love, however my wife Alison is not so keen) so I tend to cook it outdoors. 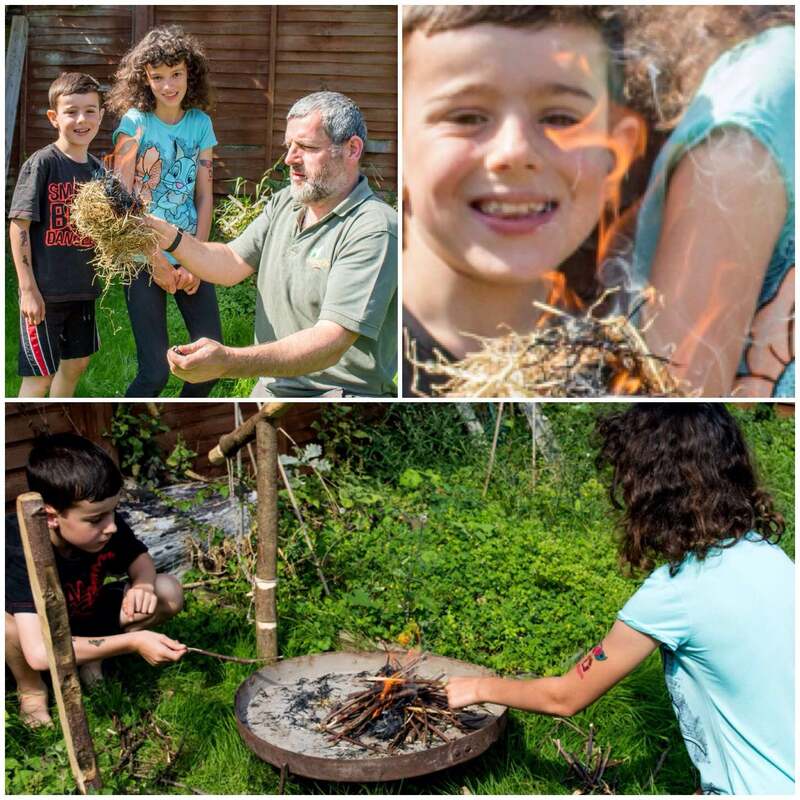 This year I decided to get the kids doing a bit of bowdrill to light the fire and we soon had a good ember going. 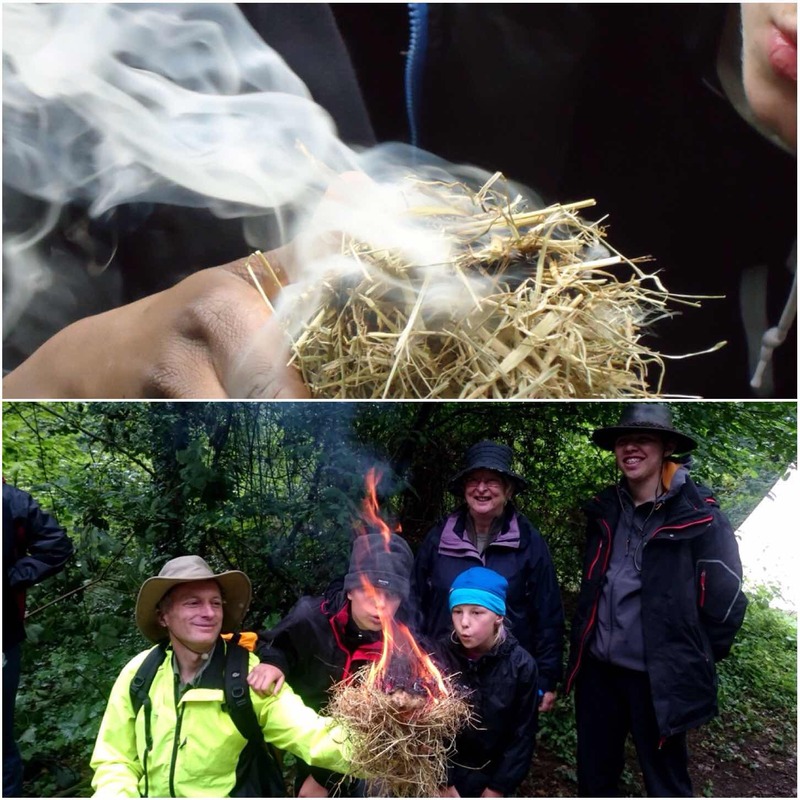 Next the ember was popped into a bundle and then we took it in turns to blow into it to spread the ember so that it would catch. 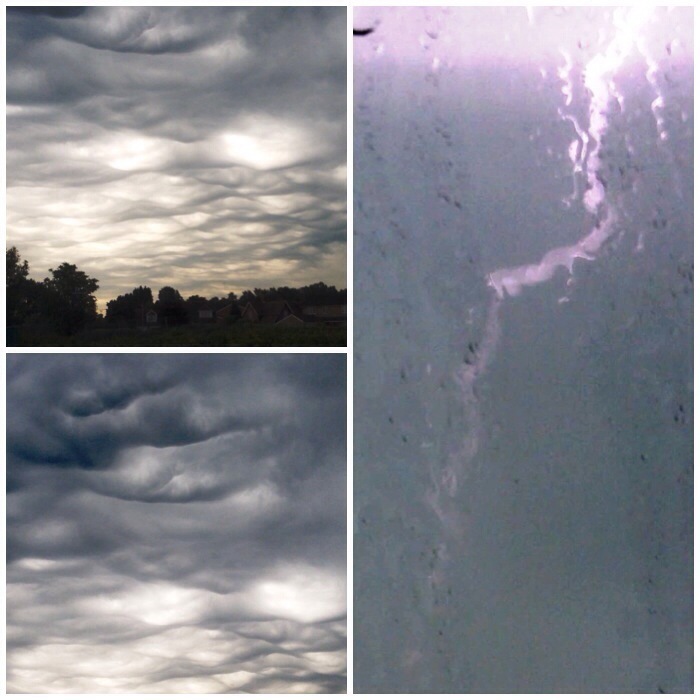 In no time we had a bit of flamage and I think in the top right picture below we got an appearance from Daffy Duck – can you see him? 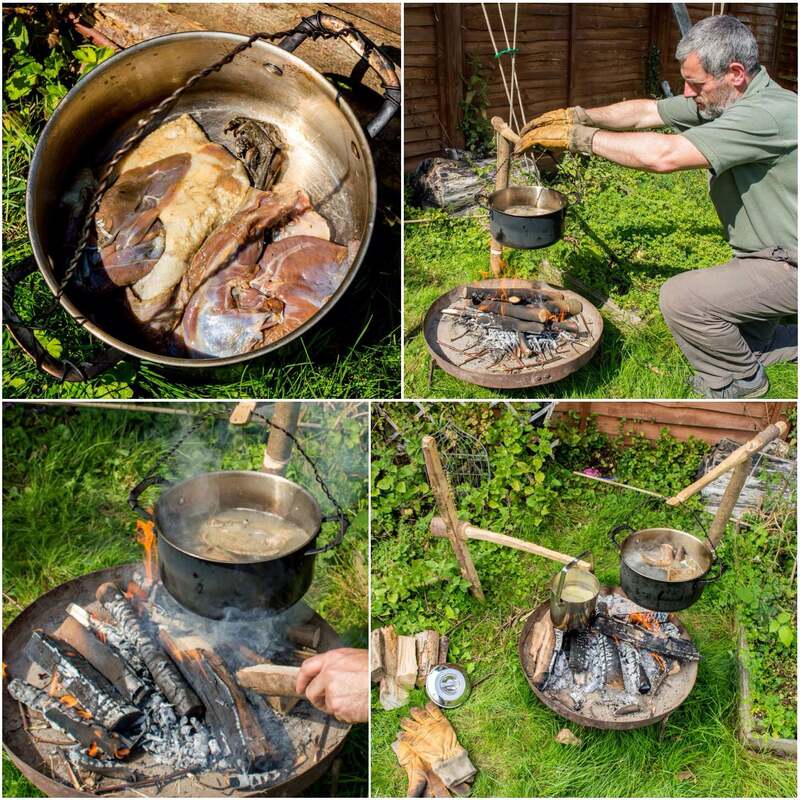 The Guga gets boiled for an hour with one change of water in that time (due to the salt, oils and fat). After half an hour I put the spuds on as well. For this meal I used two different cranes. The Guga was hung on my Mortice and Tenon crane (I have not blogged on how to make this crane yet) and the spuds went onto the Lap Joint crane. Both are ideal for this type of cooking as I could easily adjust the heights of the pots to control the rate of boiling. After an hour all that was left to do was to eat the Guga and spuds. 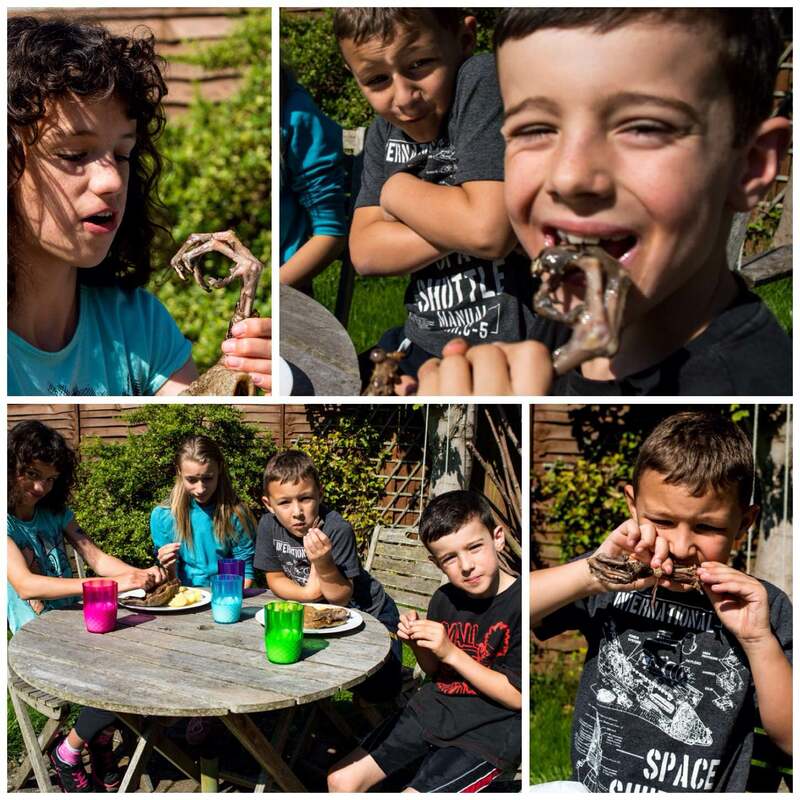 The kids had their friends round and they liked the Guga meat but would not ‘sook’ on the claw. Catherine and Finlay were introduced to the Guga as babies by sucking on the claw (this tradition dates way back in time) so they love the taste of it. 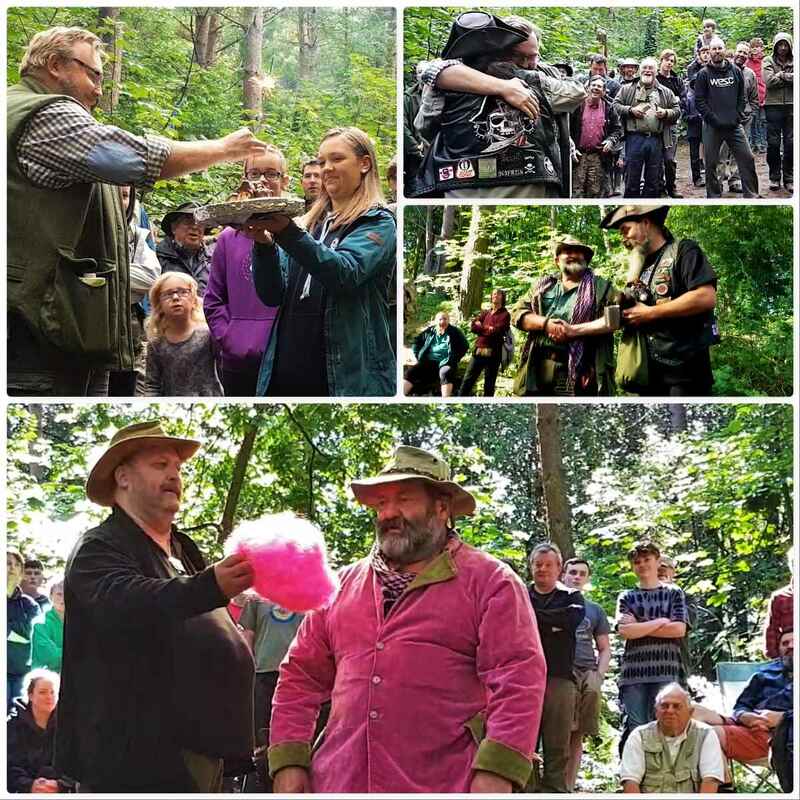 Thanks to my sister Tina and my brother Finlay for sending me my annual Guga and to Uncle Dods and the rest of the crew for making the trek once again to catch them. 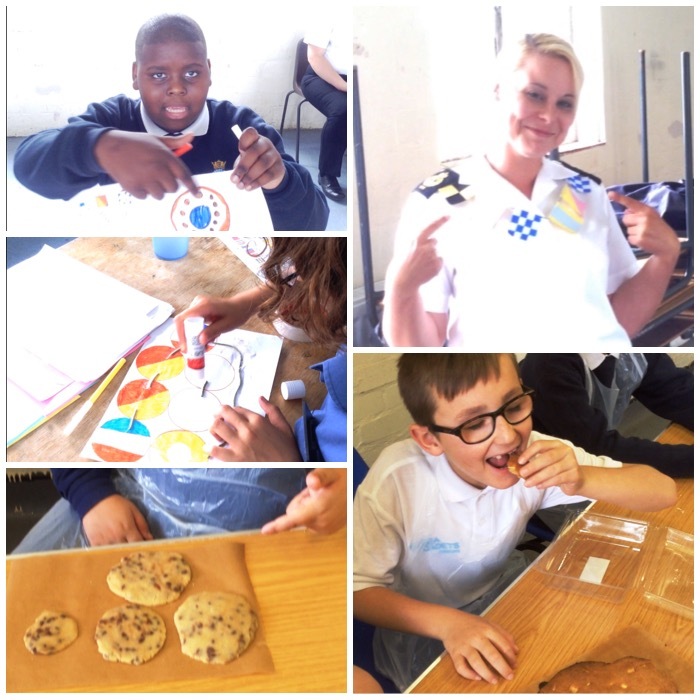 Meet our Junior Sea Cadets from London Area – Cadets who love to learn by having fun. 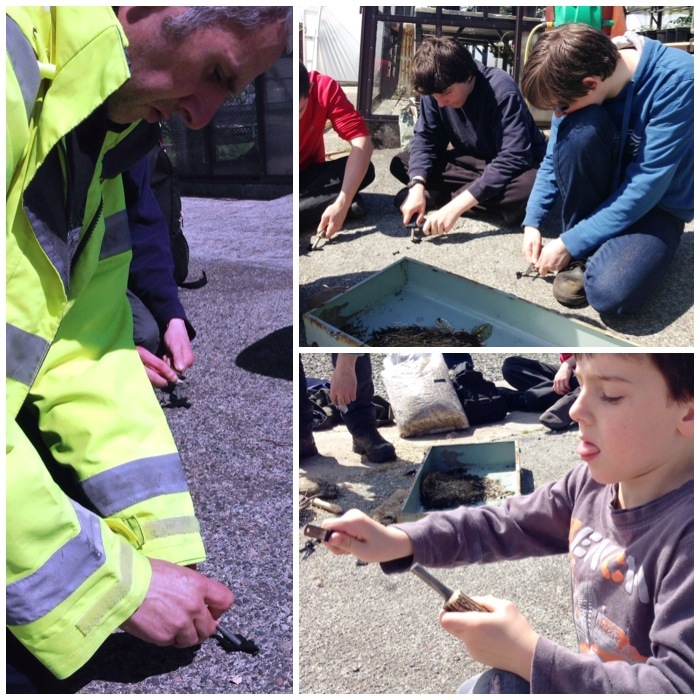 A year or so ago my friend Lt Cdr (SCC) Mark Weston invited me along to help out on one of the weekends he organises for our Junior Sea Cadets. 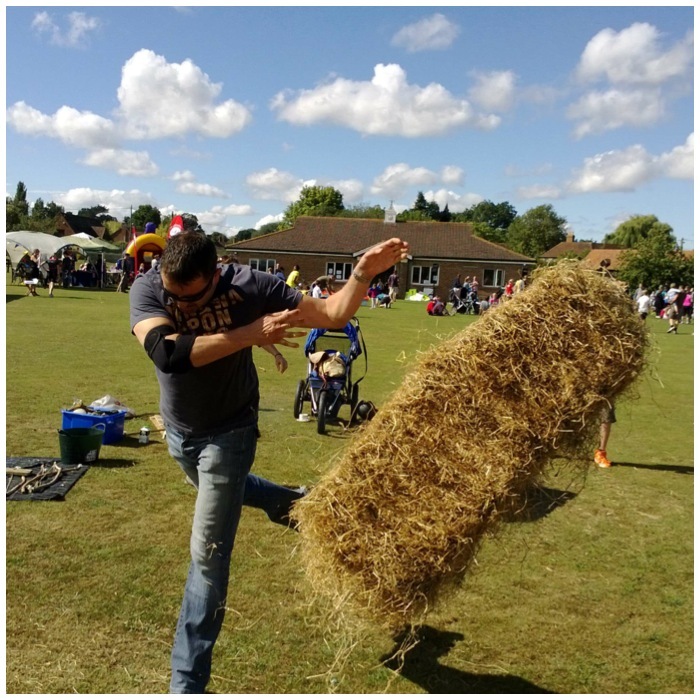 Mark believes that it is sometimes good to bring these youngsters (10 and 11 year olds) away on training weekends where they can learn in a fun manner but not have the prospect of an assessment hanging over them at the end of the weekend. 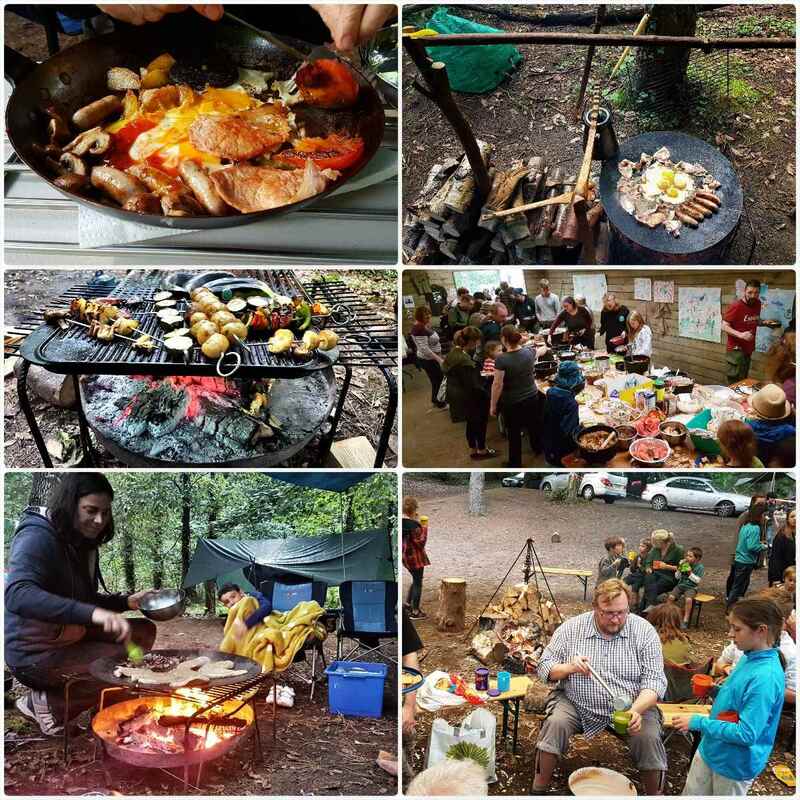 I was hooked on these weekends from the start as the Juniors undertake a number of different activities to learn new skills and I get the chance to play at bushcraft with them. 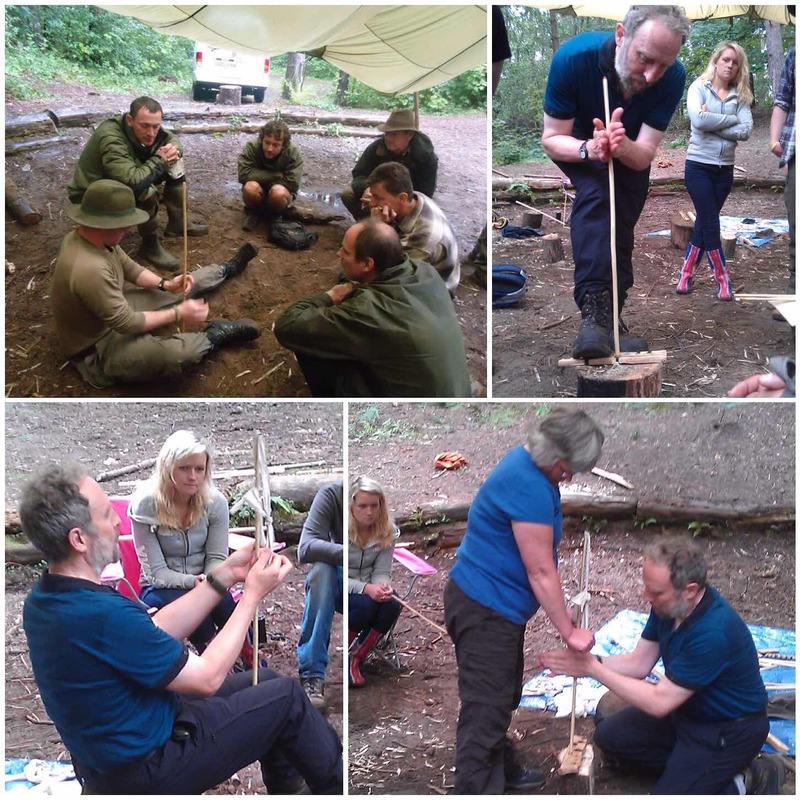 I was joined on the weekend by my friend Dave Lewis to deliver the bushcraft class in the woods. 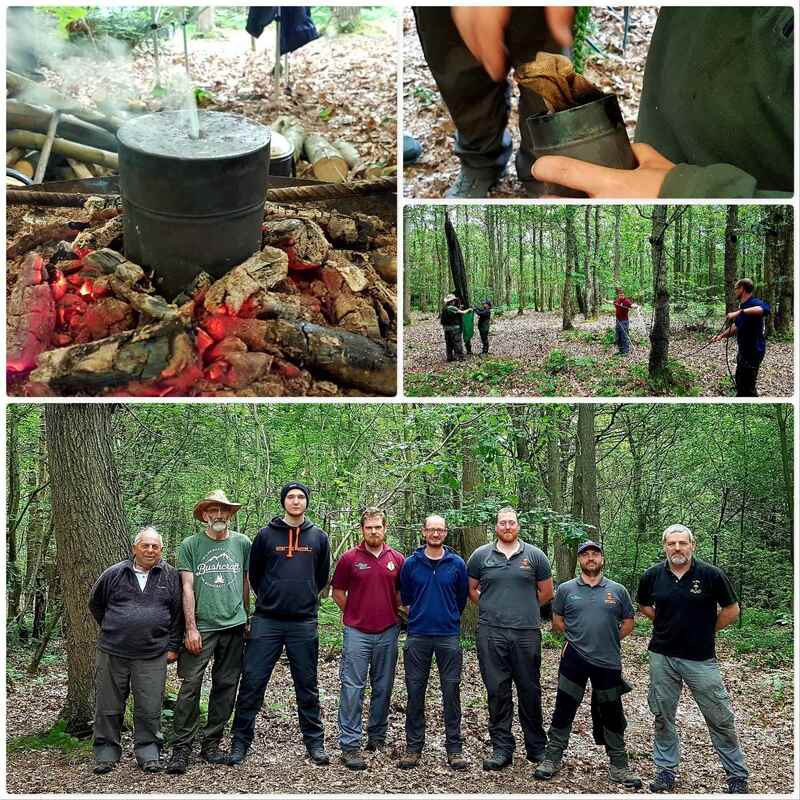 The training was conducted at Crowborough Army Camp but thankfully this time we got access to the ajoining woodland where we are allowed to light fires. 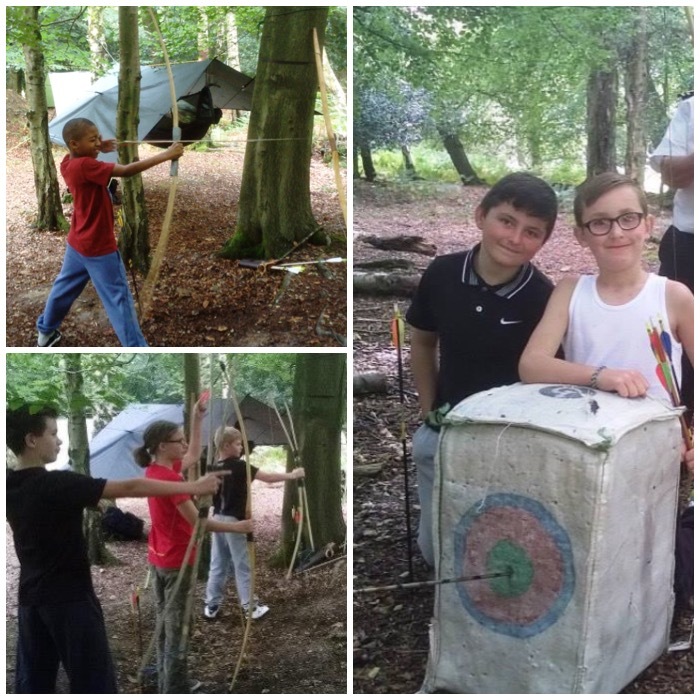 Many of the Juniors had never shot an arrow before but after some tuition they were pinging them down range as quick as they could. One little lad was so chuffed as he got the tiny bull’s eye on one of the targets. Dave and I took it in turns to deliver different classes as we got a group of about 6 Juniors at a time for about an hour and a half each time. 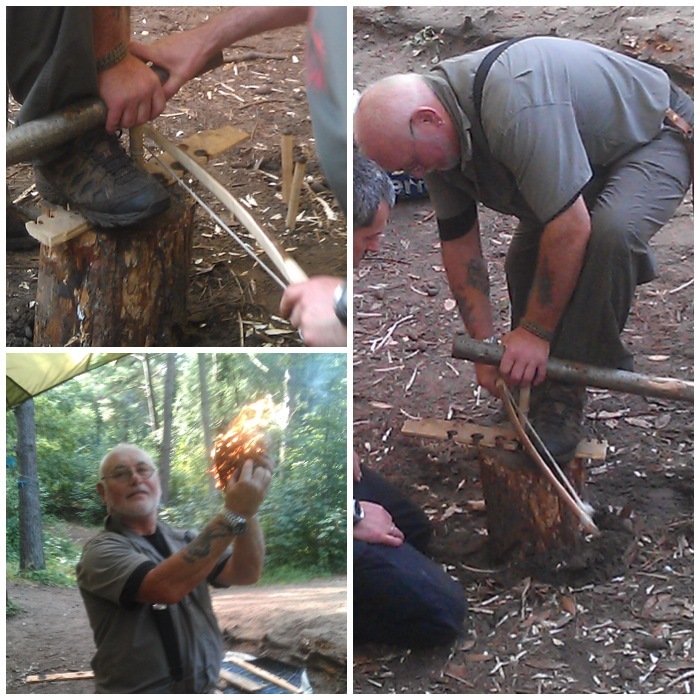 So while I was doing archery Dave was teaching half of the group how to use a firesteel properly and then how to build a proper fire. I collect Fire Faces from images I see in the flames but the best faces are always found on the owners of the flame. 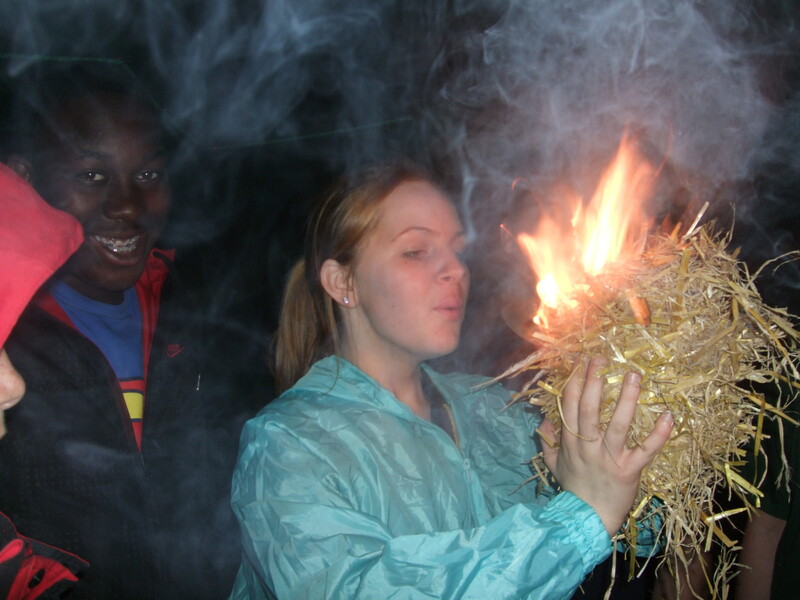 Even Mark helped out with the fire lighting and I think his face says it all. 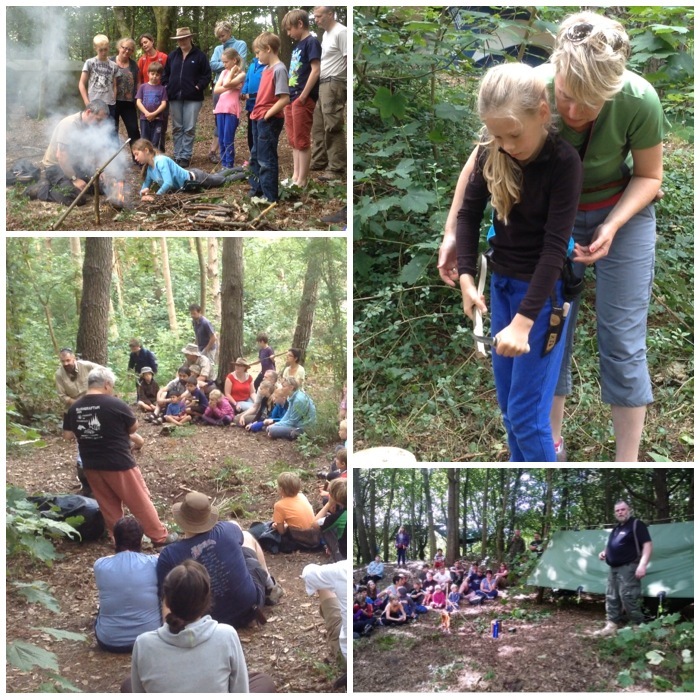 While we were having fun in the woods, other instructors were running courses back in the main camp. Here you can see Kay modelling some of the signalling flags the Juniors had designed in her class. Also Sam and Lorraine ran a very busy and successful cookery class where the Juniors made some rather delicious biscuits (I know – I tried a few out). 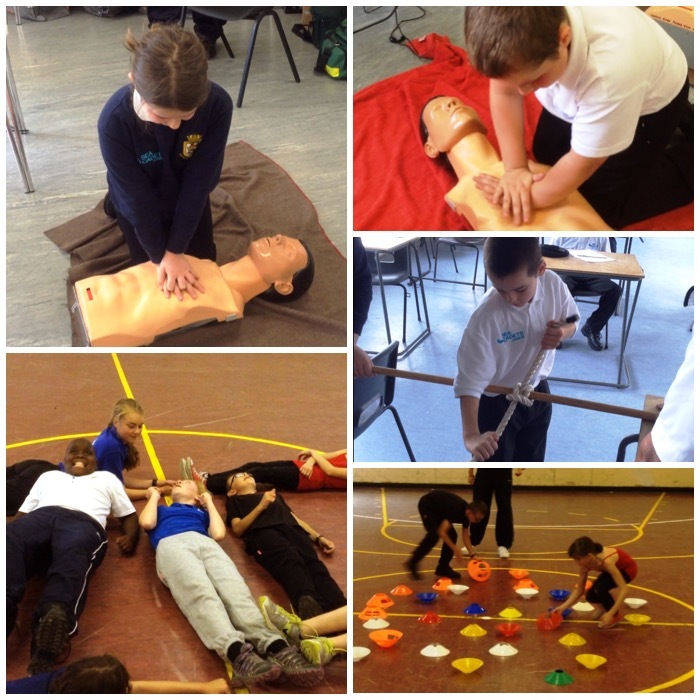 Every Junior took part in the First Aid class with Keith and learnt about CPR and got themselves a signed certificate to confirm this. 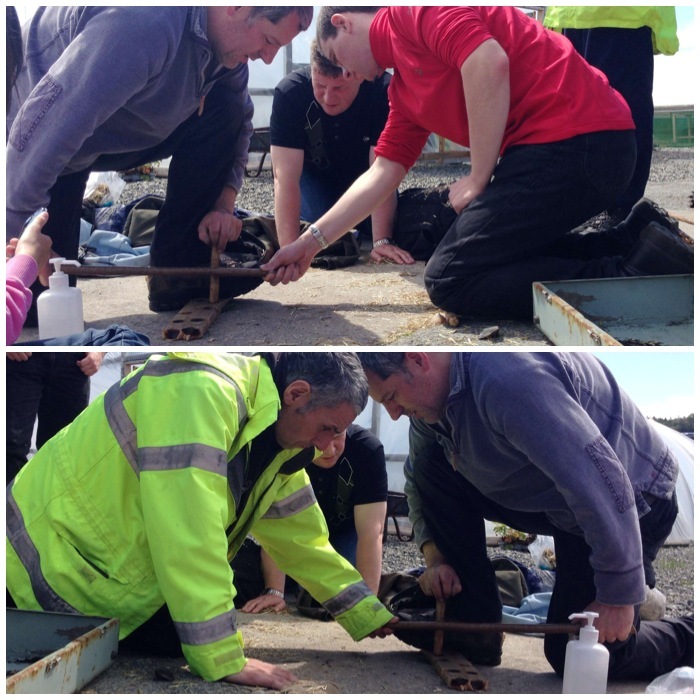 A Sea Cadet course would not be complete without a seamanship class so Alan and Nigel were kept busy teaching all the Juniors about bends and hitches. Up in the gym Darren our PTI kept the Juniors running around all day with fun classes to use up all their excess energy. 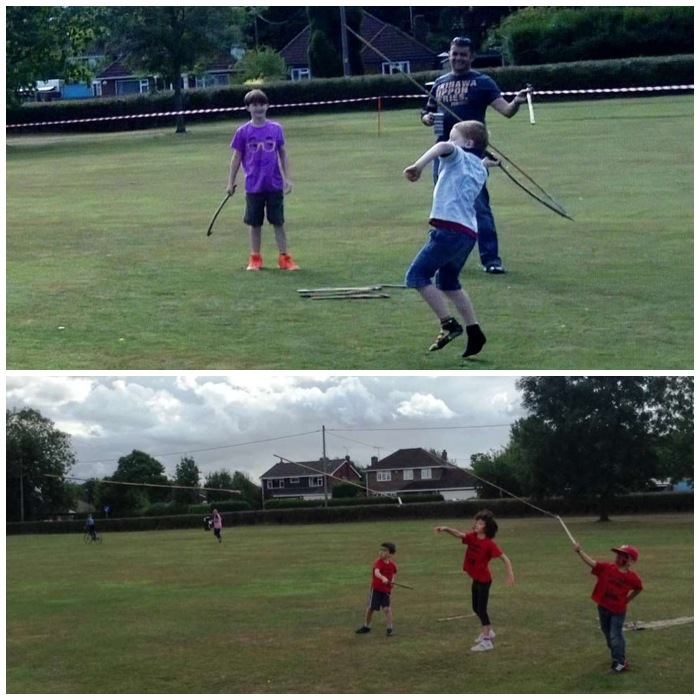 On the Sunday all the classes were up in the camp and included the ever popular Atlatl class. This skill has become a popular one to learn as the older cadets are now marked on this in the Chosin Cup competition held annually by London Area Sea Cadets. Dave ran this class leaving me free for some time to concentrate on getting these pictures and capturing some video of the weekend. 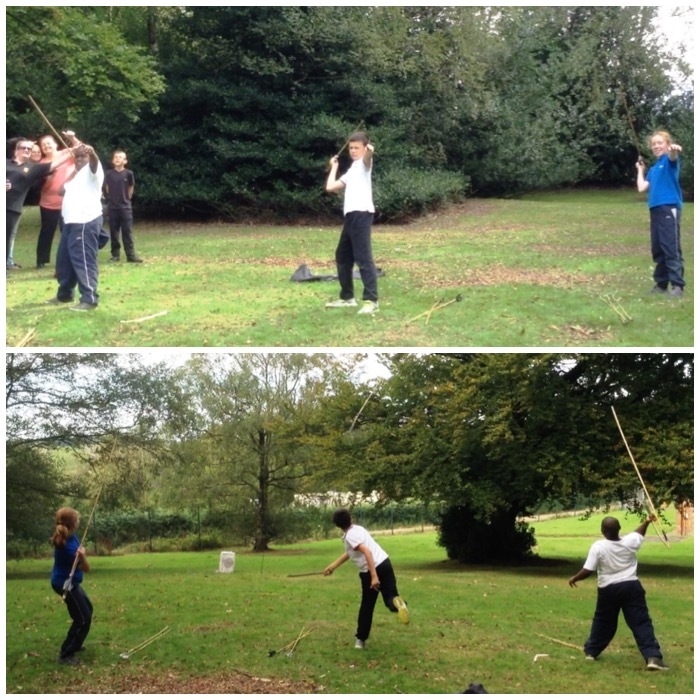 As some Juniors were doing the Atlatl others were in the gym with Darren competing against each other doing lots of games. I got some of the Juniors and staff together that morning to do some relay bowdrill. I didn’t have time to run this with all the cadets but those that did had a great time. I put together two videos of the weekend. The first one shows all of the activities the Juniors undertook and was partly filmed by Deputy Area Officer (London) Lt Cdr (SCC) Cliff Lewis while I was teaching. The other video shows the relay bowdrill I did with the Juniors. This was an experiment and as it was successful I will be using this technique with them again. Thanks to Chrissie Weston for filming much of this. This was a great weekend and Mark has gotten a winning formula with the variety of classes the Juniors get to try out – I am looking forward to the next one in late spring next year. I was taught a few years ago by my friend John Rhyder of Woodcraft School about a version of bowdrill that uses an extended bearing block. Below you can see my friend David Jones using the set up on a piece of wood. Dave wanted to try this method out as he had (if I remember correctly) some problem with his knee. As he could stand straight on one leg and did not have to grip the bearing block too tightly, he quickly found he could get an ember and then flame. To make the bearing block you need a decent length of branch. 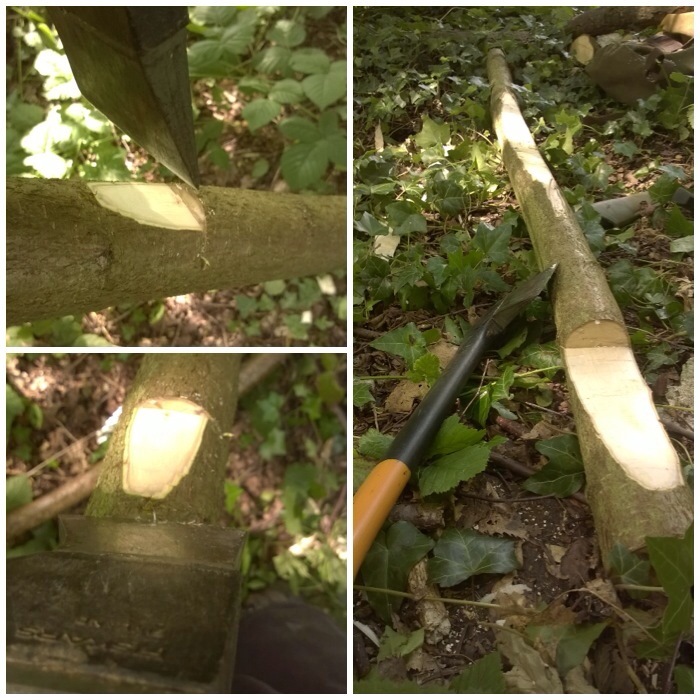 I used a decent sized piece of hazel just over a metre long to act as my long bearing block. I then axed out a point on one end of the bearing block, to be jammed into the ground when in use. I marked a slight cut with my knife one handspan (outstretched little finger to outstretched thumb) away from the other end of the bearing block. Then, using my saw, I cut into the bearing block a stop cut, about a third of the way into the wood. Being very careful and using small chopping motions I cut out the excess wood to make my recess for the drillpiece to be attached. As you can see from the picture below right, I have come back quite a way to the end but not all the way. 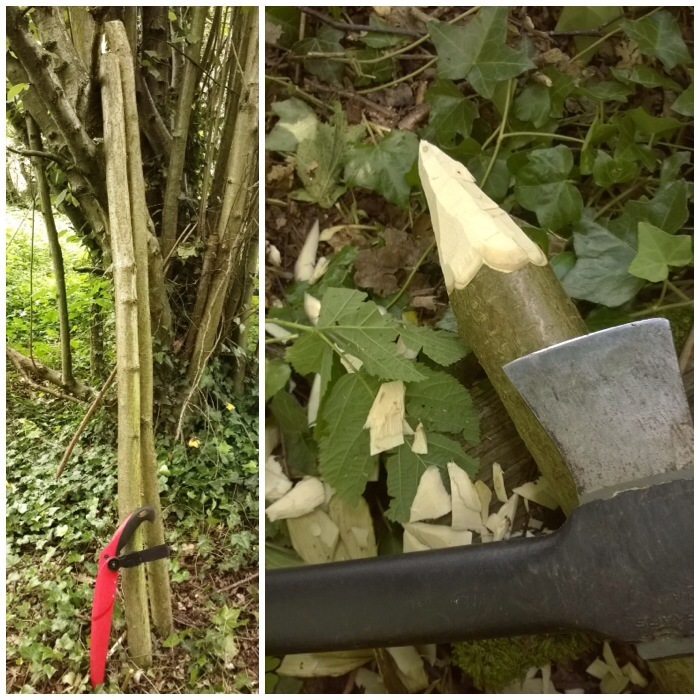 Please ensure that the sharpened tip is well dug into the ground when you do this axe work and always make sure you know where your fingers are in relation to the axe when working. I have had a few near misses doing this when I am not paying close enough attention. 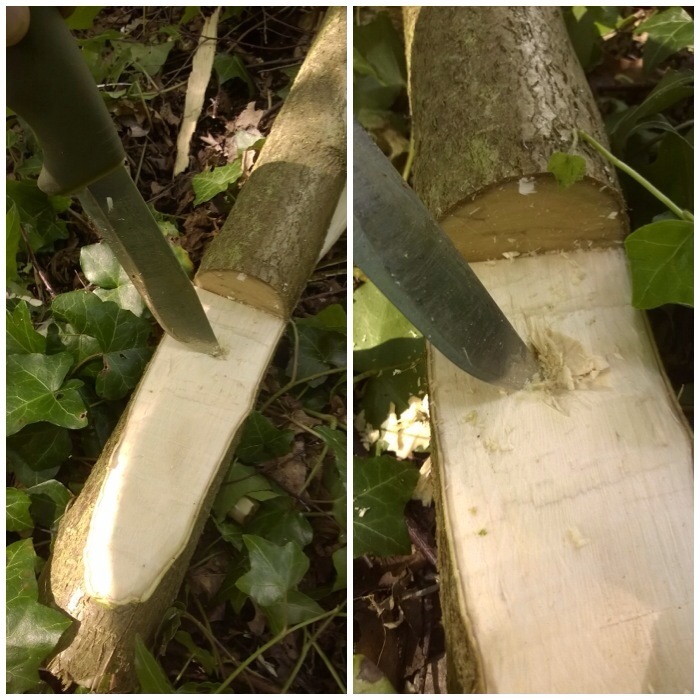 An alternative method is to cut a longer limb to create a safety handle, which can be sawn off after you have axed out the area. While the bearing block is flat on the ground, use the tip of your knife to make a small hole near the stop cut. This hole will be used to keep the drill piece in place. Having seen someone put a knife through their hand while doing this, I can tell you just how important it is to make sure that the bearing block is flat on the ground and the hand securing it is well clear of the tip. The rest of the set up is similar to a standard bowdrill. I commonly use this method with the Egyptian set up, assisting a person or as a relay race. In the video below I show you the method where I am assisting someone and also as a relay race. 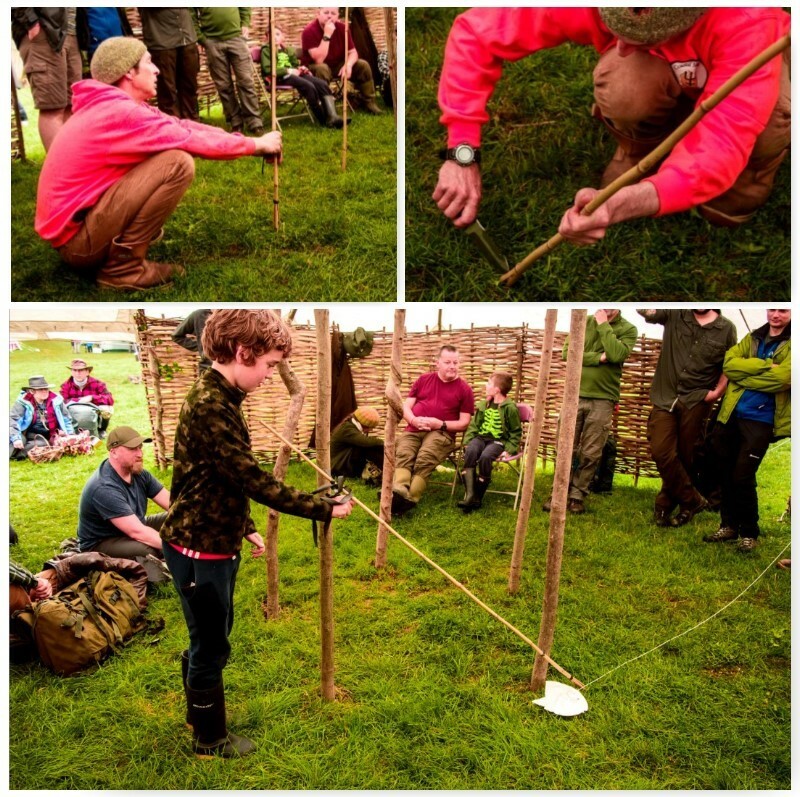 This method is one I would urge any bushcrafter to try out, whether it’s just to try something different, help someone learn the art, or if you (or someone you know) have an injury that makes the standard set up difficult. 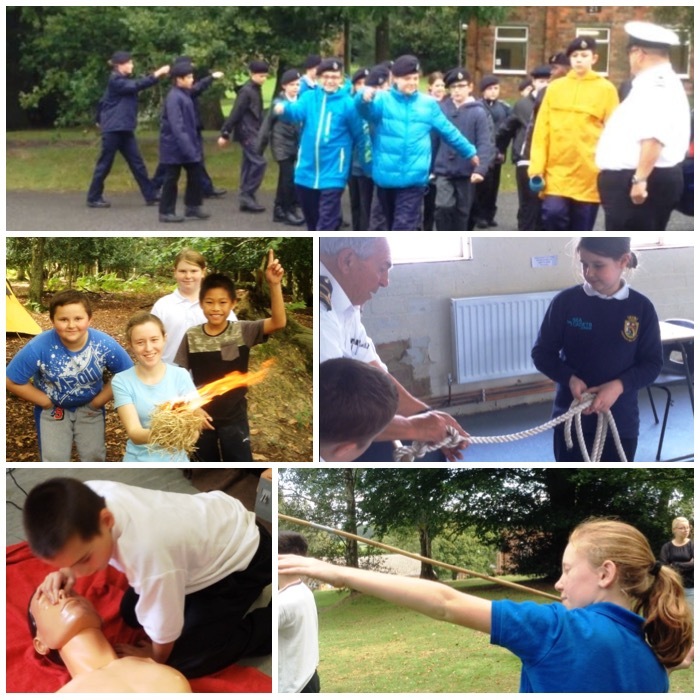 As an instructor in the Sea Cadets, I find this is a stable platform for getting the younger cadets involved as well, be that with an instructor, as a group or on their own. 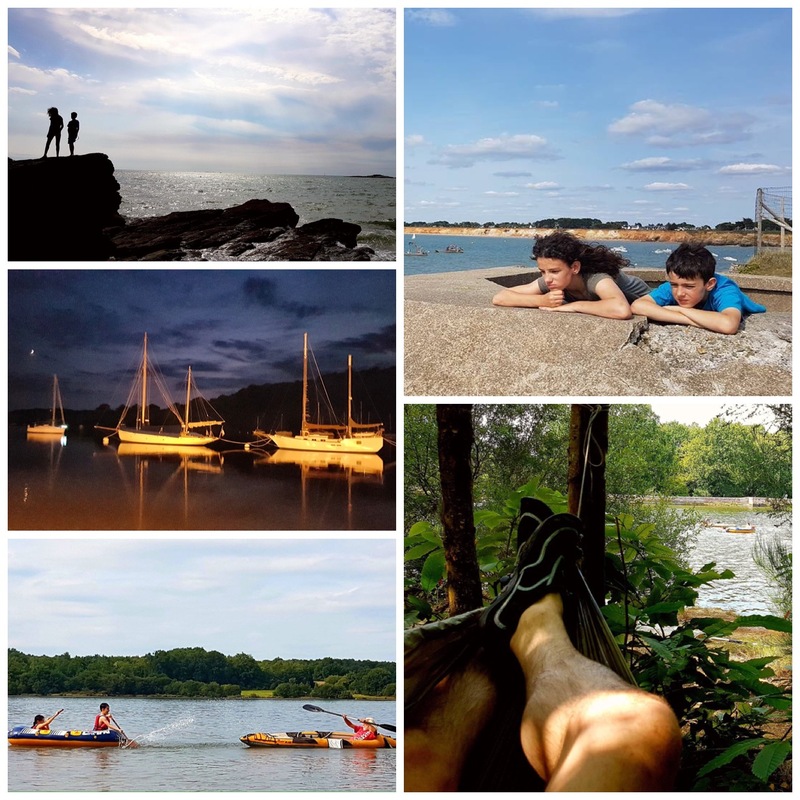 My 100th post – it seems like only yesterday that I was tentatively writing my first post way back at the end of last September. 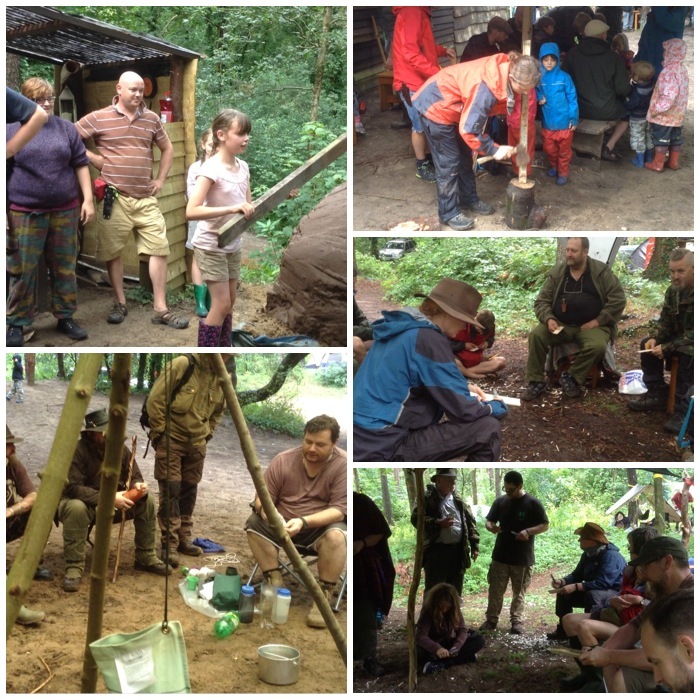 For this 100th post the subject couldn’t be anything other than this year’s Bushcraft UK Bushmoot. 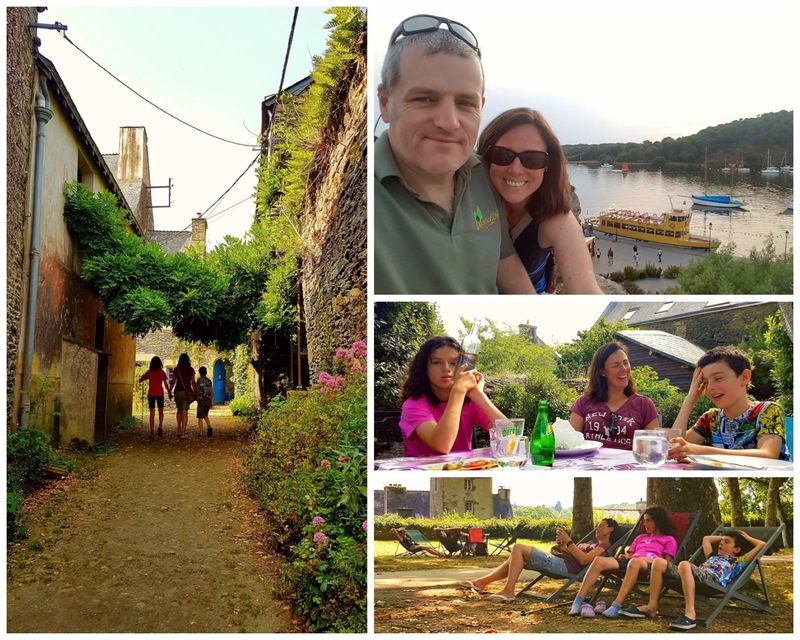 I came back from holiday in France on Saturday the 2nd of August, unpacked then re-packed and headed out with my two kids Catherine and Finlay to Merthyr Mawr in South Wales on Sunday the 3rd of August. 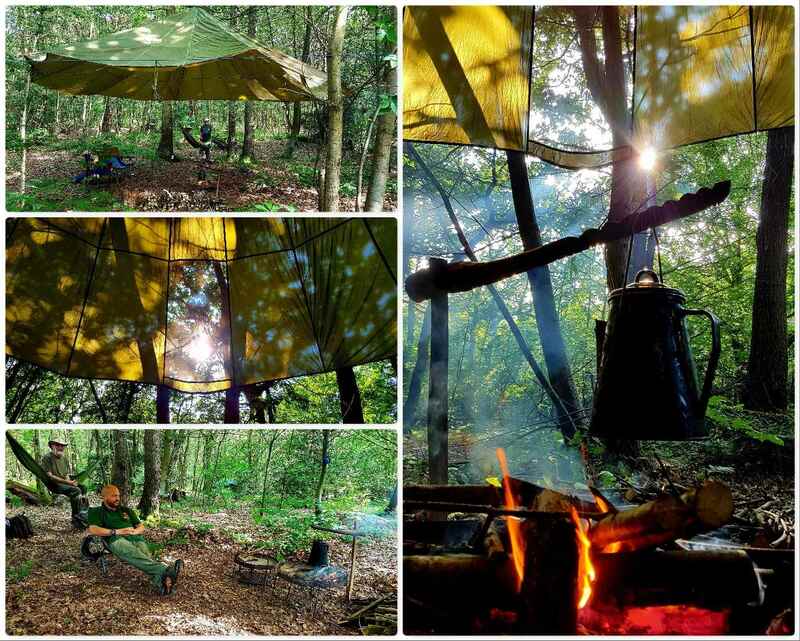 Unluckily I had been beaten to my usual camping spot at the Moot by another family but managed to set up nearby with my tipi, kitchen tarp and my hammock stand. I found a fire guard lying in the sand and after digging it out used it around my fire. It was quite a well engineered piece and I could not understand why anyone would have discarded it. 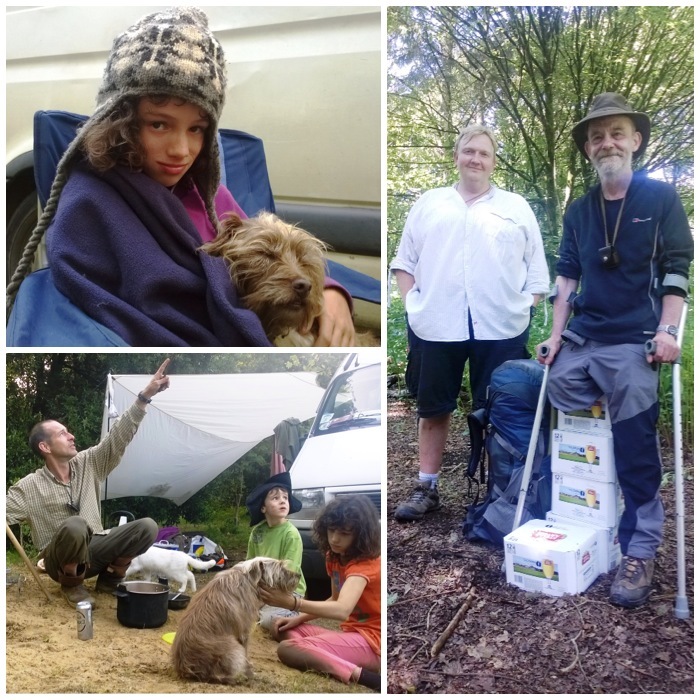 The first few days were mostly spent chilling out with the kids before eventually getting around to putting up the workshop tarps and parachutes. 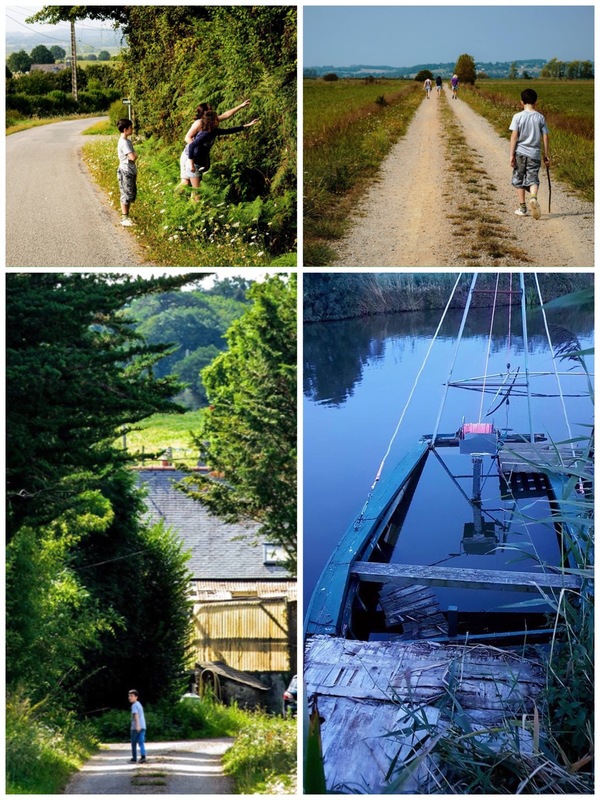 This was the first year I had taken my children to the Moot and they took to it like ducks to water. 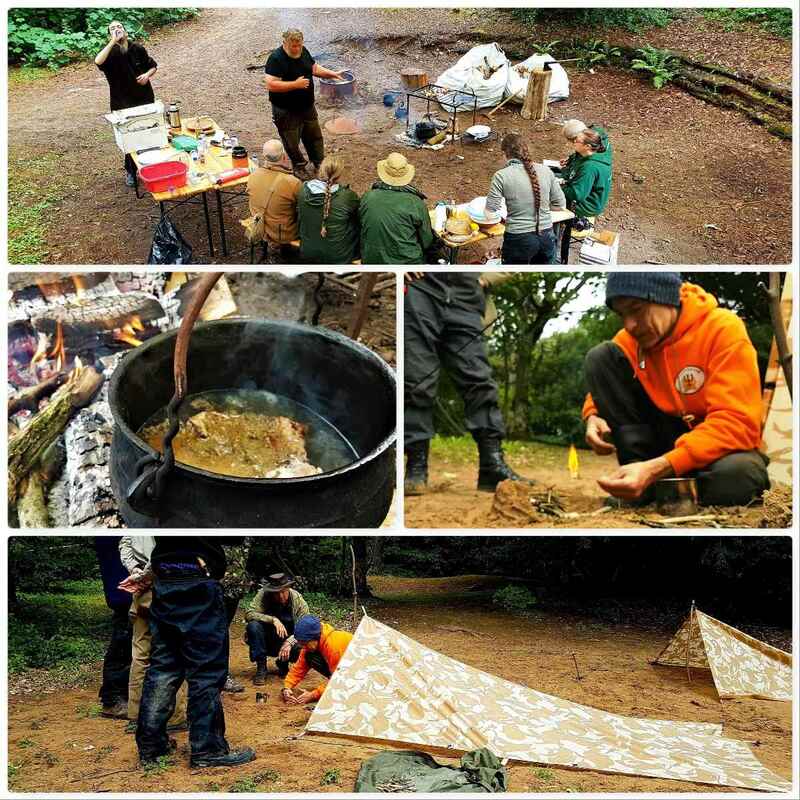 For the first few evenings we had dinner with Fraser from Coastal Survival over in the sand dune area so preparing the evening meal was never an issue for me, thankfully. I could not resist taking this shot of Stu when he arrived in a taxi and we unloaded his supplies for the Naughty Corner. It was at this time that my daughter started feeling unwell with a high temperature and feeling very faint. For the next few days she would sleep a lot in her hammock and eat very little. I thought it was just one of those 24 hour bugs but it turned out to be quite a nasty virus and really laid her out. This is the first of five videos I took while at the Moot and shows the set up and some of the first courses that were held. It was good to see all the new growth on Drew’s tree that had been planted last year. People have been leaving little tributes on the tree over the year which I thought made it look very special. While Catherine was feeling a little better she would come out and play with the other kids while she could. She never met Drew but I am sure that they would have gotten on with him like a house on fire. 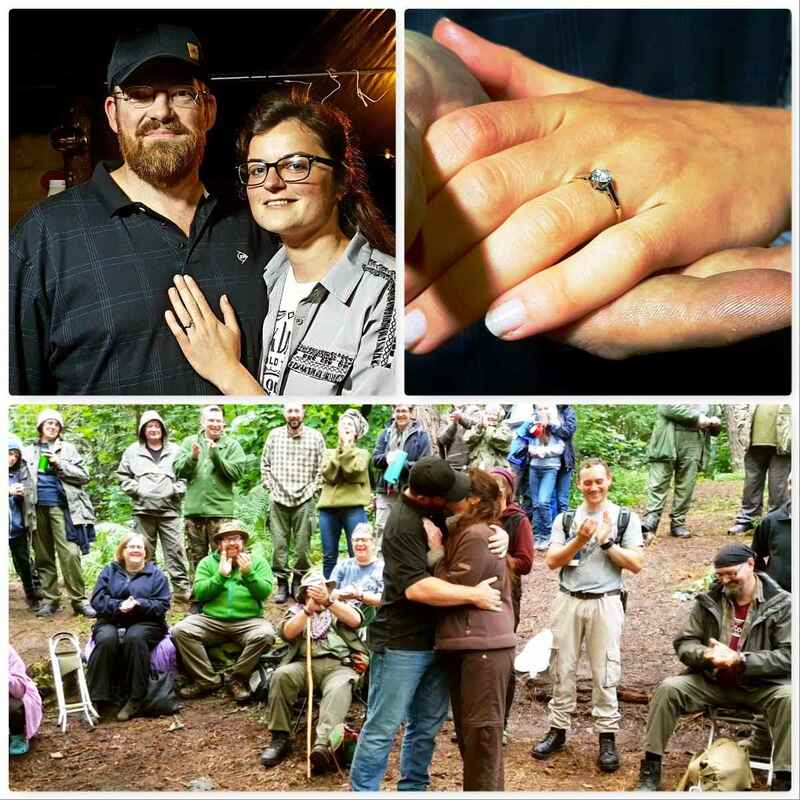 Drew loved to run role-playing games with the kids at the Moot and Catherine and Finlay love these types of games. Before the main Moot started a number of other courses had been organised. 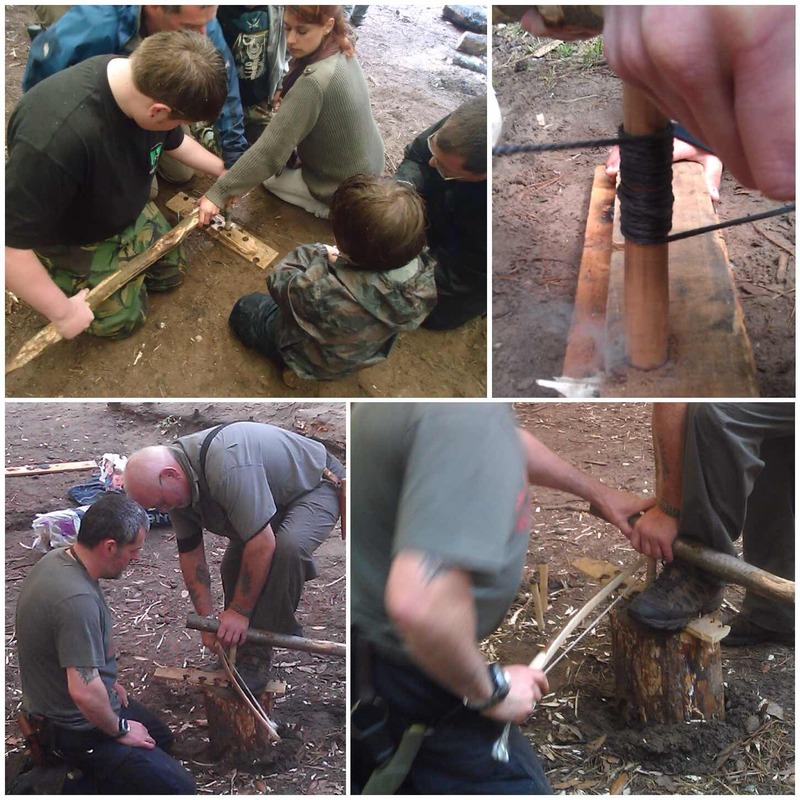 These included Bhutenese bow making with Wayne from Forest Knights, leather working with Eric Methven, green wood working with Bob from the Rural Skills Trust, and the Coastal Hunter course with Fraser of Coastal Survival. The first course I was involved in was the Starter Course. 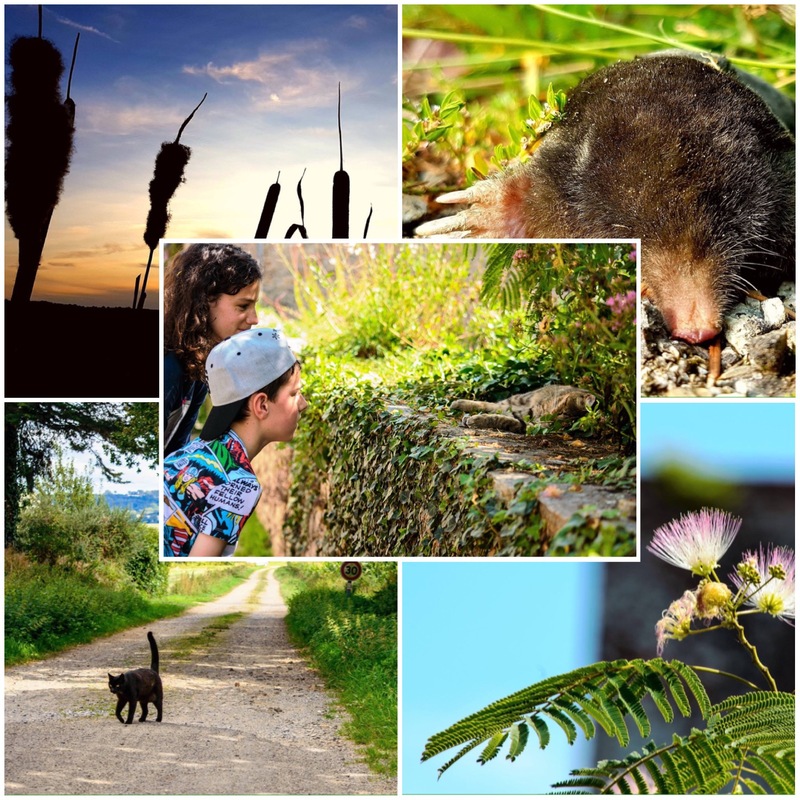 I have written a separate post on this course on the BCUK forum and you can read about it here – Bushmoot Starter Course. This is the second year we have run the course and it is starting to prove very popular now. 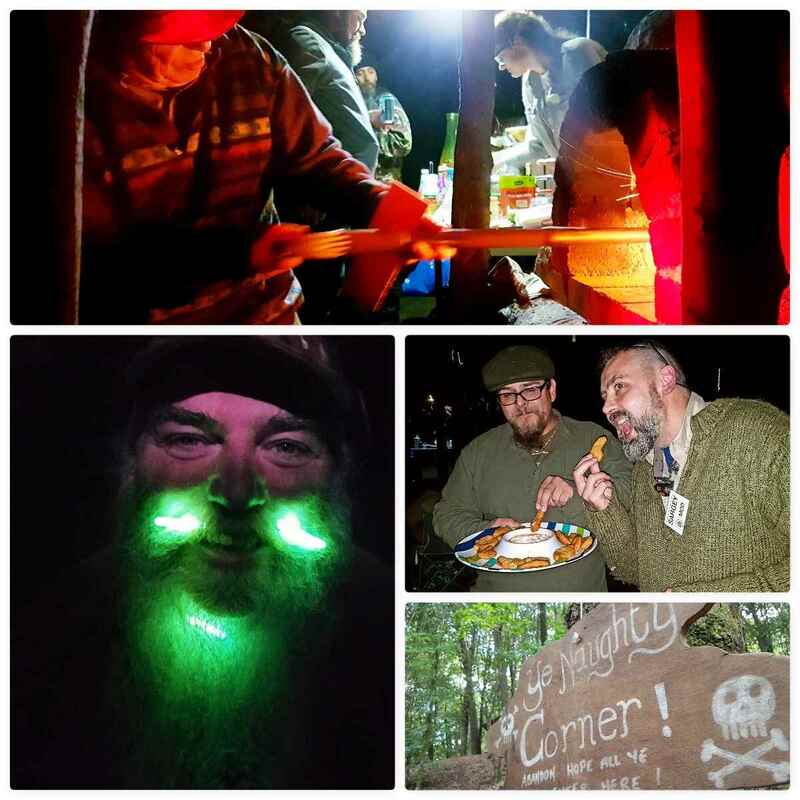 Over three of the nights I was at the Moot there was some great entertainment. On one night some of the lads from the Naughty Corner came down to the main sandpit area and had a great jamming session. Apart from filming them I recorded a couple of their tracks and then used them as backing music for my second video. Tony, the organizer of the Moot, even got himself some birthday cake on the night. 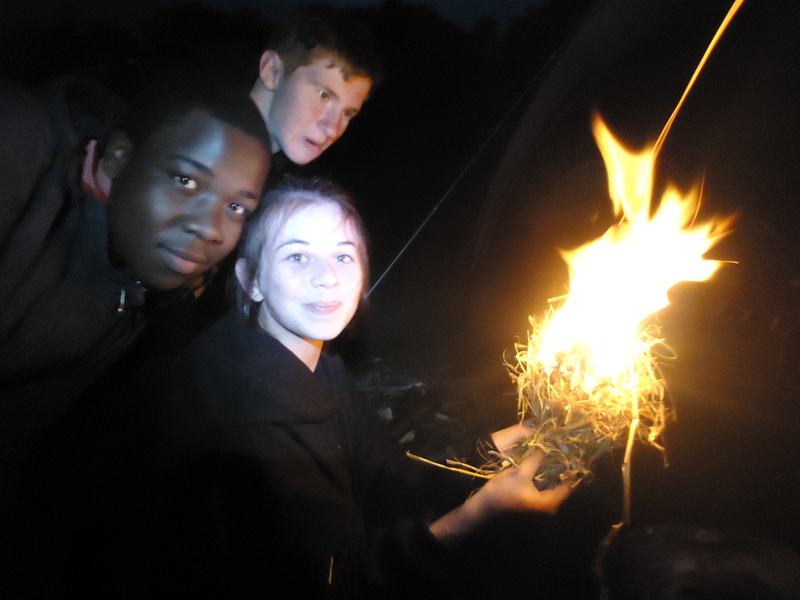 The other two nights we were treated to an amazing fire display by Emily, Liesl and Naomi Cook. These three young ladies are very talented and brave. 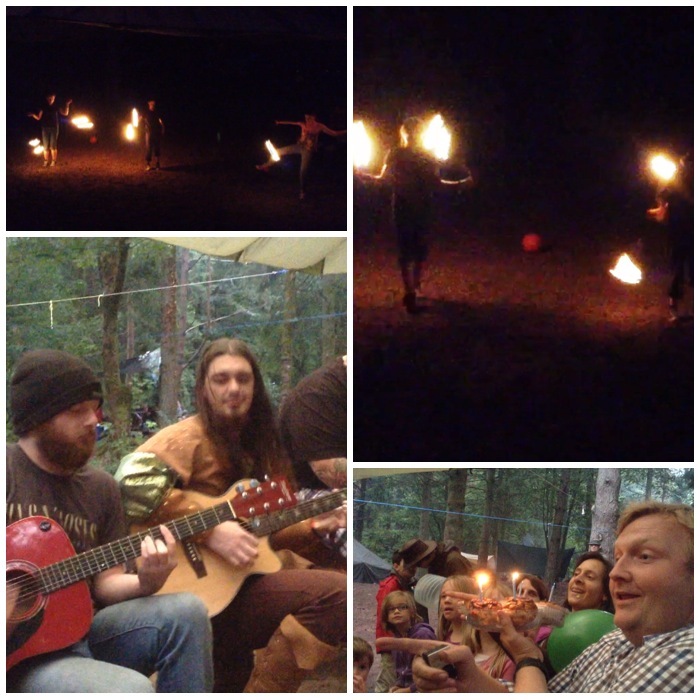 Here is the video of Emily, Liesl and Naomi doing their fire show on both nights. 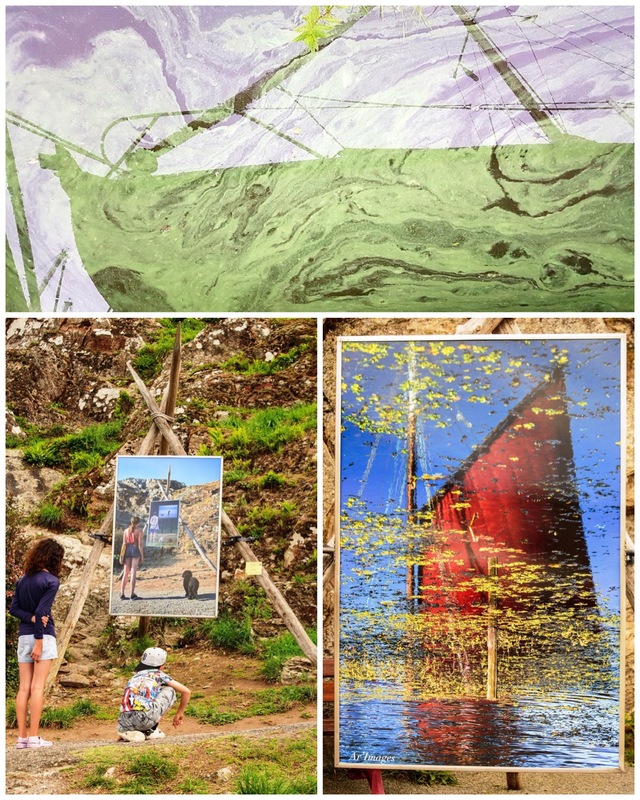 One of the things that has struck me about the Moot is all the different art that you can experience there. 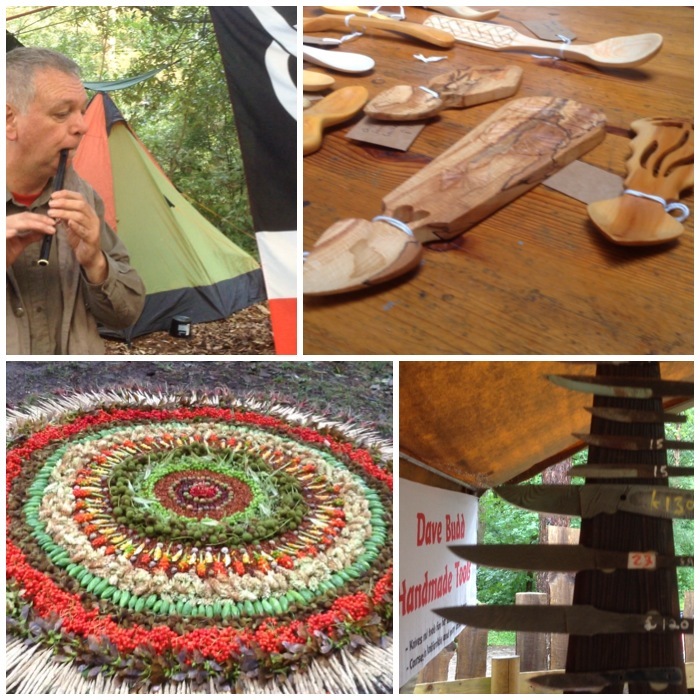 Art in the form of music from Stephen Crump (recorded for my third video), Welsh love spoons from Dean Allen, Woodland Plant Art from Keith Beaney and art in the form of iron from Dave Budd. Needless to say Spikey and Badger managed their own version of art up in the Naughty Corner with the use of torches and some evening spirit. The main Moot kicked off with lots and lots of courses. 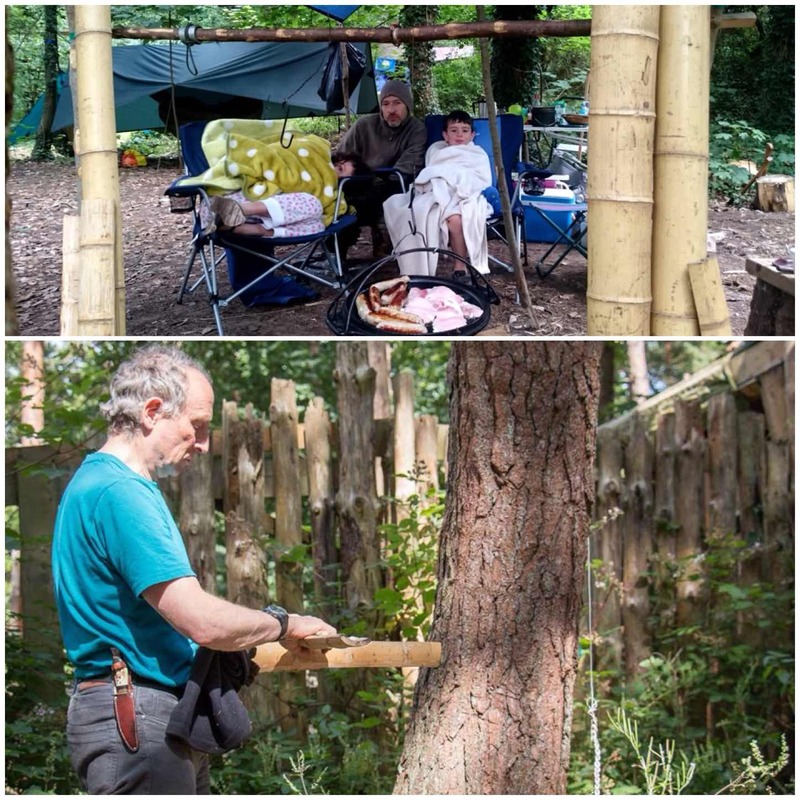 I have posted pictures from just a small selection of what was on offer: making the pizza oven with Tim, mini bows with Wayne, water purifying with Richard, net needle making with Steve and spoon carving with Dean. There were lots more courses going on but I did not get to see them as I was on the Starter course all day. My wife Alison arrived on the first day of the main Moot and took a lot of the pictures of the day. It was at this stage that we decided that Catherine was best off at home, so instead of staying, Alison took her back that day with Finlay. 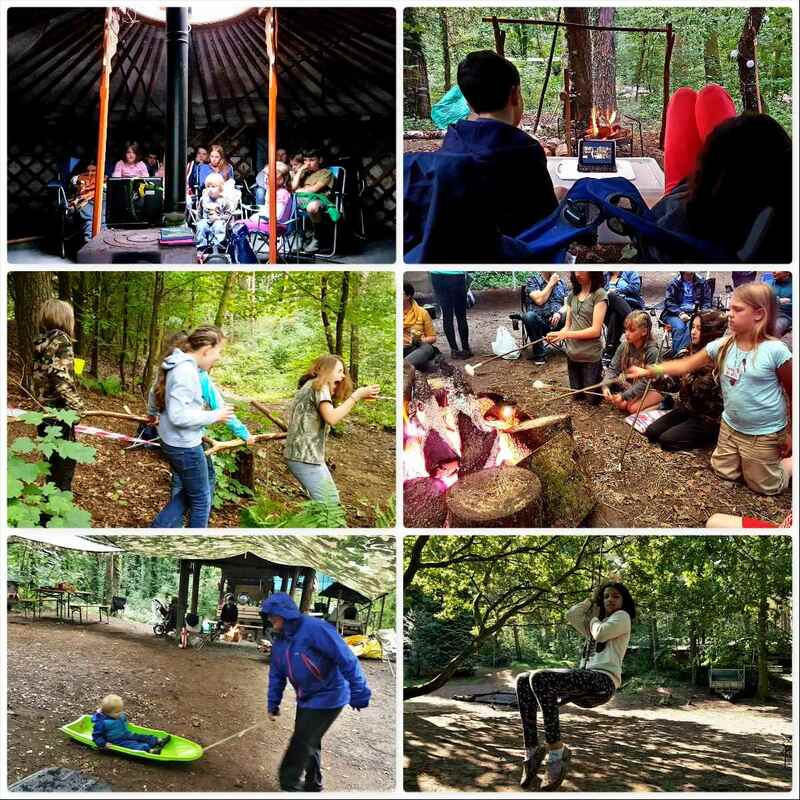 The next video is of many of the first day’s workshops, with backing music from the Naughty Corner band. The Sunday was another day of workshops and I tried to get around to as many as possible. 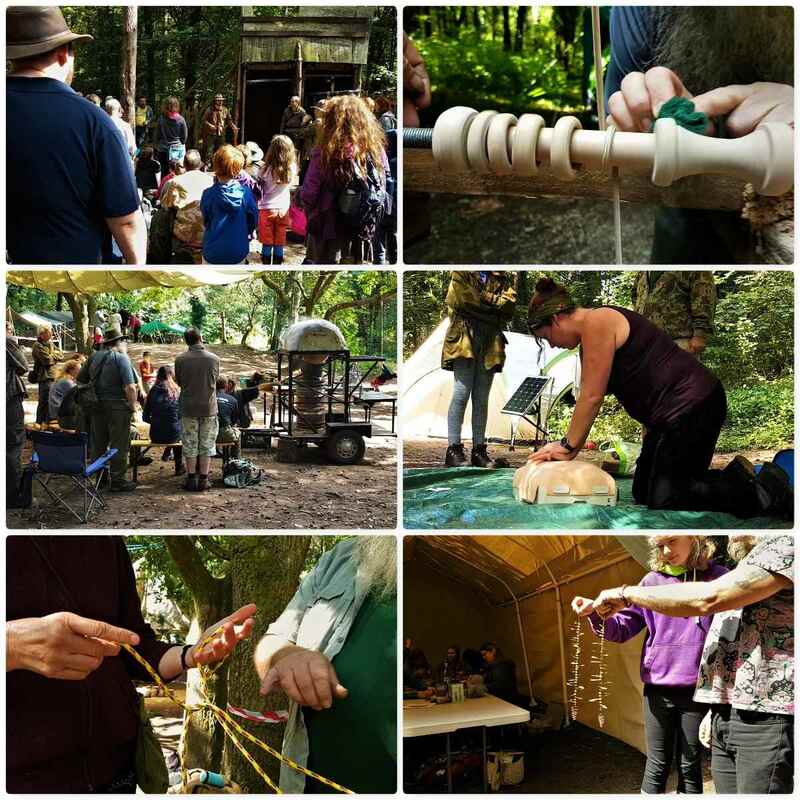 These included knife sharpening with Chris, making tapestries with Shelly, tracking with Perry McGee of the National Tracking School and making a geodesic dome with Tony. 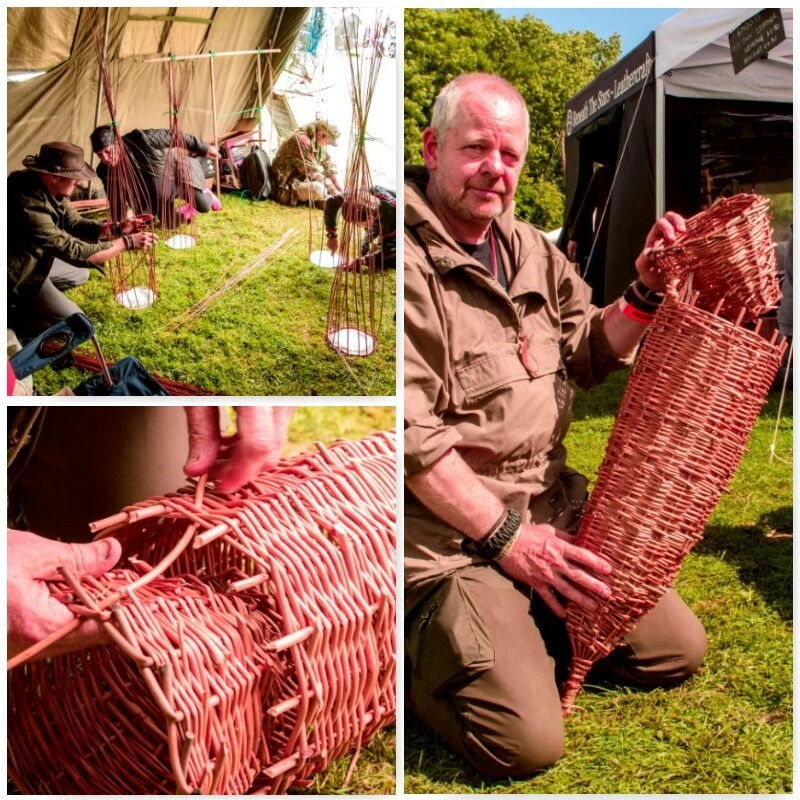 There were plenty of other courses going on such as plant walks with Robin Harford and willow basket trap making with Fraser from Coastal Survival. My video of the day has as its soundtrack Stephen Crump playing a tin whistle on a wet afternoon. Needless to say I spent a lot of my time down on the archery range shooting arrows or atlatl darts. With all the bows Wayne had been helping people to make we were kept very busy. I made a short but very funny video of Mad Dave and Cap’n Badger helping me to clear the range of a hung up tree. 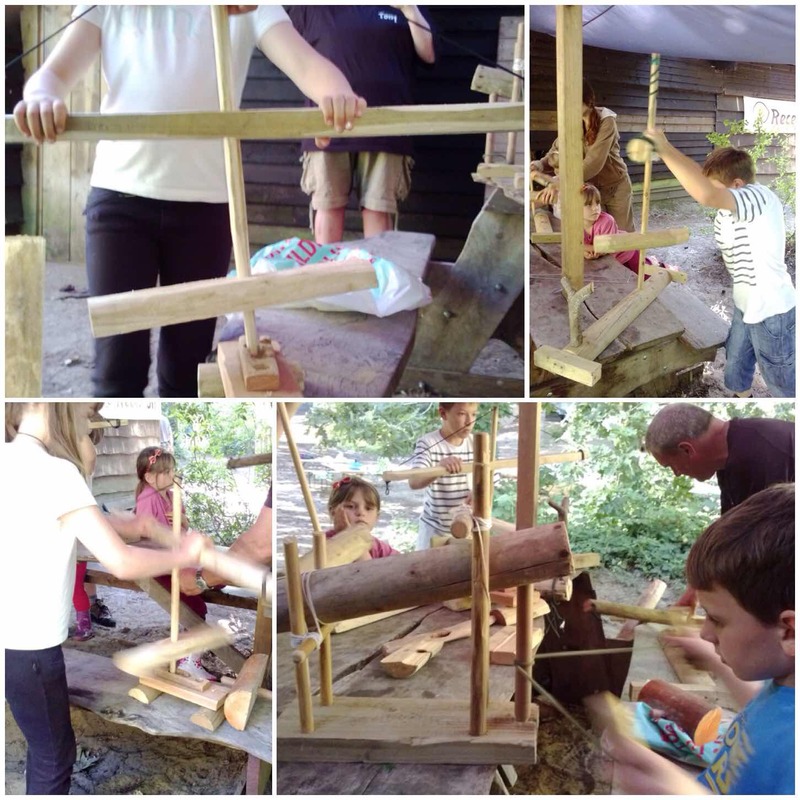 At this stage I had not run any bowdrill classes but I had done a couple of one-to-one sessions. 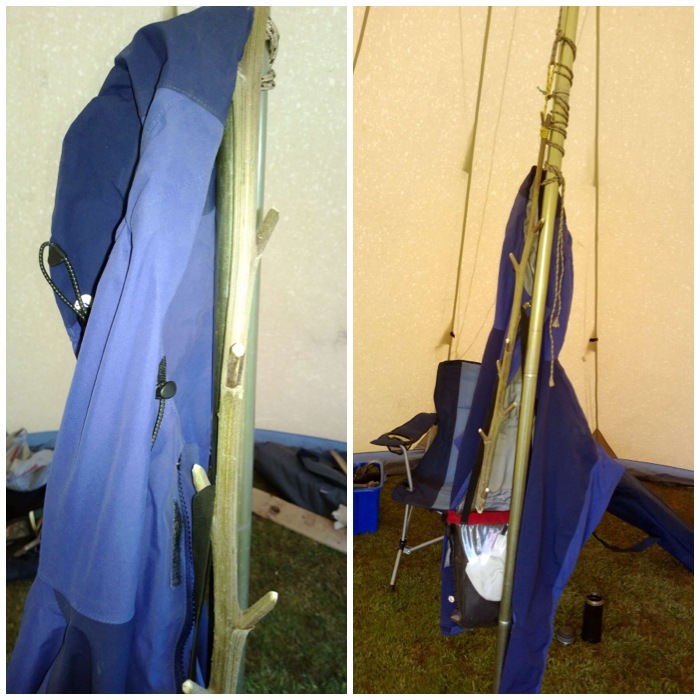 My neighbour Matt Baillie went off after one of the sessions and persevered until he got the bowdrill cracked – well done mate. I also did a quick session on the Egyptian bowdrill method and made a short film of it. The Monday was a bit of a damp affair but the Traders’ Day went well and I managed to try some more of Richard’s excellent elderberry wine. I managed to get a little bit of food at the group meal before it was devoured. 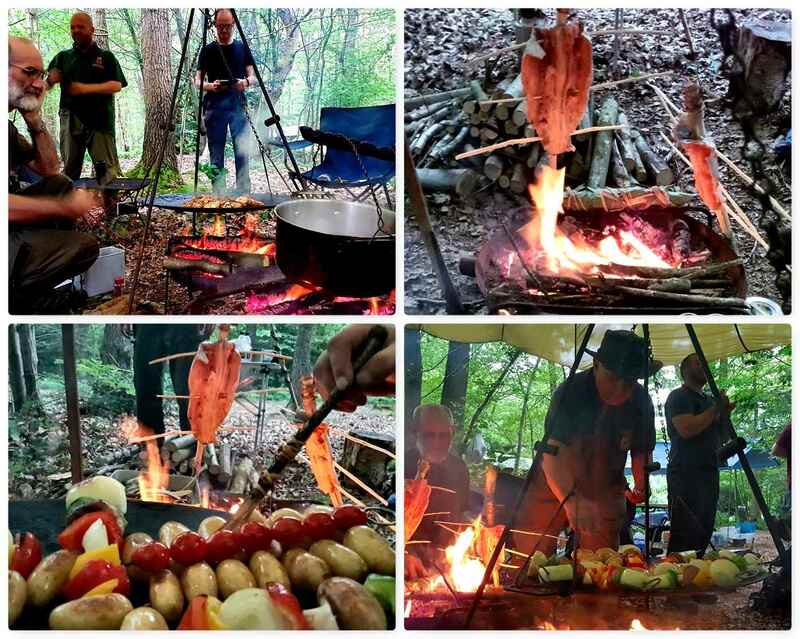 This is becoming a bit of a tradition now since we stopped doing the hangis, and it is amazing to see all the different dishes that can be cooked over an open fire in a Dutch Oven. 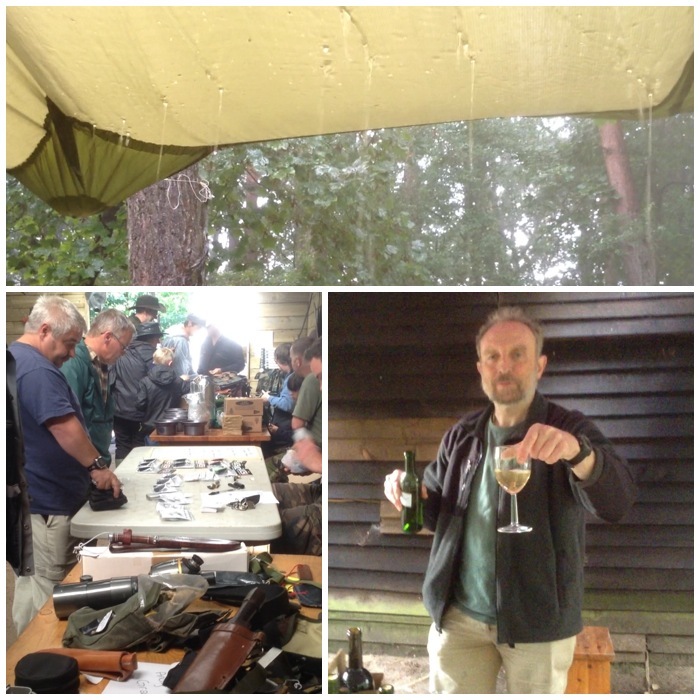 My last video of the Moot is of the Traders’ Day and the group meal. I spoke with Alison that evening and decided to head home in the morning as Catherine was still very poorly. I got home by lunchtime on Tuesday and thankfully over the next few days Catherine started to recover and was soon back to her usual self. I really enjoyed the half of the Moot I attended this year and my kids are desperate to come back again next year. 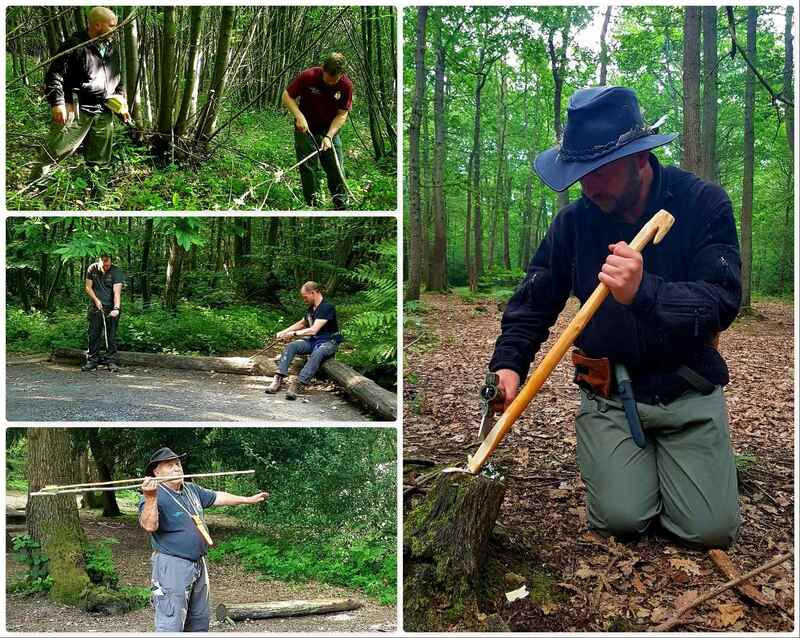 There were another couple of days of workshops that I missed but I think this post will give you a feel for how the Bushmoot works. I hopefully will see you all again next year and meet a few new faces as well. Part 3 in this series on fire by friction looks at my style of using what I classify as a modern bowdrill set up. I use the term modern as I am using starter cord on the bow to spin the drill piece. I like starter cord as it does not stretch too much when the drill piece is attached and it is also very hard wearing. I filmed this last July in France at early evening time. I appreciate there may be similarities with this post and my previous one on the Egyptian method but I want each of the videos to be stand alone. 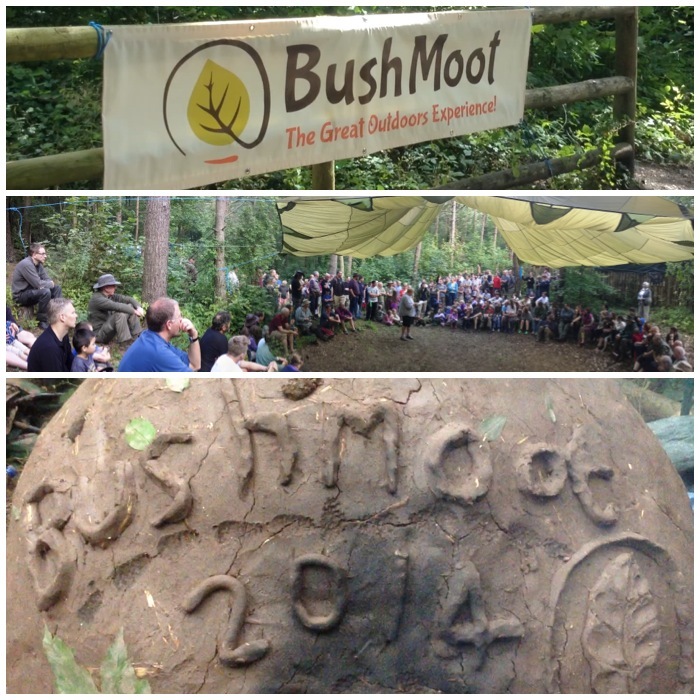 I was at the BCUK Bushmoot in August and was asked by some friends if I could show them how the Egyptian method works. Rather than me showing them I got the guys to double up and do it themselves to show them how easy it was. They used two limpet shells as a bearing block (which they told me got eventually quite hot) and also watch out for the drill piece as they stop drilling. Notice how it does not spring away when it is released from the bearing block as the more modern single wrap method will do. 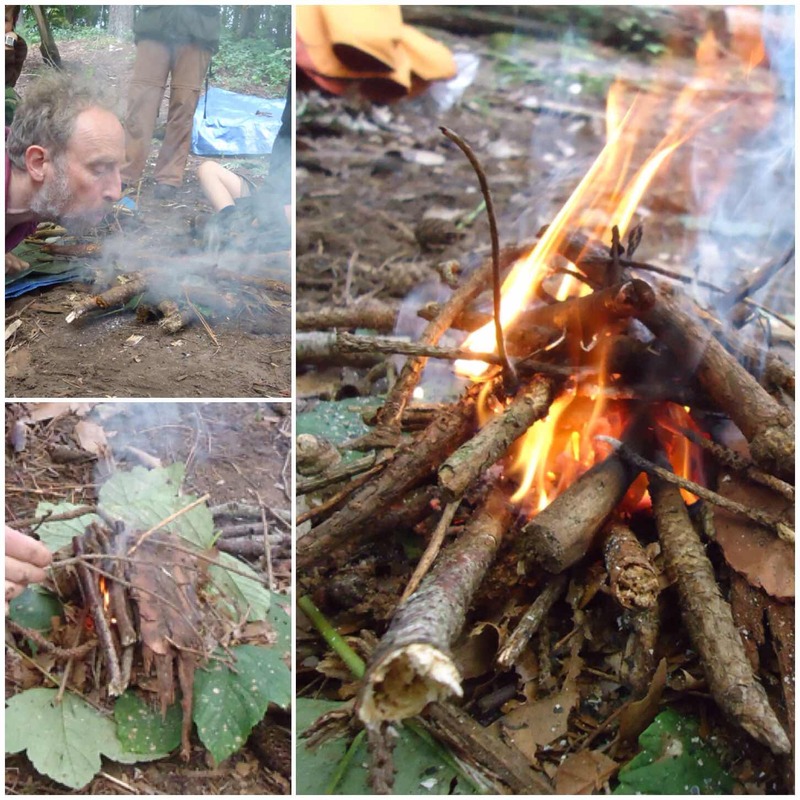 I have been bushcrafting on and off for most of my life. 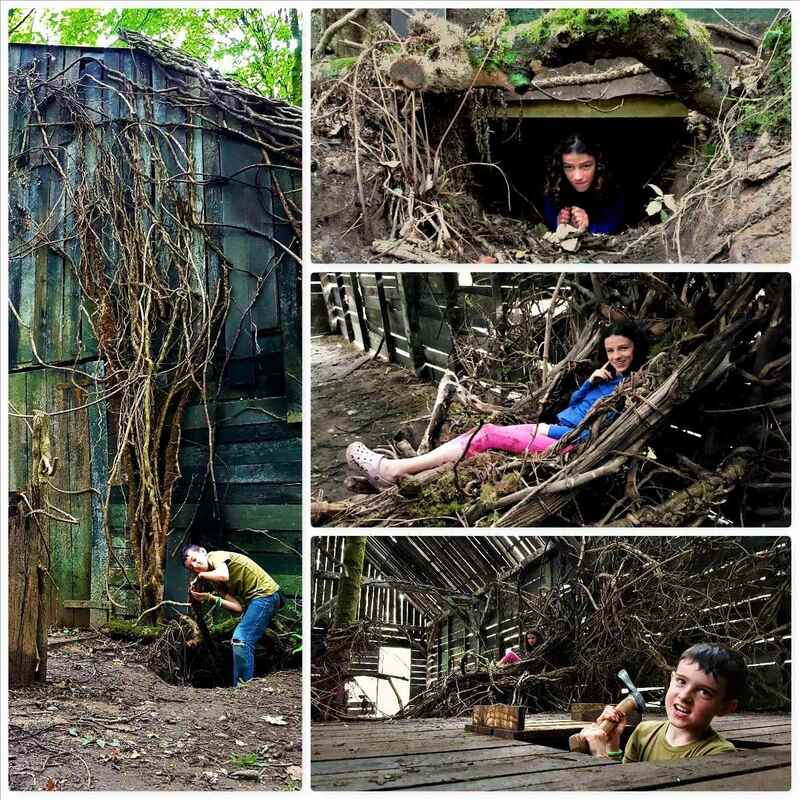 Growing up in a remote village on the Isle of Lewis off the west coast of Scotland I was free to get out and about as a boy and really explore my surroundings. I saw this sometimes then as a lifestyle that was stuck in the past: I remember wishing for all those modern gizmos and ways of doing things I saw advertised on the television. But now, aged 47, I really appreciate that upbringing, even though we did struggle at times. 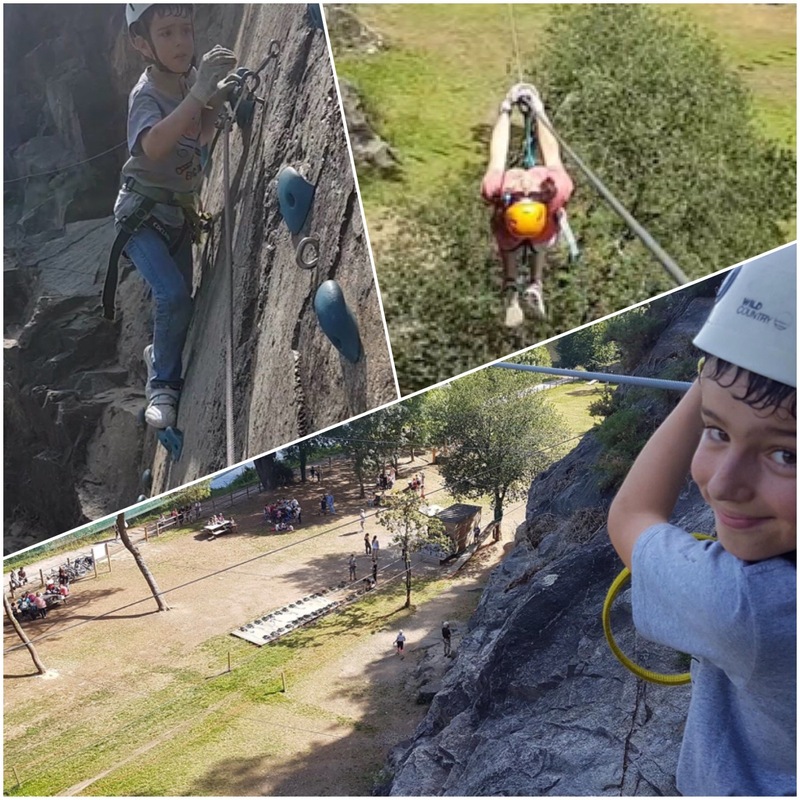 When I teach outdoor skills to kids these days I see the effect on them; having been sat in front of a TV or computer for most of their lives they are afraid at first to explore or take risks outdoors, but with a little bit of encouragement and support it is great to see them discovering a whole new way of learning. One of the tools I use in that learning process is the ‘force of fire’. 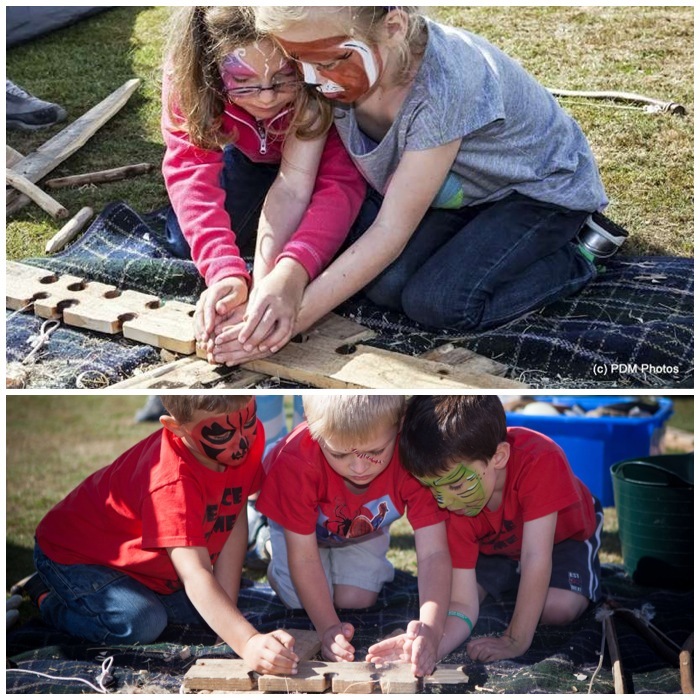 That force of fire can be made in many different ways but my favourite is Teine Eigin – Gaelic for rubbing two sticks together to make fire. 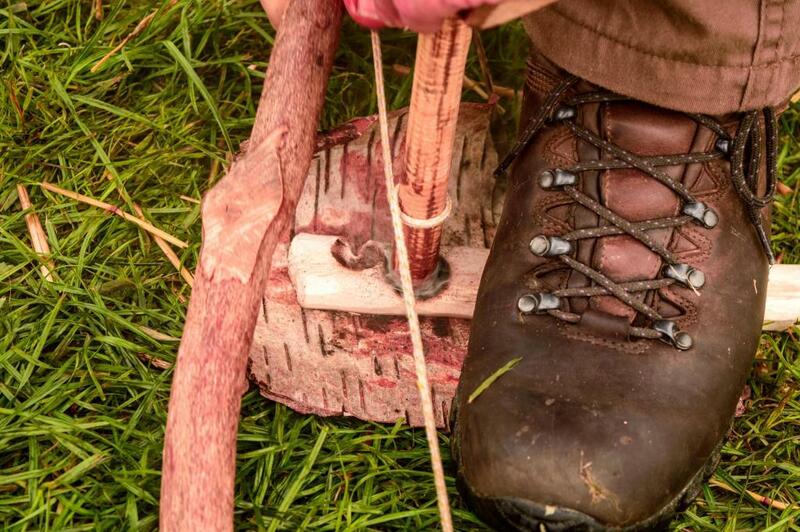 Nowadays bushcrafters know this as bowdrill or handrill (though there are many other techniques, such as the plough) but what many do not realise is that this method was used in certain areas of Scotland up until the middle of the 19th century. 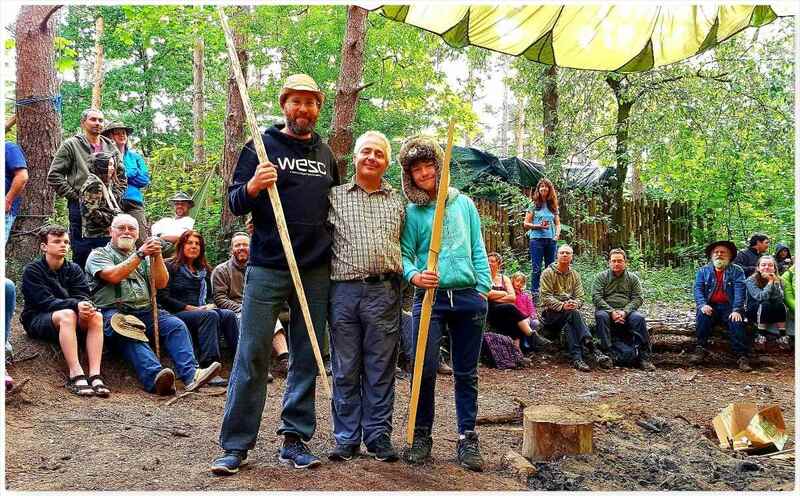 I wrote a recent article where I put some good links to this tradition – Bushcrafting at Lews Castle College. 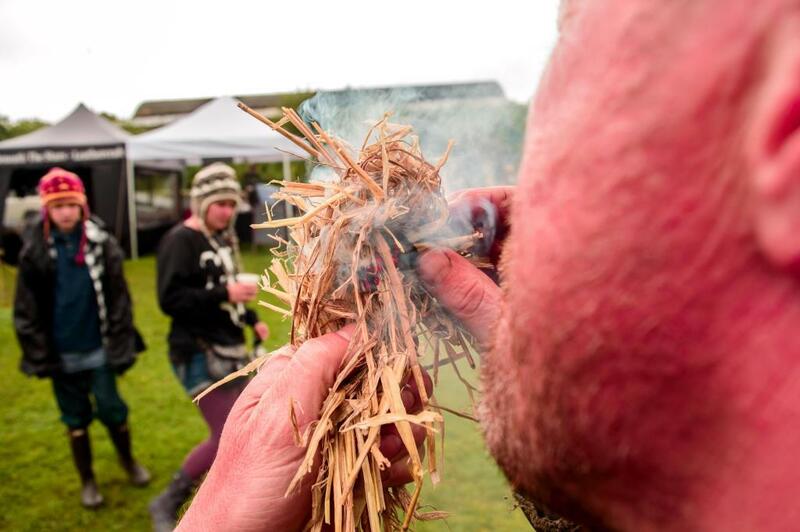 This summer I plan to explore some different methods of making fire by rubbing two sticks together – Teine Eigin. Here is my intro video to the subject. This is my first video with commentary so I’d love to hear your thoughts or questions. 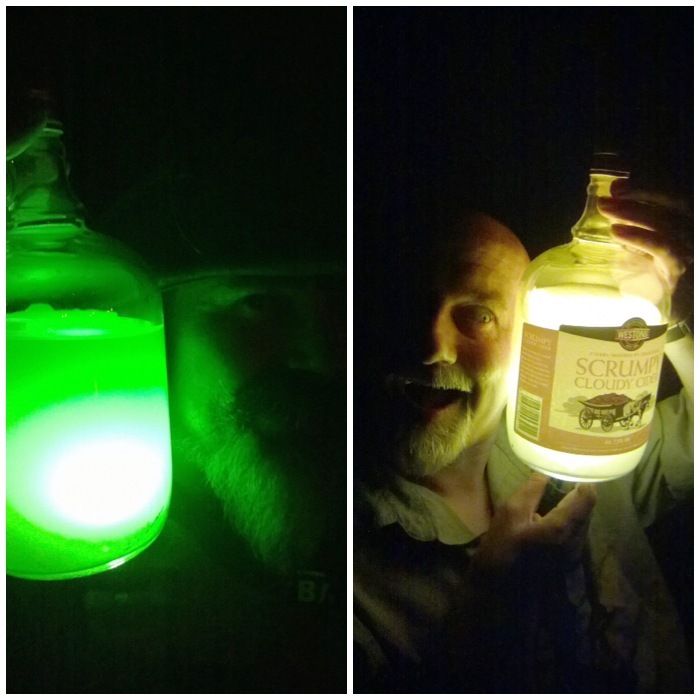 Cheers, and I will be back over the summer with more articles on these methods in detail. 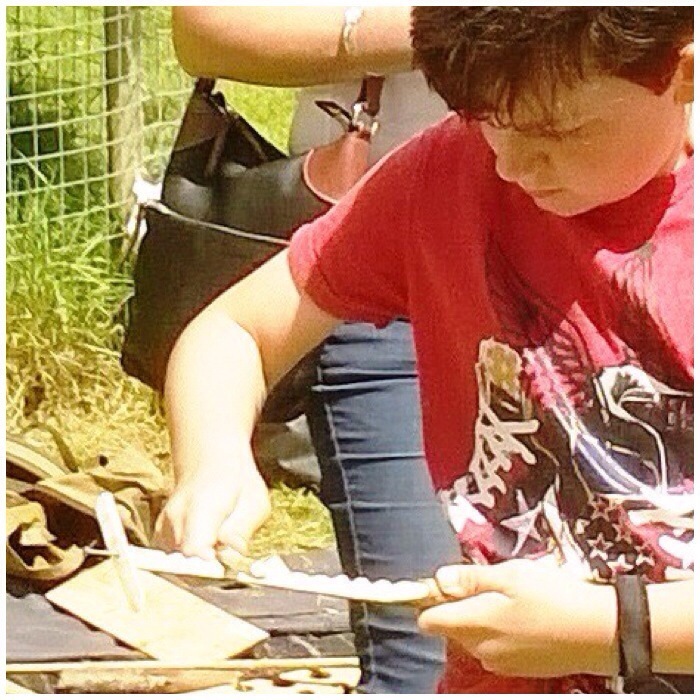 My brother Finlay has been attending Lews Castle College on the Isle of Lewis off and on now for a number of years and I was privileged recently to be asked along for a day to teach him and his fellow students some bushcraft skills. They have a great horticulture area at the college with some impressive greenhouses growing a wide range of plants. 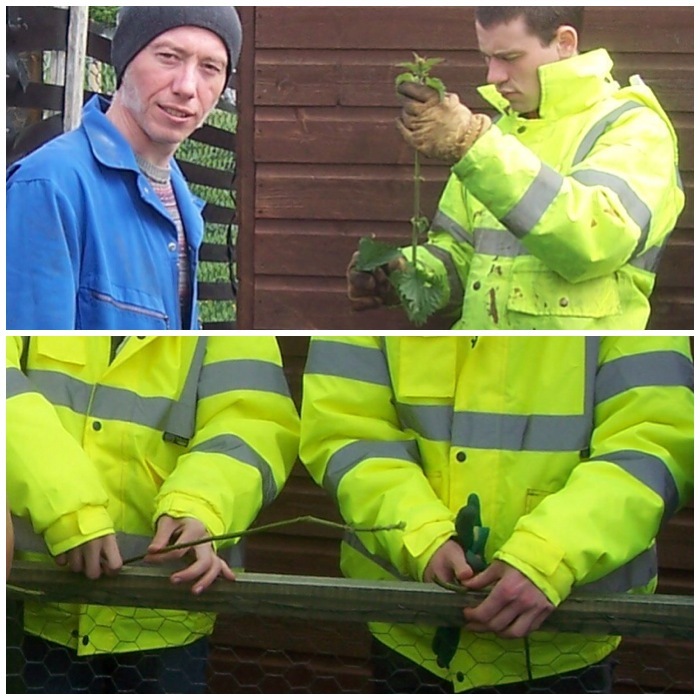 Finlay loves working with plants and the college has provided him a good place over the years to develop his skills. 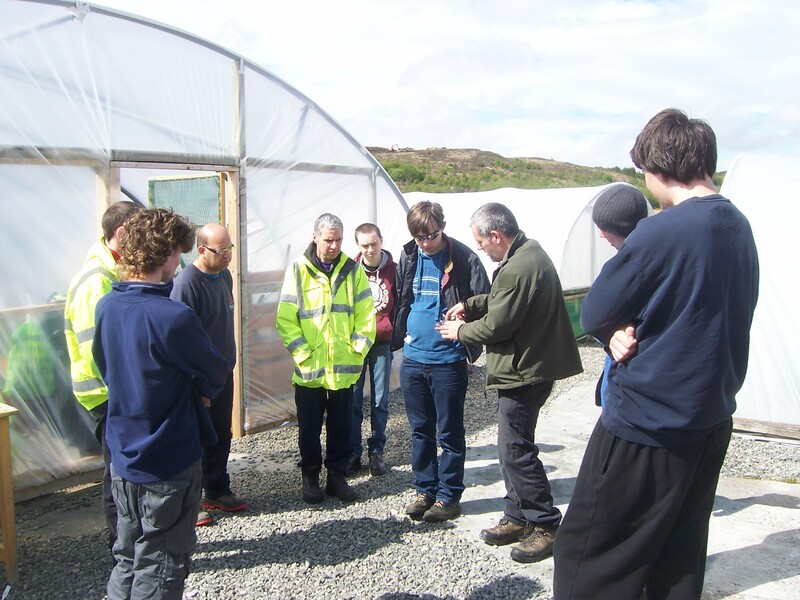 The current course he is attending is called Grow2Work and its aim is to instil a work ethic within the students, giving them confidence and building their self esteem. 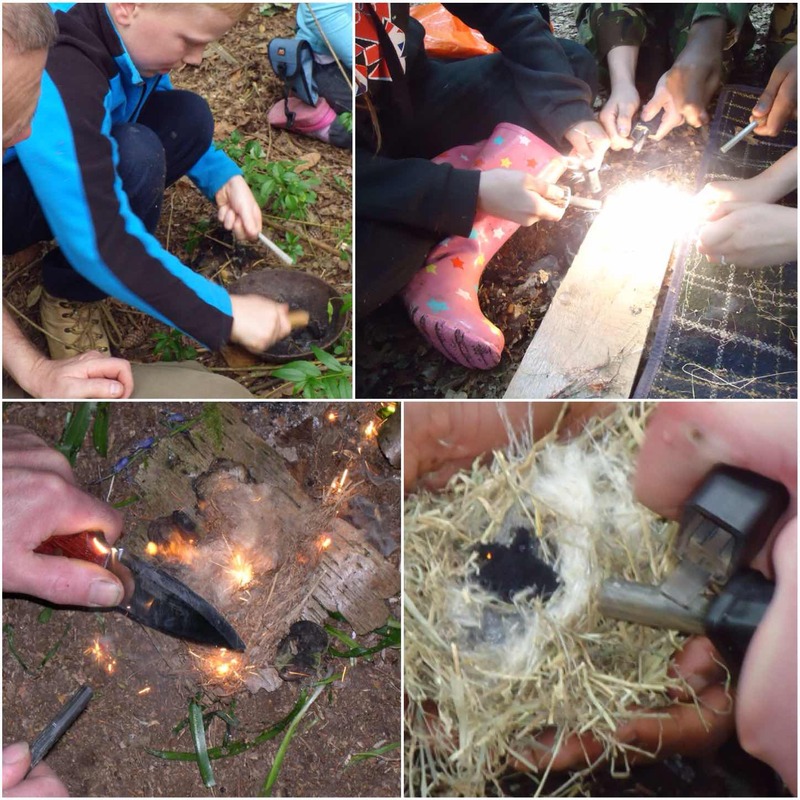 The students develop a number of skills, such as working as part of a team and following instructions by spending time planting, harvesting vegetables and strimming plants. 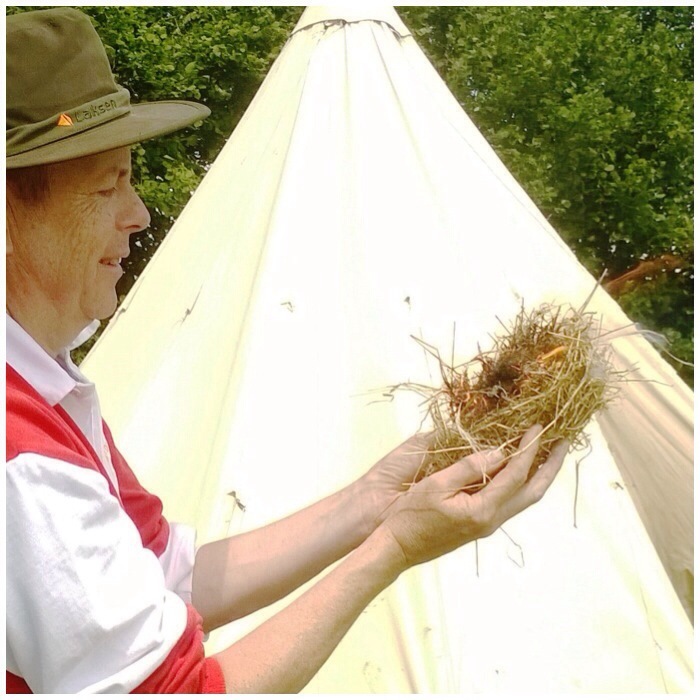 My Grandmother Mary passed away earlier in May this year and while I was up on the island for the funeral my sister Tina had a chat with the course director, John Maclean, and mentioned that I did teaching around wild plants and bushcraft skills. 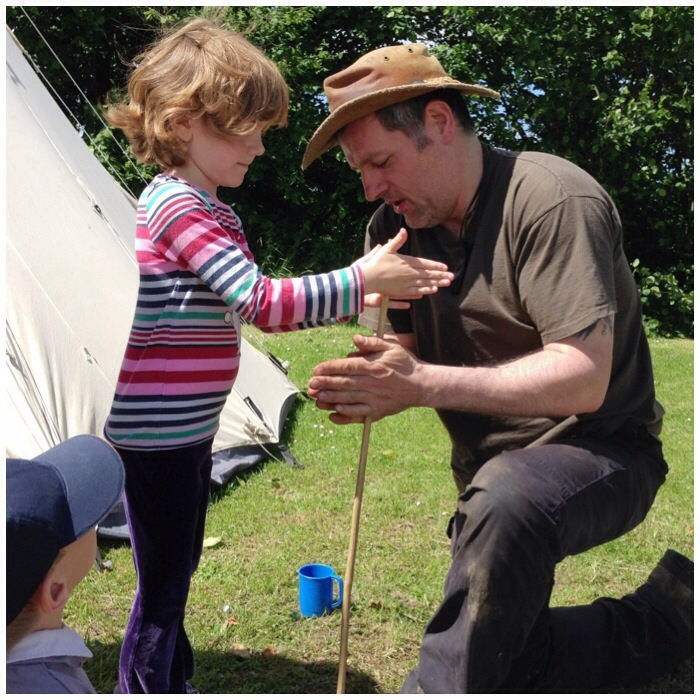 Unknown to me, Tina had volunteered me to do a day’s bushcraft tuition for the whole of Finlay’s class when I was next up at the end of May on holiday to the island with my family. 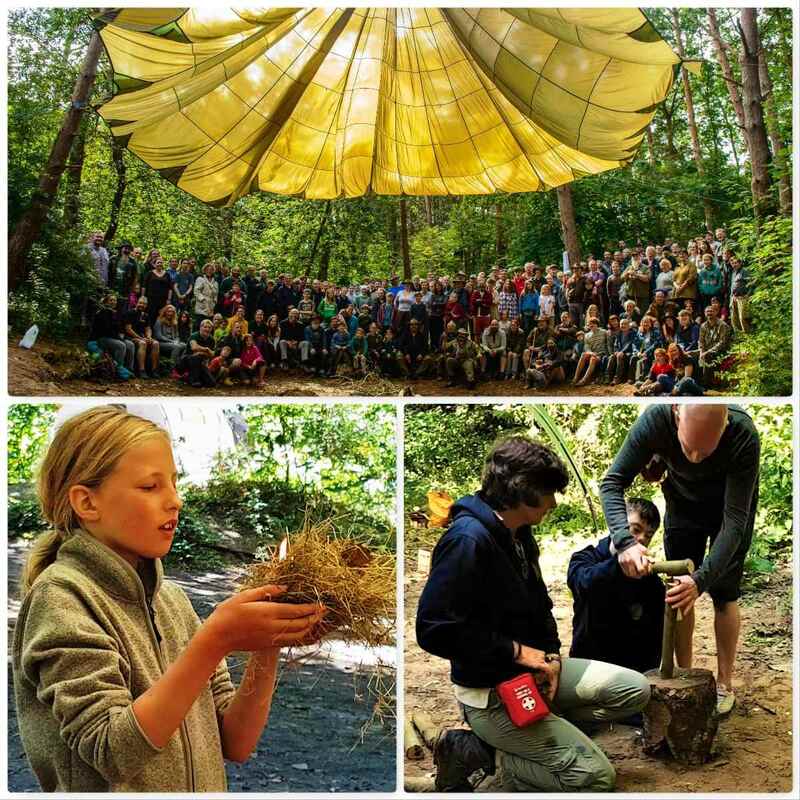 I found out eventually I was doing the course and so, not really knowing what I was going to do with it, packed an extra bag full of bushcraft and survival kit. I fully expected to have half my kit confiscated at the airport but miraculously the security folk let it all through. If I had been asked to open it up I would have been hard pressed to explain myself. I had been asked to run the course on the Monday so I managed to do a recce of the castle grounds woodland to find good teaching areas. 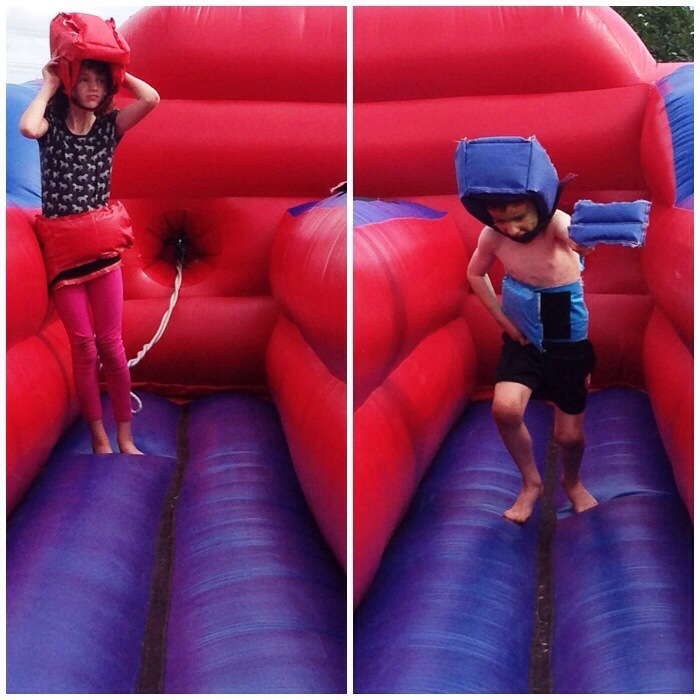 While I was doing this with the kids my wife Alison ran the Stornoway half marathon. I shot this little video of the day recceing the woods and supporting Alison. I spent a lot of time as a teenager exploring these woods around the castle and it did feel rather strange to be coming back to teach bushcraft skills in one of the places that my passion for the art started. 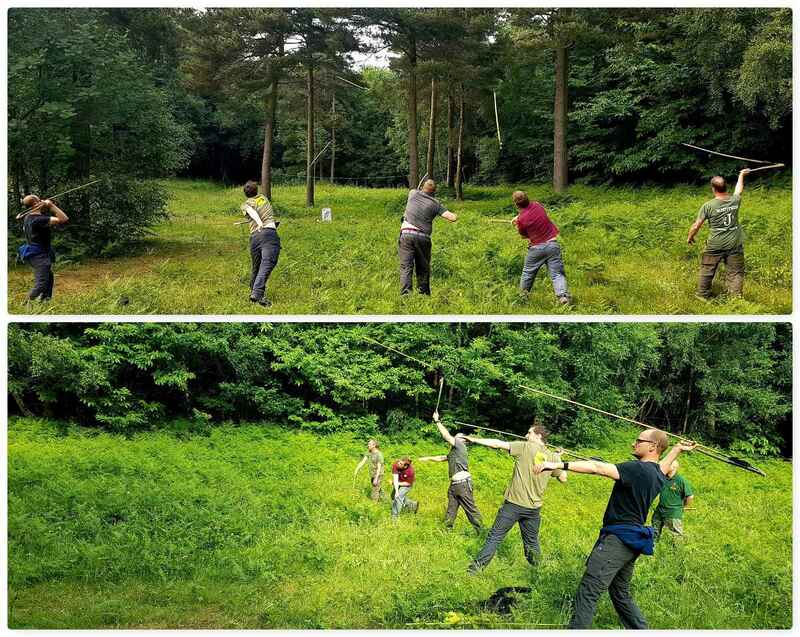 and finally shooting some Atlatl darts in the wood. 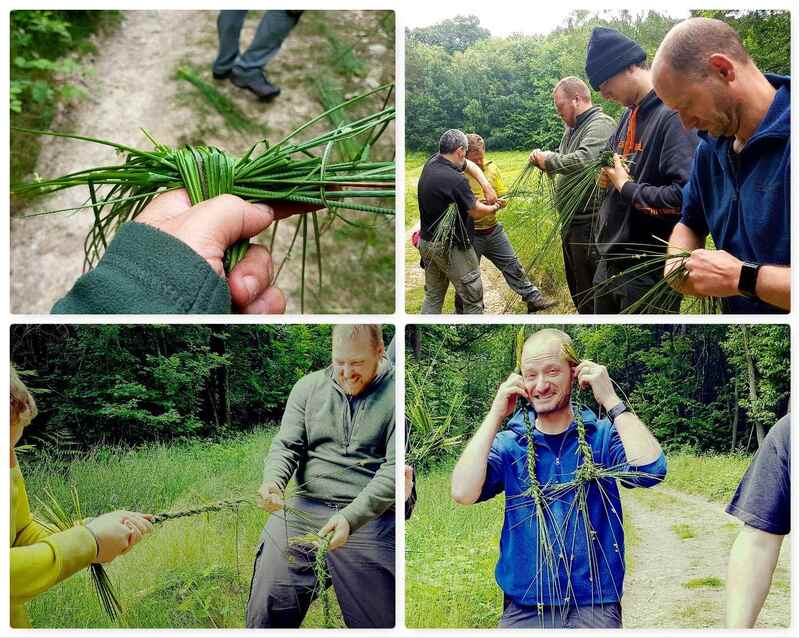 There were a few nettles growing around the edges of the gardens so after putting on some gloves I got the guys to pick some to make some cordage. I explained that it was thought the nettle was introduced to the British Isles by the Romans as a method of producing linen or as a method of keeping warm (urtification). After picking the nettles the guys stripped off the leaves and crushed all the nodules in the stalks to make them easier to split open. Nettle cordage would have been made on the island in the past as it has been common on the island for centuries. 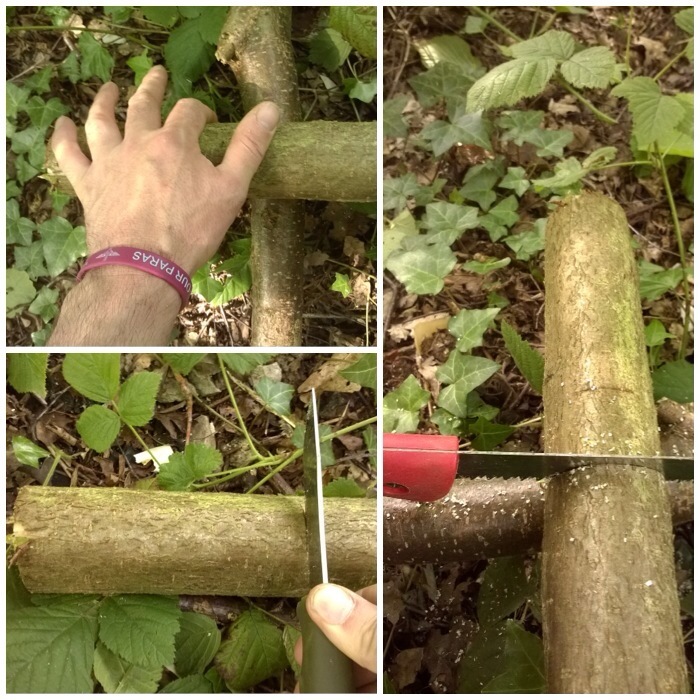 I got the class to split open the stalks of the nettles along the full length of the stems and then pulled out the hard pithy core to leave long strips of the outer nettle fibre. 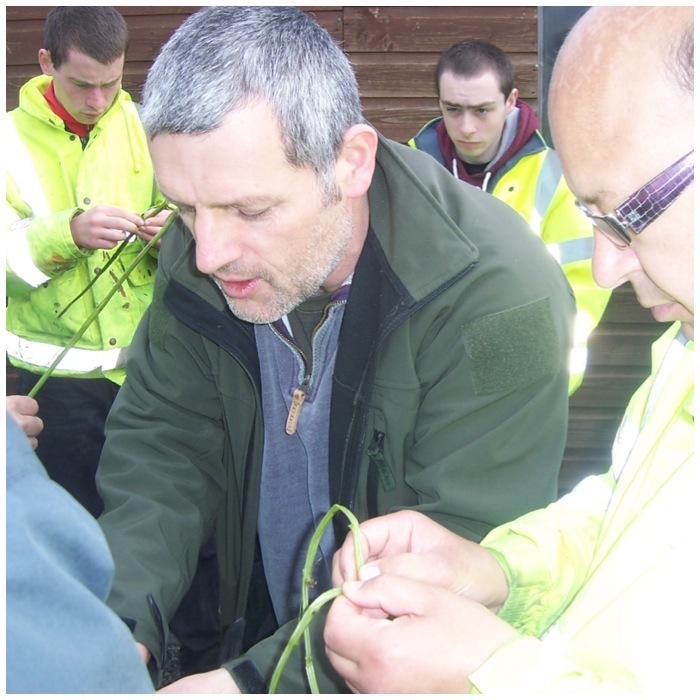 We then wrapped the nettles into short strips of cordage. 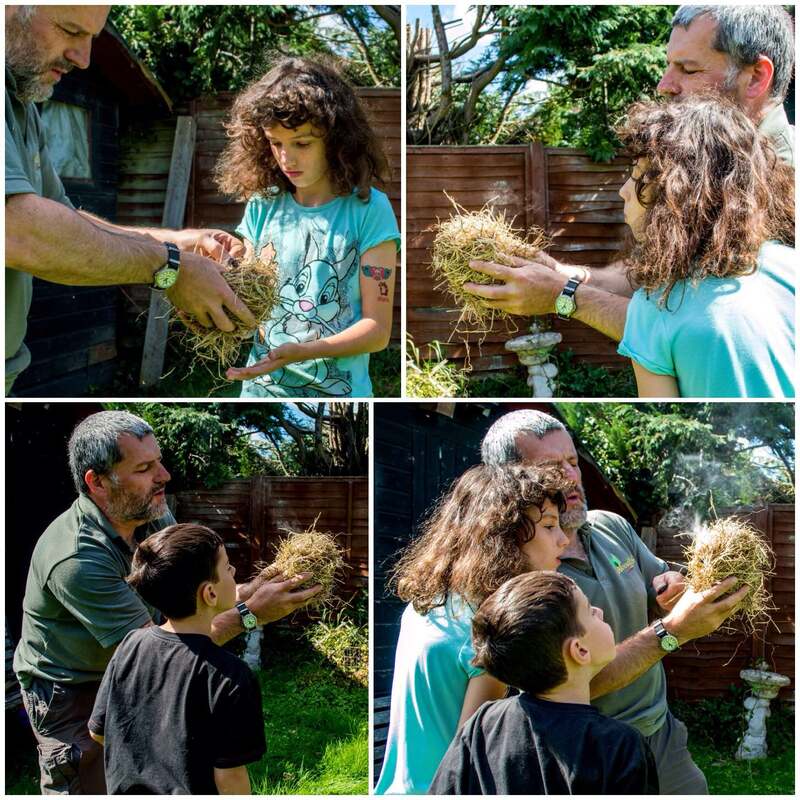 The guys liked this as they could see how they could easily make cordage from nettles in their garden if they did not have any modern cordage to hand. 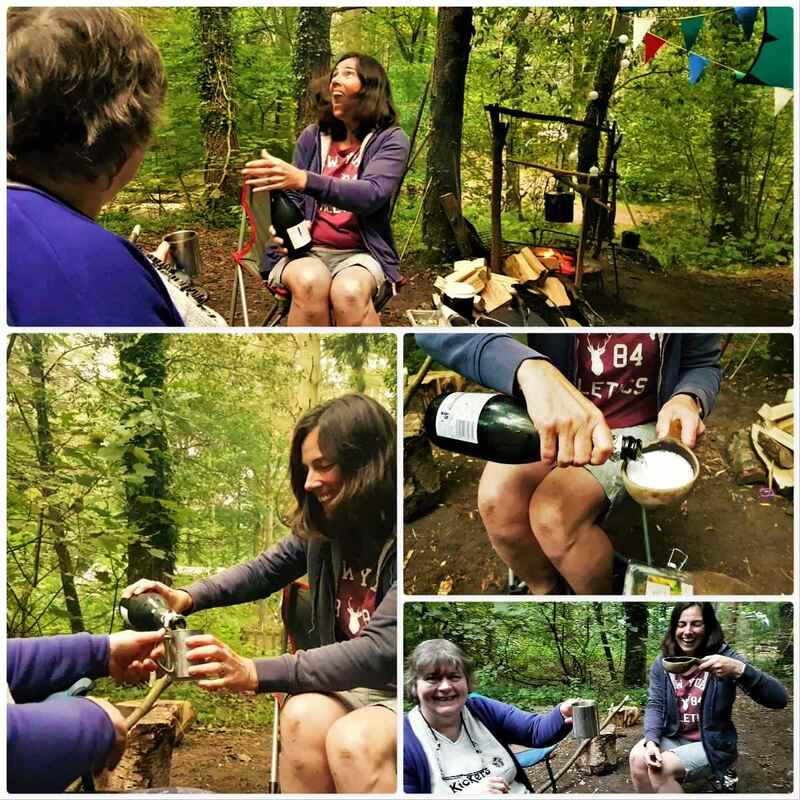 After making the nettle cordage we went for a walk up into the woods. On the way we stopped to chat about many of the wild plants growing around the college. 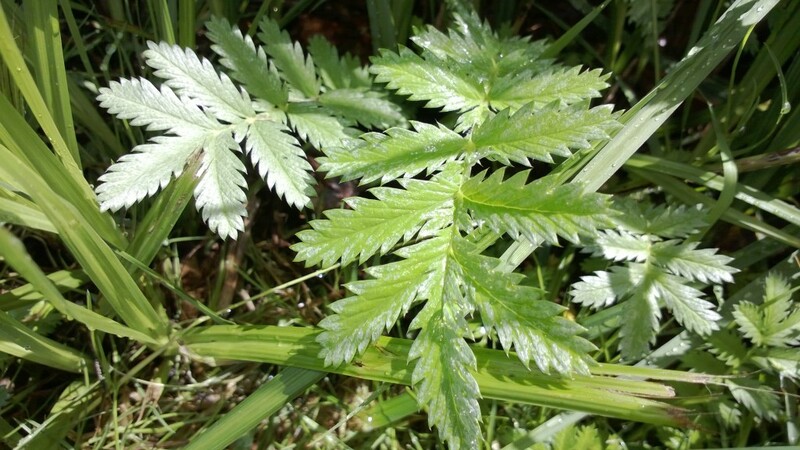 One of the common plants was the Silverweed. I explained this plant was a staple food in Scotland prior to the introduction of potatoes in the 1500s and was known as Seachdamh Aran (the Seventh Bread). It was thought that a man could sustain himself for a year on a patch of silverweed the square of his own height. In North Uist during the clearances, homeless folk were said to be living on shellfish and on bread made from dried silverweed roots. A good document on this can be found on the BBC website. After talking about some other plants including comfrey, thistle and some different types of trees, we set ourselves up a little camp. 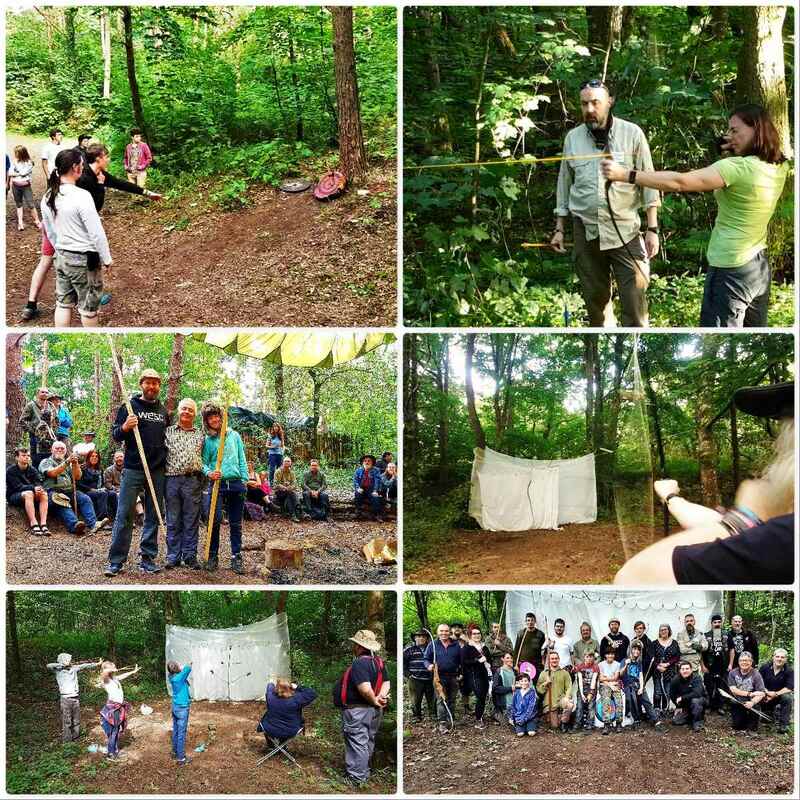 This was to show the class some of the hammocks and tarps I use when bushcrafting. 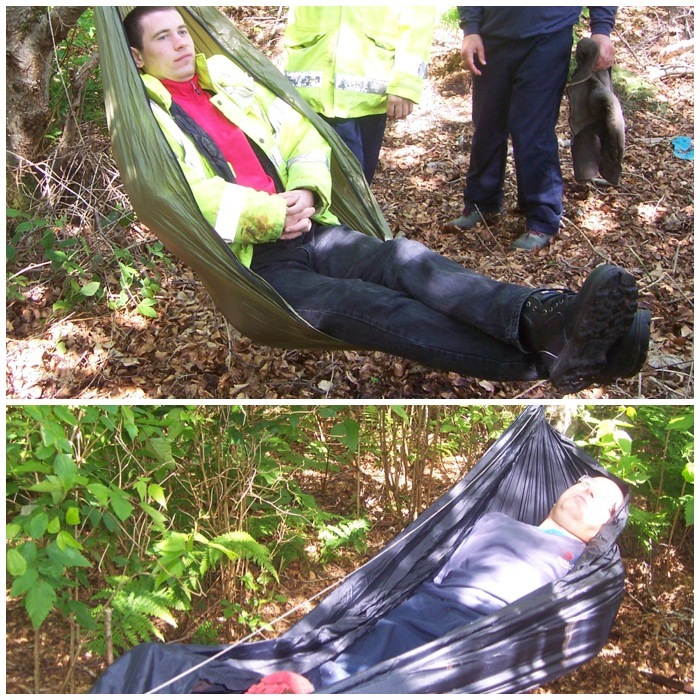 They were all keen to try out the hammocks. I had brought along two types of hammocks. 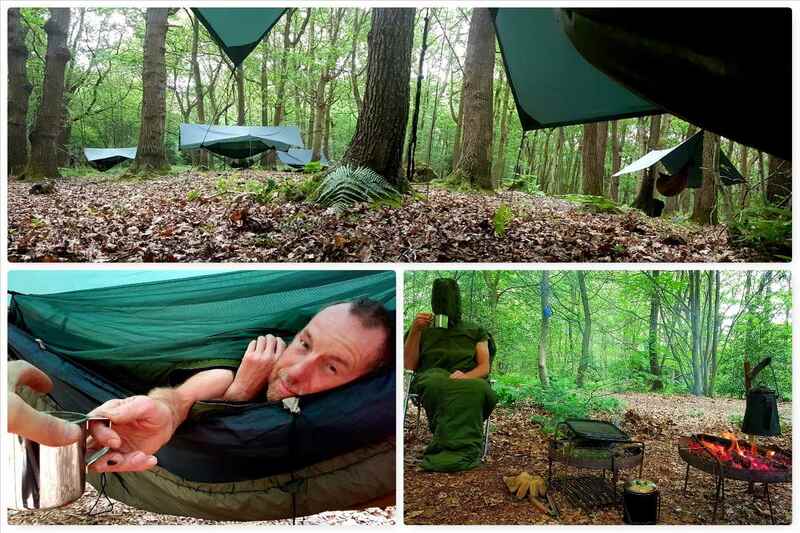 One was the EDC Chair hammock and the other was the Woodsman hammock. 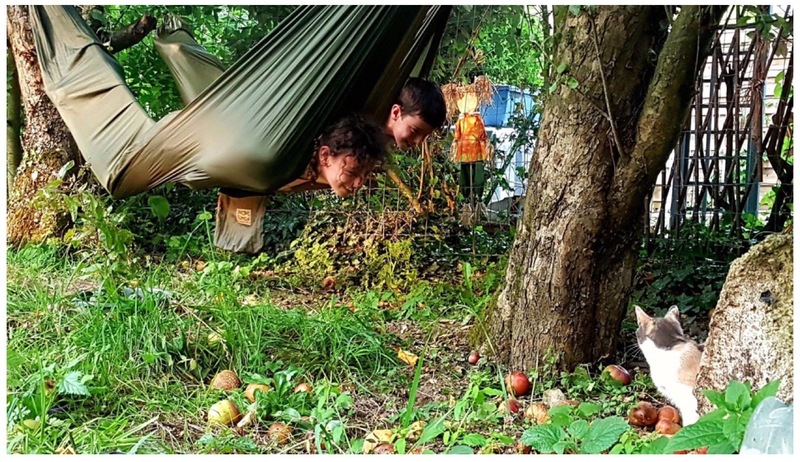 Both hammocks are made by my friend Mat Howes of UK Hammocks. 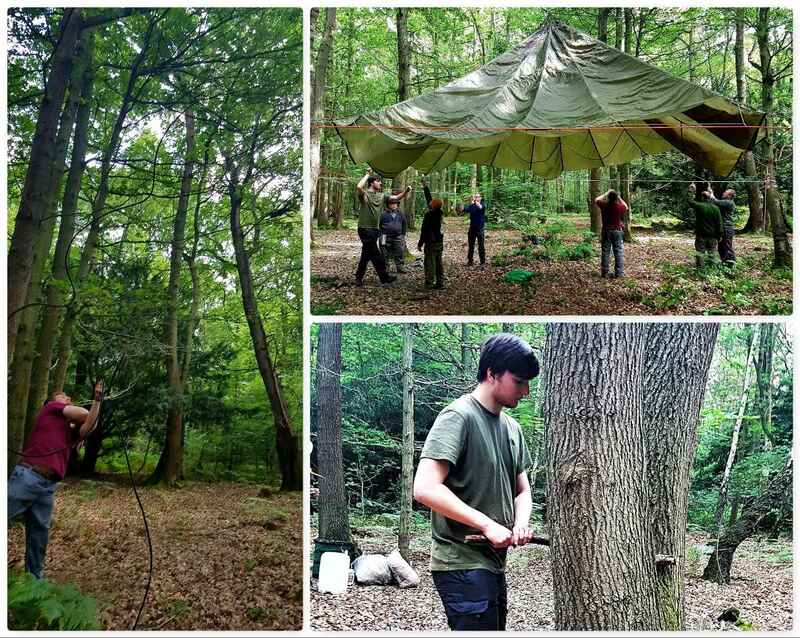 After setting up the hammocks we set up a tarp and practised some knots, including the Evenk, the Tarp Taught and the Clove Hitch. After lunch it was on with the business of making fire. We had already made fire by using a parabolic mirror earlier that morning using the sun’s rays – not often you can do that on the Isle of Lewis. 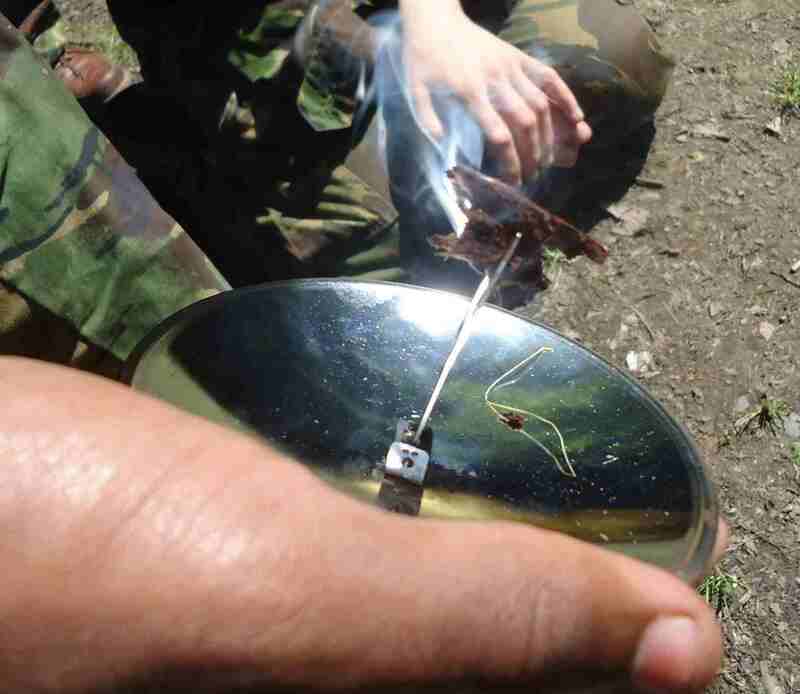 Although I used a modern mirror this technique has recently been shown to have been used for thousands of years – World’s Oldest Solar Device. We decided for safety to light our fires on a patch of concrete within the nursery area (normally I would use raised fire pits for this). I taught the class how to use modern firesteels at first and they soon had sparks going strong. My son Finlay got in on the act as well and everyone was able to light up some cotton wool balls in no time. I have to say a big thank you to my wee boy Finlay as he was the perfect student all day, getting stuck in with all the others. After the cotton wool balls I got the class to catch some sparks onto some char cloth that we then popped into some hay. 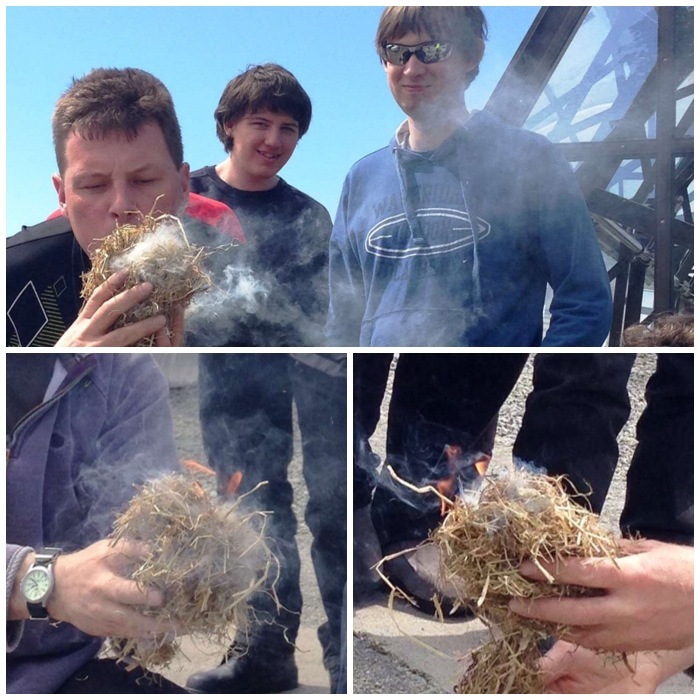 Everyone was happy when we got that first tinder bundle burning happily. 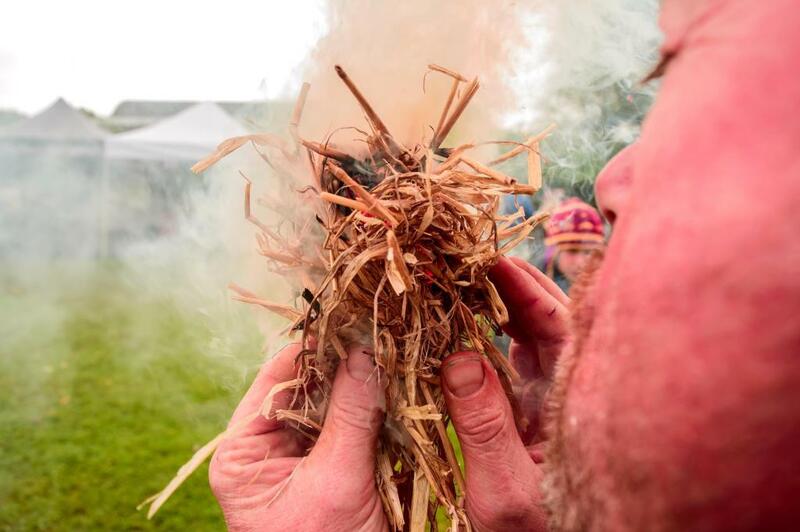 After the firesteels it was time to make some Lucky Fire, sometimes known as the Beltane, the Need fire or Forced Fire on the islands. 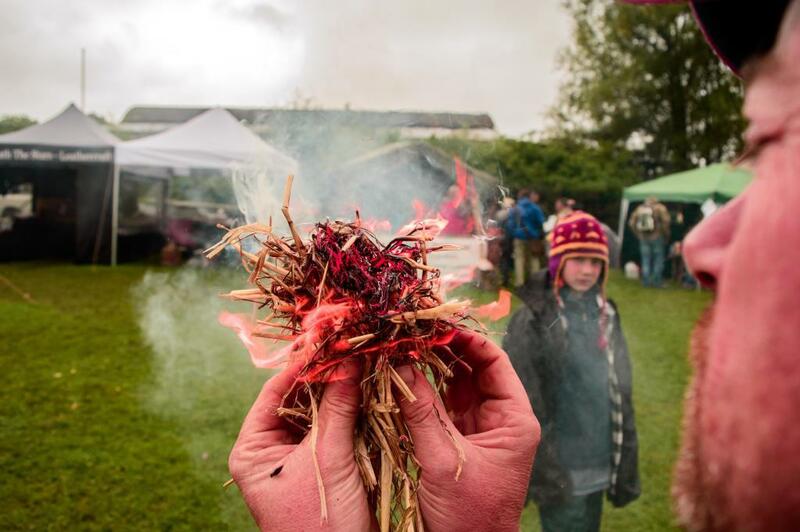 In Gaelic it is called teine eigin (translates as ‘fire from rubbing sticks together’). 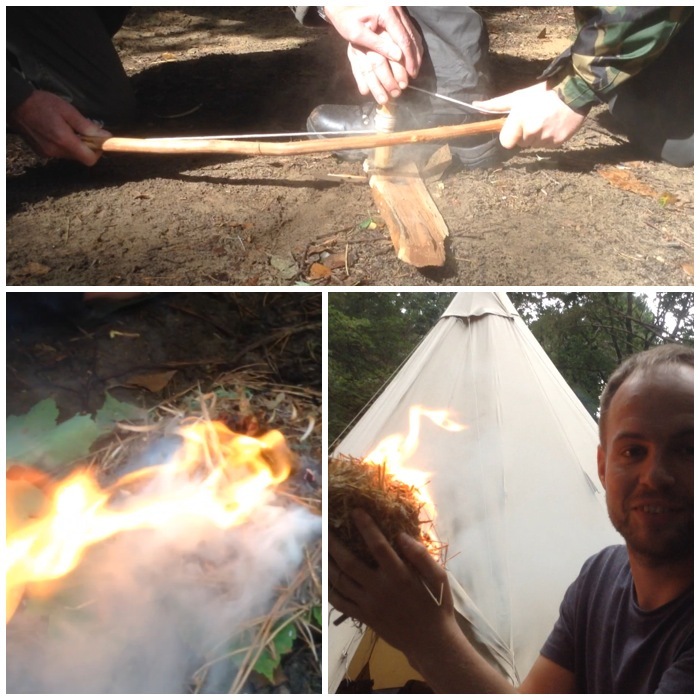 Bushcrafters normally call this skill the Bowdrill but what is not commonly known is that this method of fire lighting was used in Scotland in some places to light fires up until the middle of the 19th century. I doubled up with each of the guys to give them a feel for how it worked but due to a lack of time could not teach them to do this on their own. 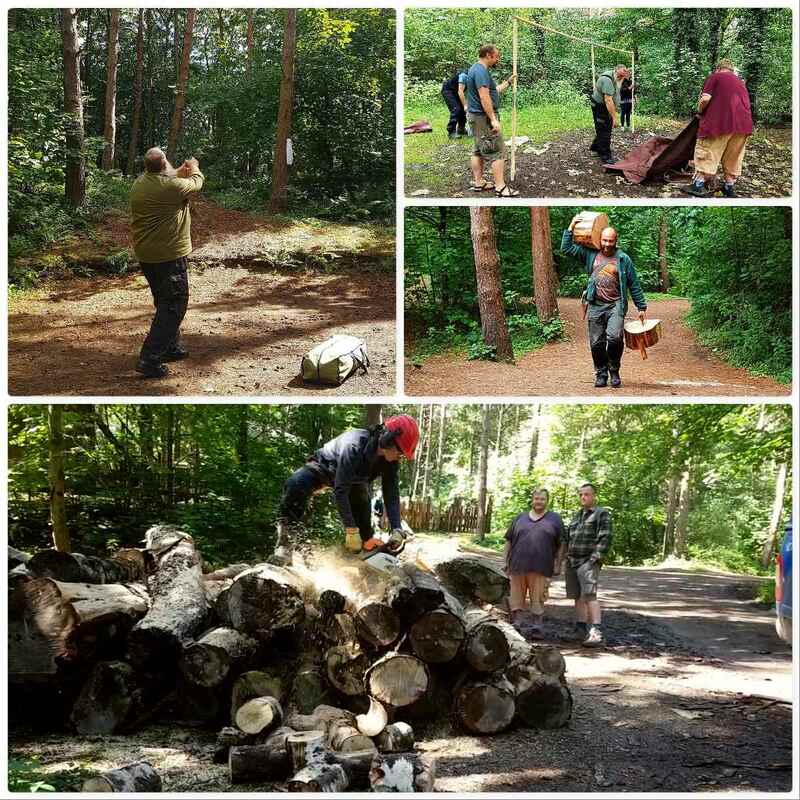 The wood was lovely and dry due to the sunny day and we soon had some good coals going. As we were bowdrilling I explained how this technique had been used on the islands until very recently and it would have been quite likely that some of their recent ancestors had used this technique to light a fire. 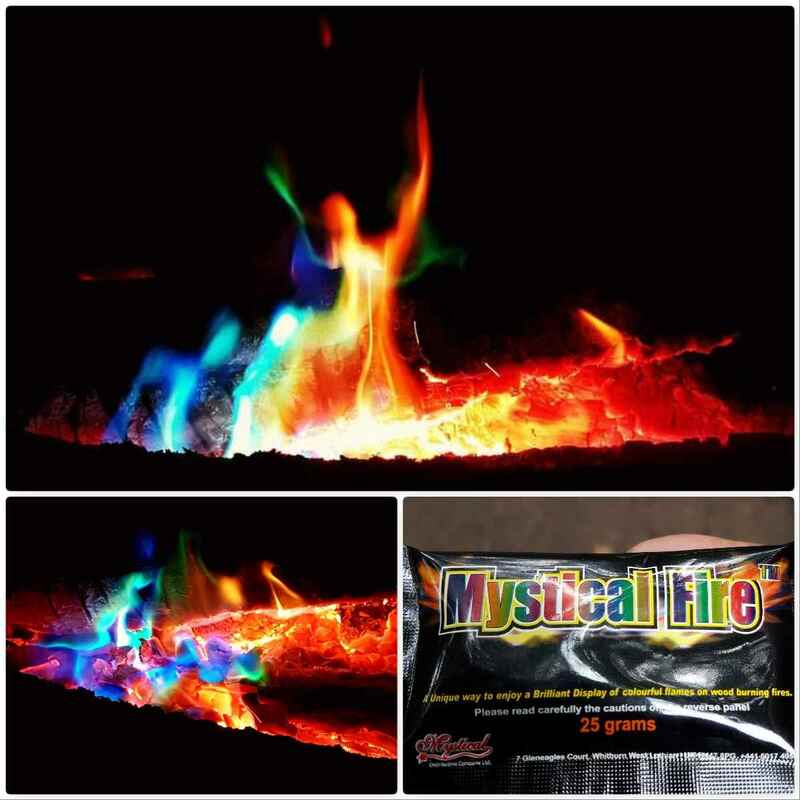 After getting a few coals we popped one into a tinder bundle and started blowing that into flame. 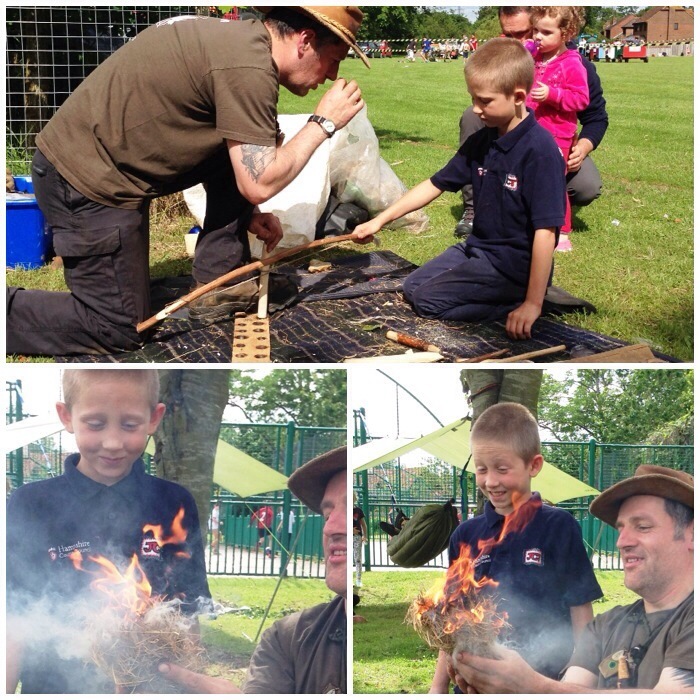 Everyone was keen to be involved in all parts of the process of making fire. As we could not keep the fire going because of the college safety rules all I could do with the class was to explain at this point how they would go about building their fire up so it became self sustaining. 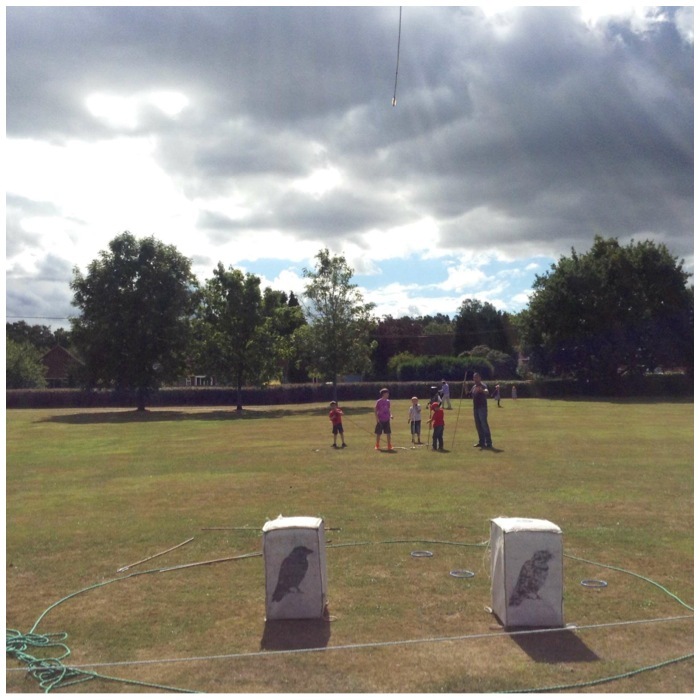 The final activity was to get the Atlatl darts out. I could not bring any with me on the plane so I just bought some bamboo canes locally and made flights out of tape. All in all the set cost me about £6. After a bit of tuition to each pair it was time to do some shooting. In no time they were getting the hang of it. 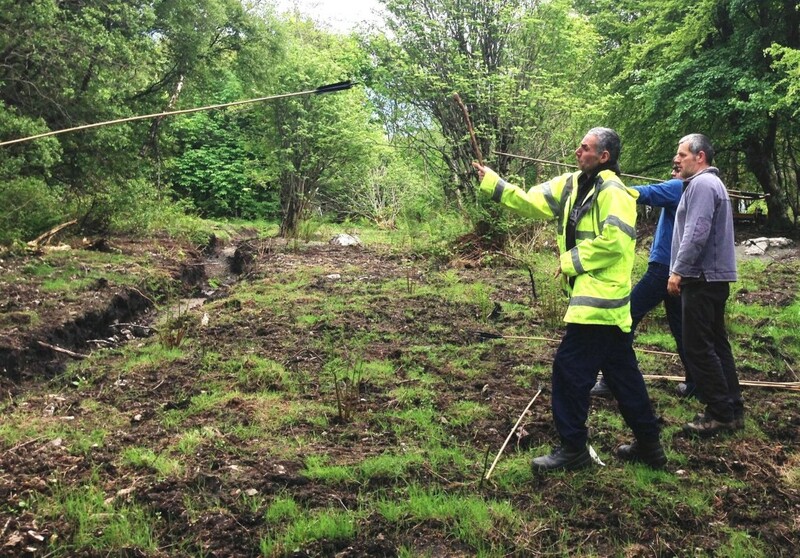 We did though have to move our target (thanks for your ingenuity here John) as some golfers had lost a ball and were searching for it in scrubland near the target. 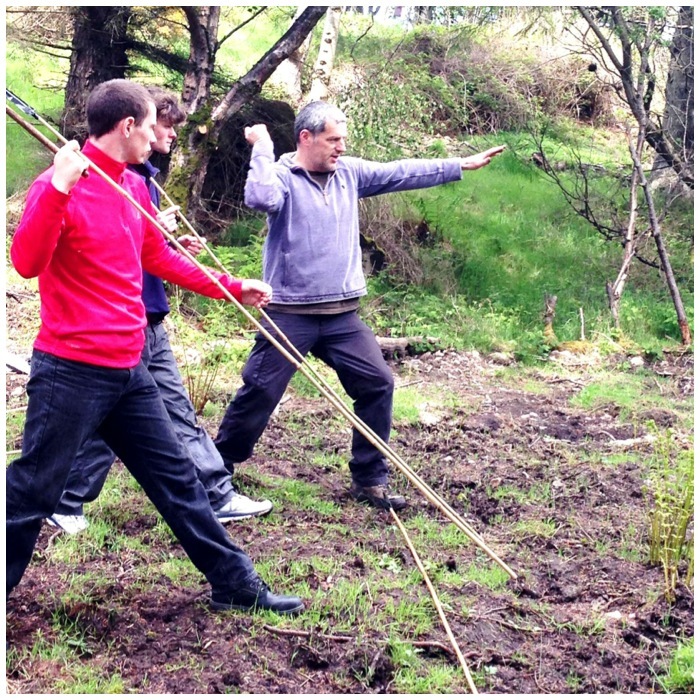 I think John is a possible convert to the Atlatl by the look of the concentration on his face. 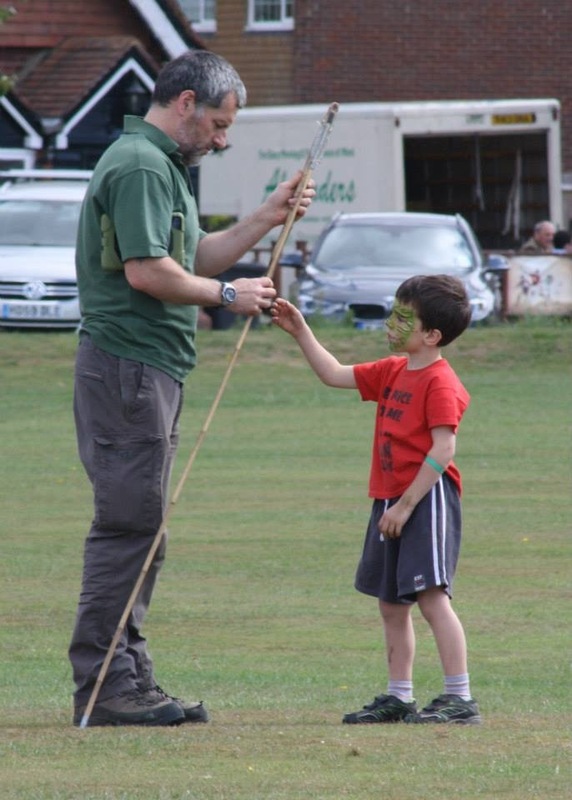 I really enjoyed teaching my brother Finlay to use the Atlatl. In the end they all got the hang of it and were happy to be chucking darts down the range. I must in the end thank my sister Tina and John for arranging this day as I had a fabulous time working with everyone in Finlay’s class. 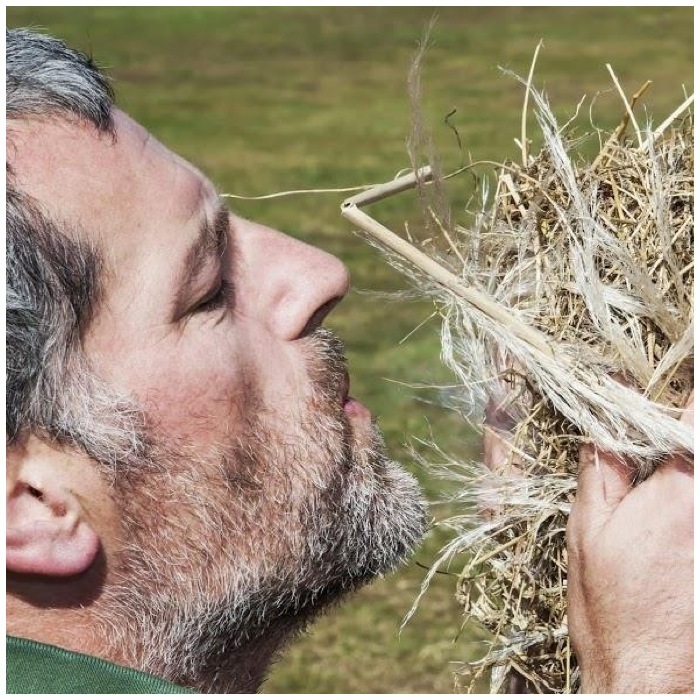 After the day was finished I was really struck by how many of the skills I practise under the title of bushcraft were being practised on a daily basis on the Isle of Lewis just a few generations ago. 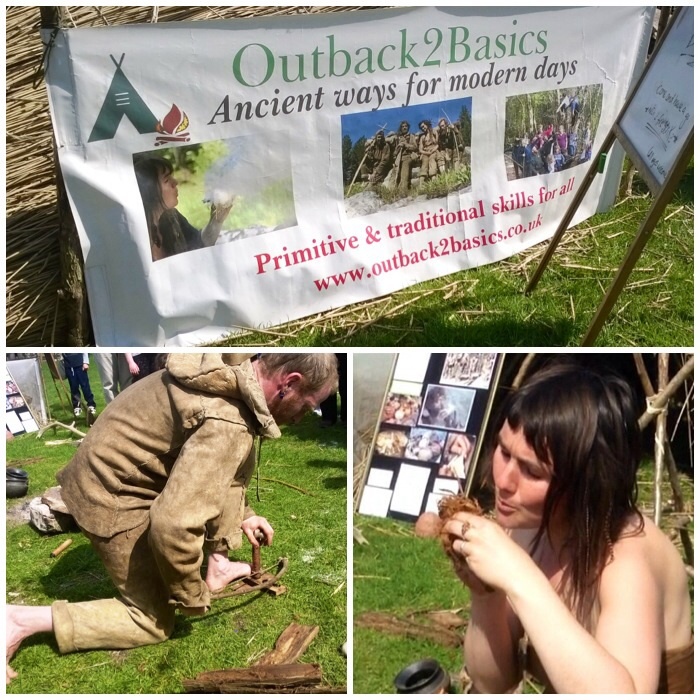 I was catching up on what was happening on Facebook last week and spotted that the Ancient Technology Centre (ATC) was holding a Stone Age Weekend the following week. Thankfully for me my calendar was free and as my kids love this sort of interactive show it was not hard to sell it to them. 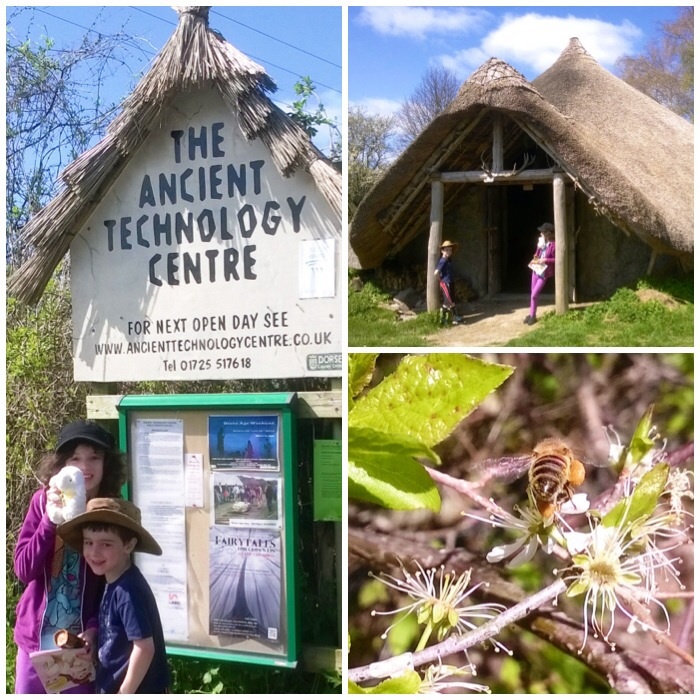 The centre is in Dorset, just over an hour’s drive from our house, and on this weekend the weather was perfect for my Scottish skin (warm but not too hot). My main aims for the visit were to let my kids have lots of hands-on fun and pick up some ideas for myself for future projects. 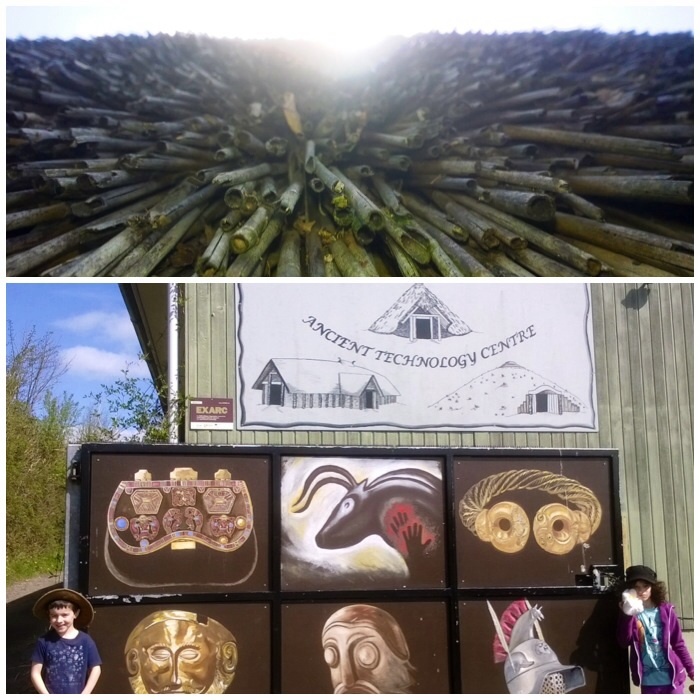 The ATC caters well for parents and kids and as it is a place where lots of experimental archaeology is undertaken it ticked all the boxes for me. 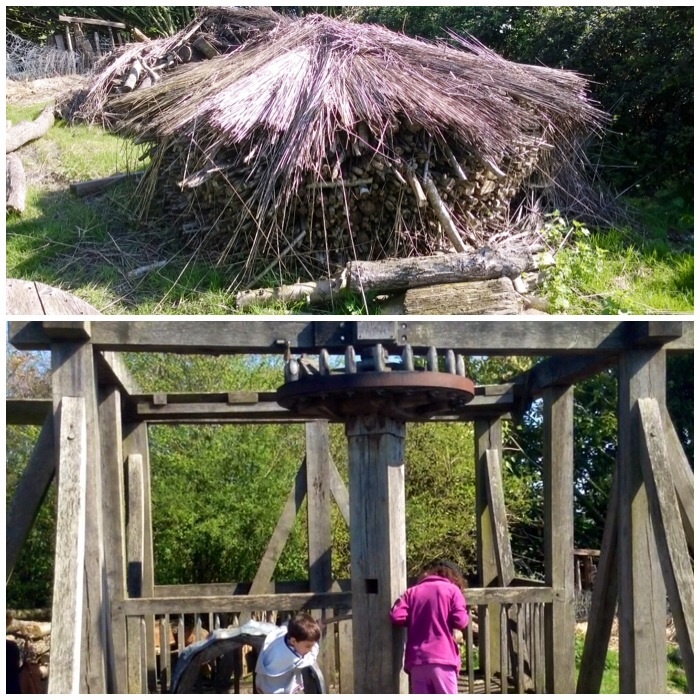 The top picture below is taken from the bottom of the roof of one of the roundhouses. 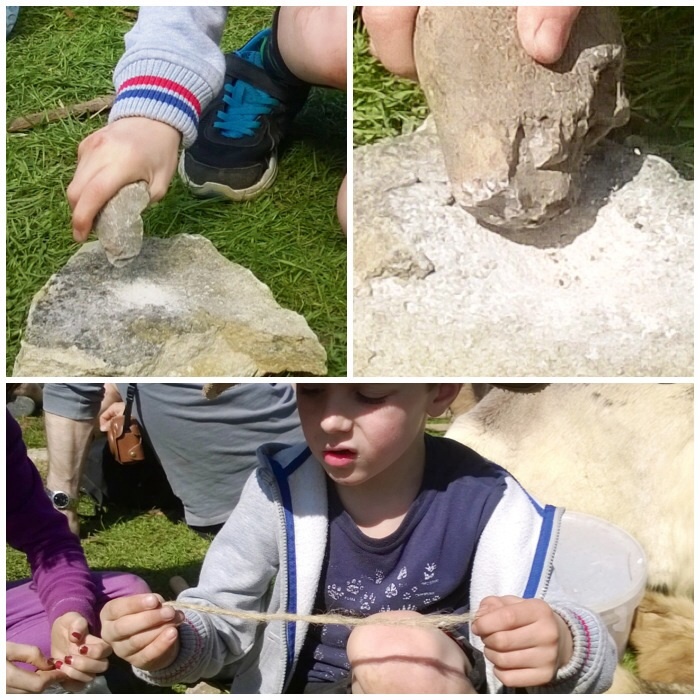 We took a walk around the whole site at first just to show Catherine and Finlay what they could do. In the end the kids had to drag me away from one of the roundhouses as I wanted to explore every item in it and how it was built. 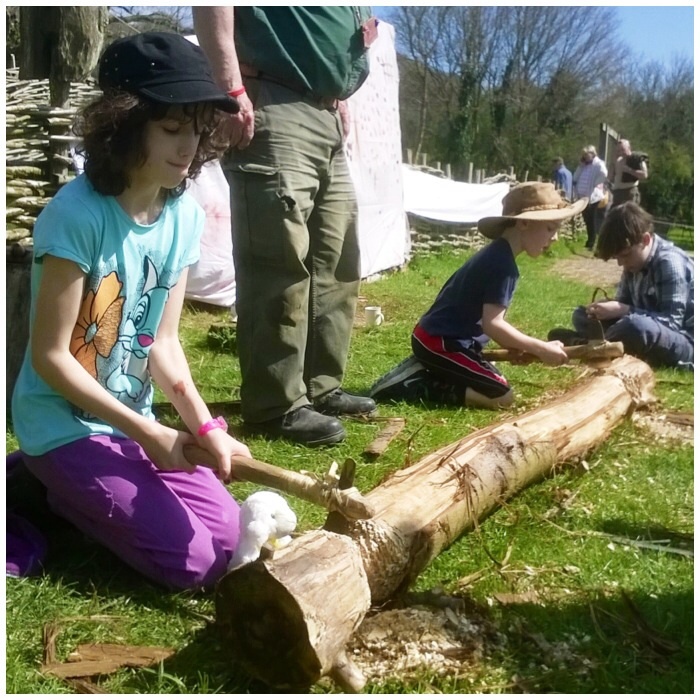 After a five-minute wait Catherine and Finlay were using Bronze Age axes and happily chopping away. They did come back for a second go later and I managed to have a chop as well. 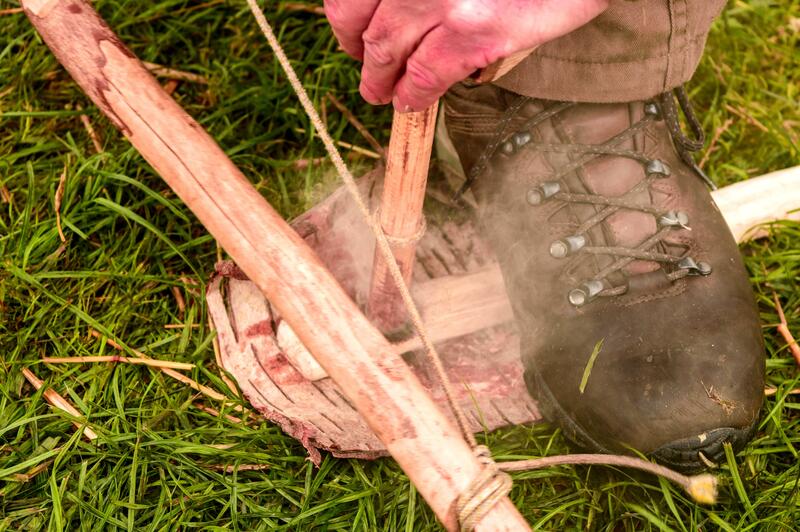 This was the first time for me using a Bronze Age axe and it is different to using modern or flint axes. I liked the fact that the queues here were in single-figure minutes (currently writing this in a queue – 35 minutes at Legoland and counting) and everybody was really relaxed. 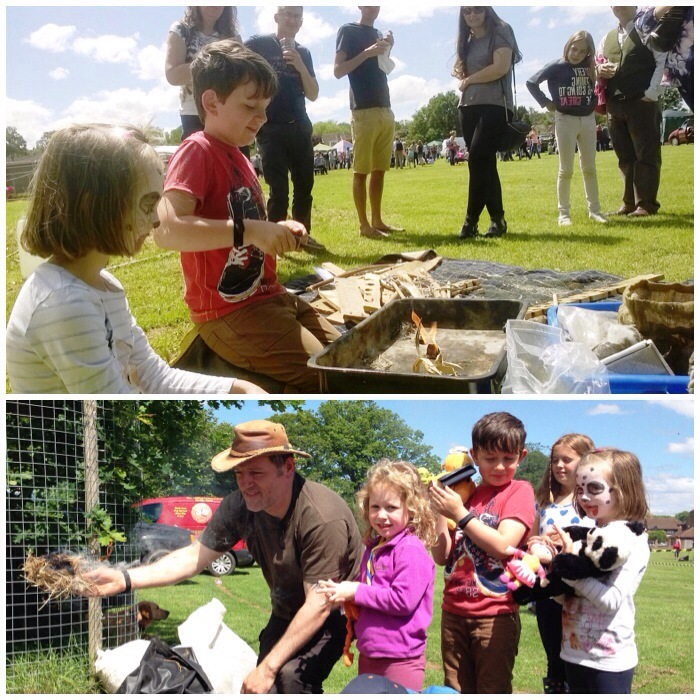 The centre also experiments with primitive pottery and had set up a work area where we could all make a pot and decorate it using old bones shells and feathers. 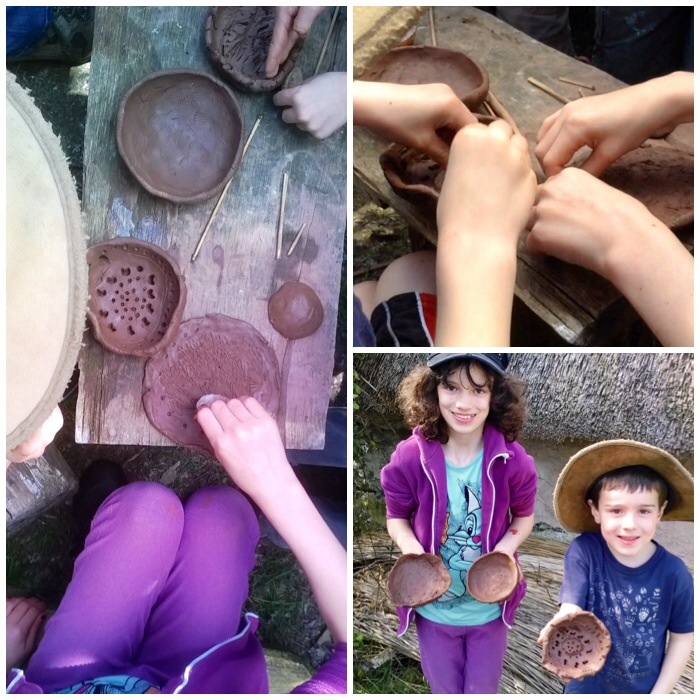 We left our pots to dry in the sun before taking them home. We will have to let them dry for at least another two weeks before firing them over an open fire. I don’t know if we’ll do this final stage as they may crack. While Catherine and Finlay were happily engrossed in cave painting techniques I managed to slip off and see what else was going on. 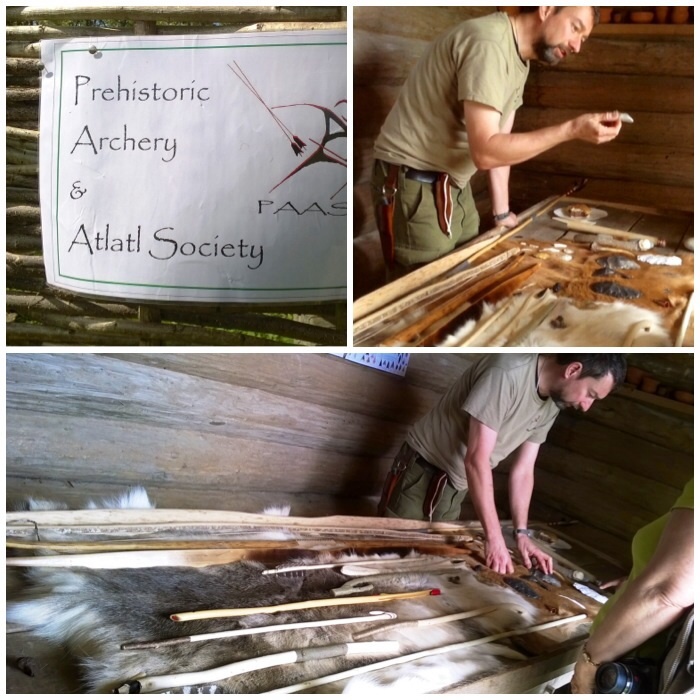 I popped over to see what was on display on the Prehistoric Archery and Atlatl Society (PAAS) stand. 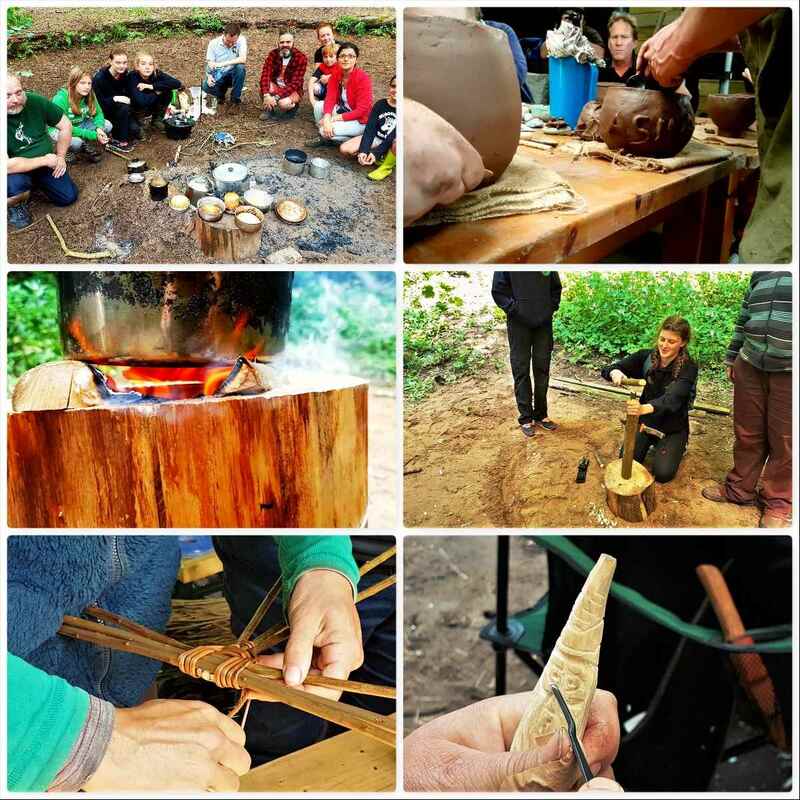 PAAS make some beautiful craft items based as close as possible to archaeological finds and are also keen experimental archaeologists. 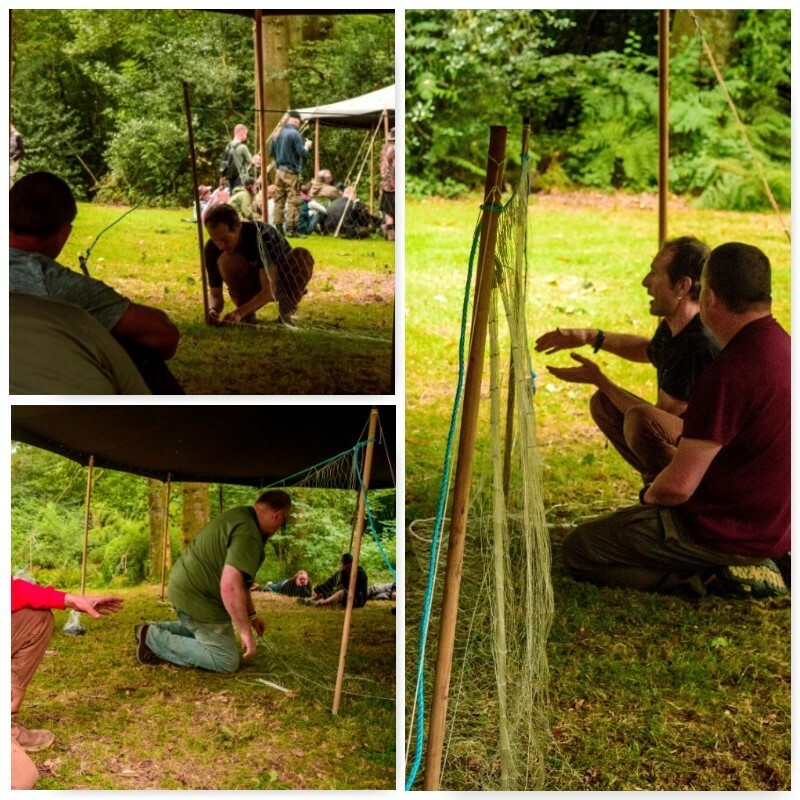 Last year PAAS visited us at the Bushcraft UK Bushmoot and gave some great classes on archery, atlatls and slings. They plan to be at the Bushmoot this year as well. We watched a demonstration next of Bowdrill using just a primitive set. The couple doing the demonstration were from Outback2Basics and put on a great show. 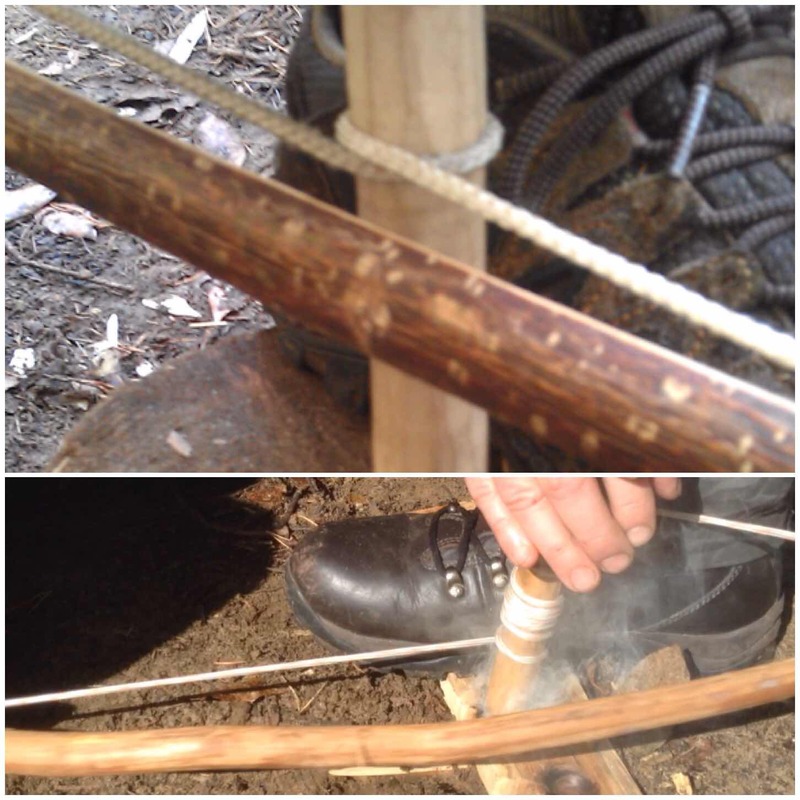 We missed the first class on making campfire bread and cooking salmon but managed to get some time bowdrilling. Finlay and myself took a twirl on the bow and then Catherine took over on blowing the ember into flame. 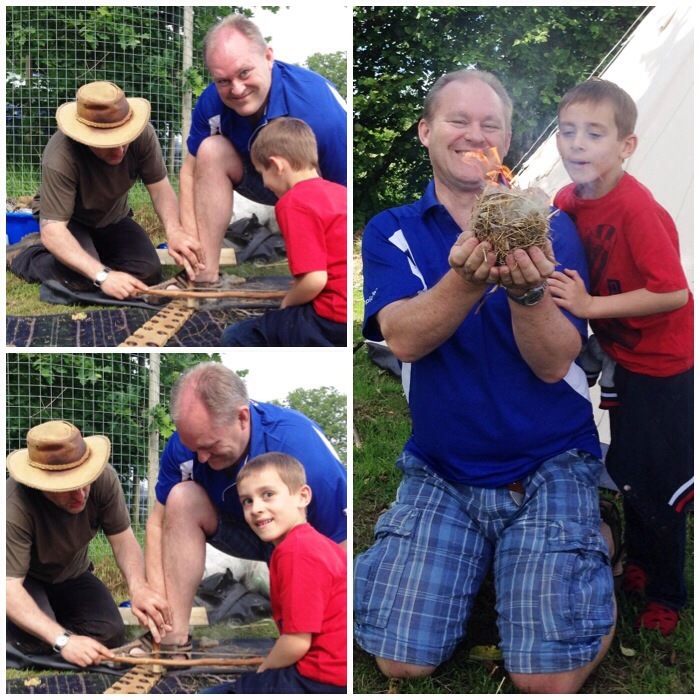 With a little help from Finlay we soon had a flame. 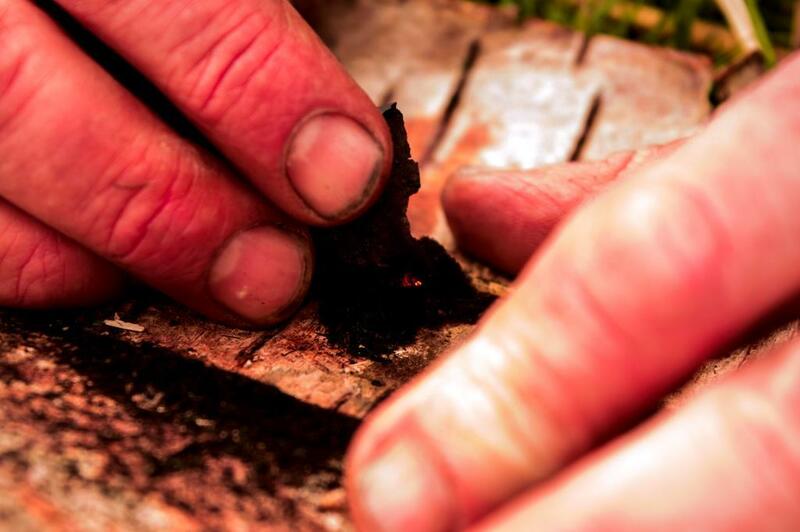 The tinder was the inner bark from a Leylandi tree. 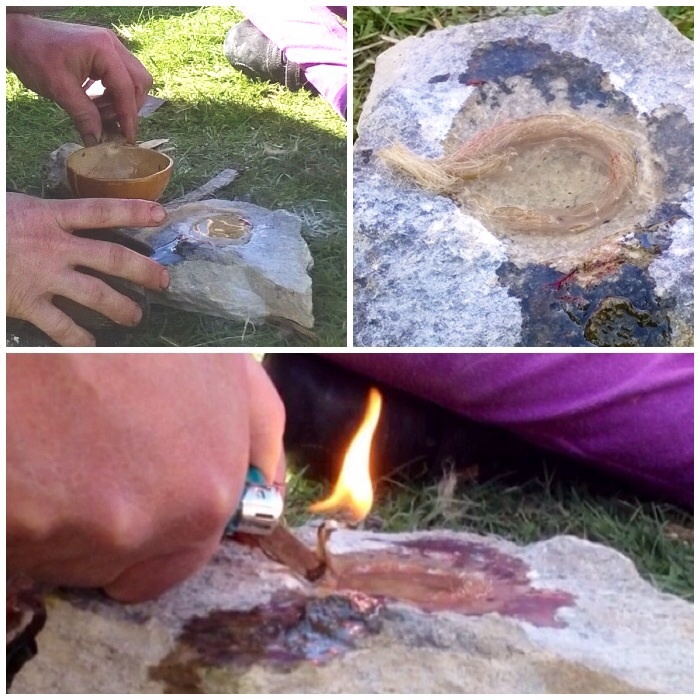 The next class with them was making a fat candle using a rock as a holder. 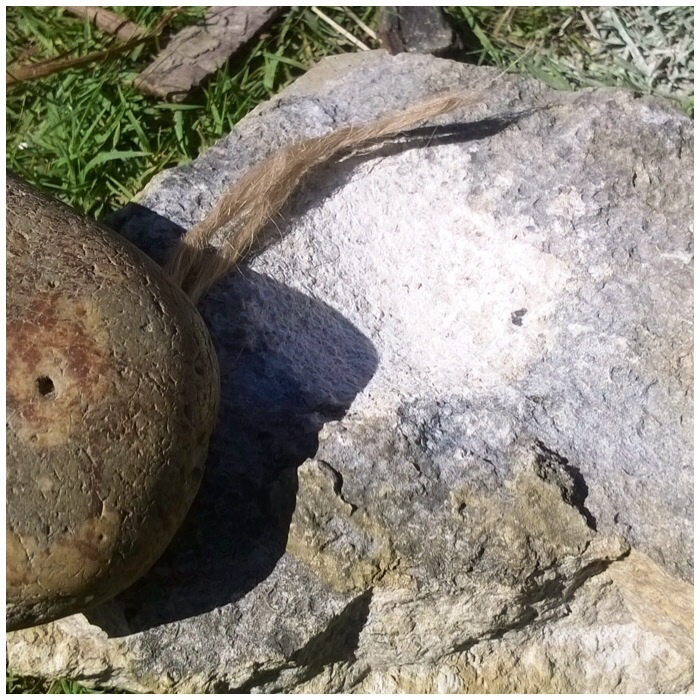 We chipped away on a soft rock with a hard rock to create a small scoop to hold the fat. 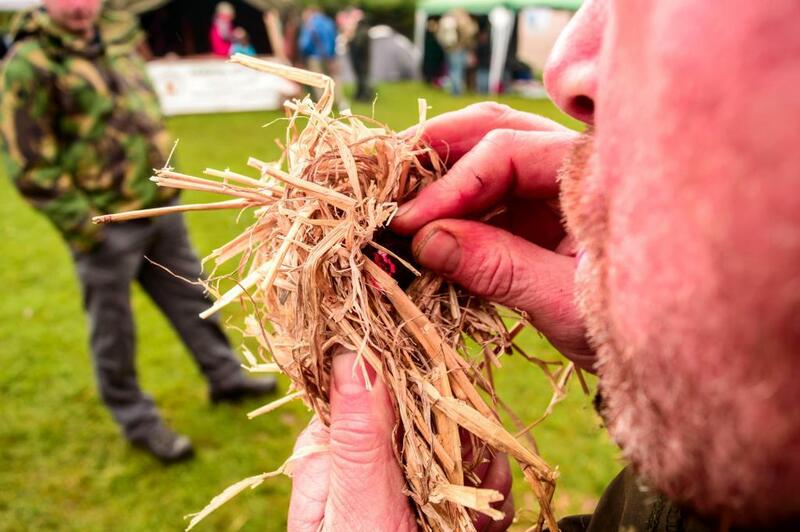 The wick we made out of some jute string by untwisting it and then loosely putting it all back together. The scoop took us about 20 minutes to chip out. 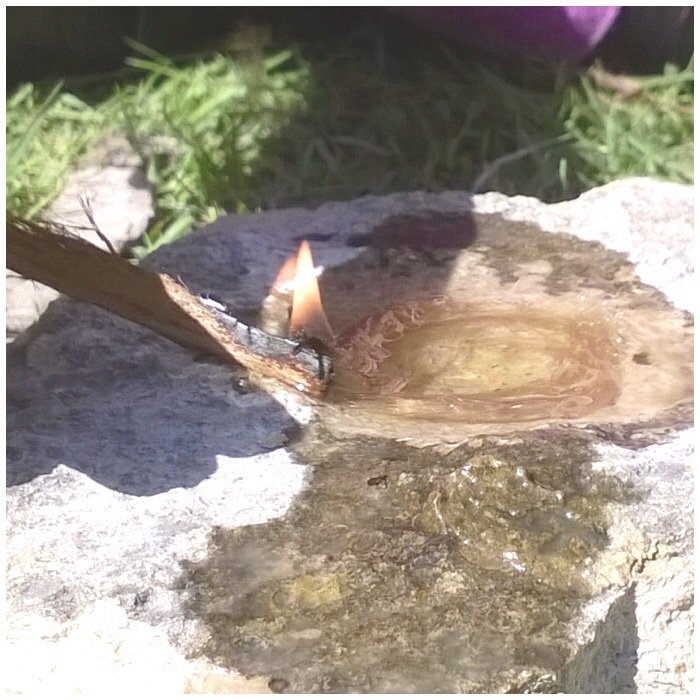 I cannot remember what type of fat was used but once it was poured in the wick was added, leaving about a centimeter protruding from the fat so that it could be lit. The winds were quite light but would gust a little so we had to protect the flame. I managed to capture a lot of the day on this short video. 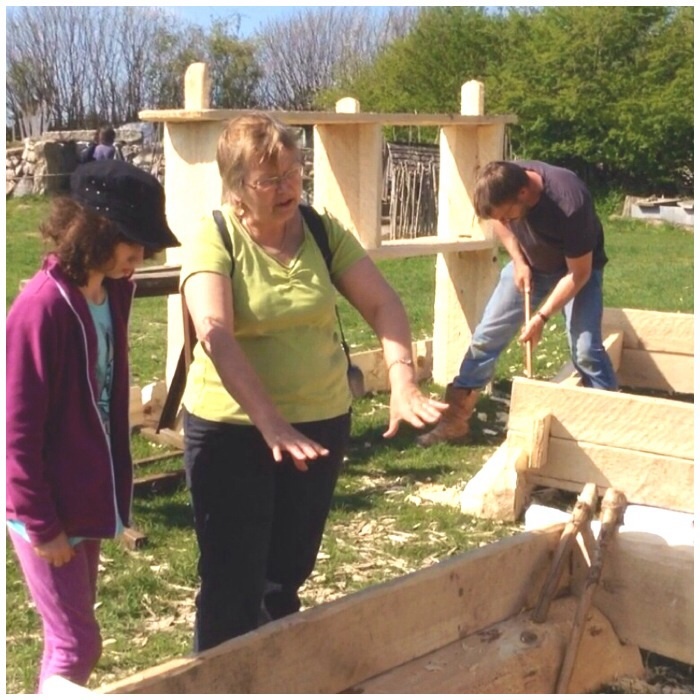 Afterwards we had a look at the wood carving section and Catherine learned all about how beds were constructed in the past. 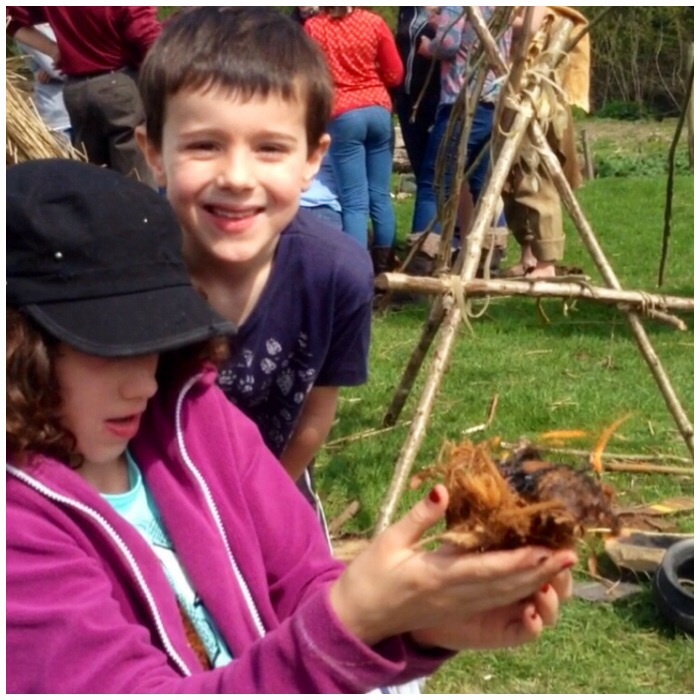 I picked up some ideas on making a circular stack for my kindling and the kids had fun on the Roman turntable. 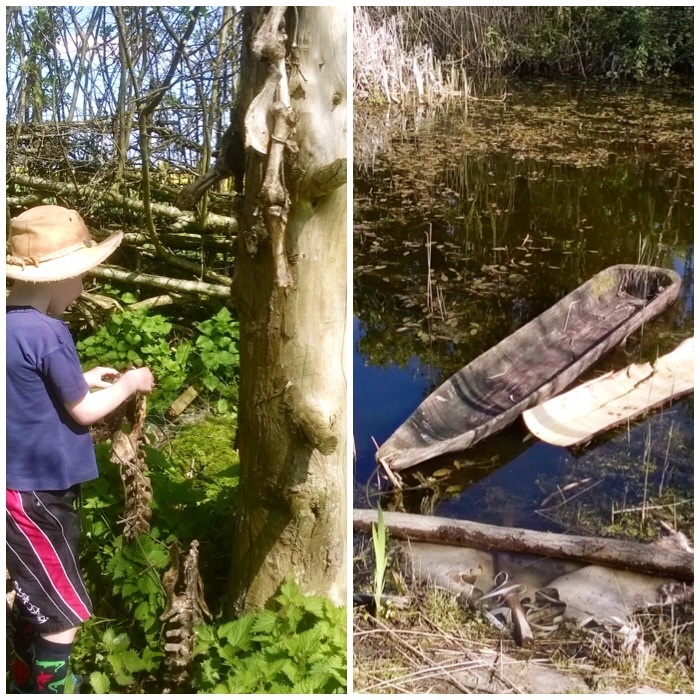 Two good finds of the day for me were the drying post for bones and the wooden dugout in the pond. 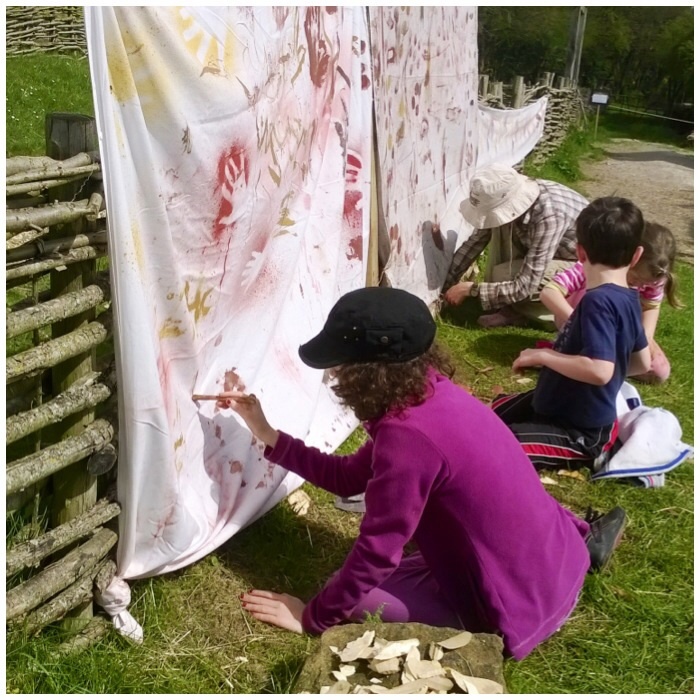 I would thoroughly recommend you visit the ATC if you ever find yourself down near the New Forest as the work they undertake is quite amazing. 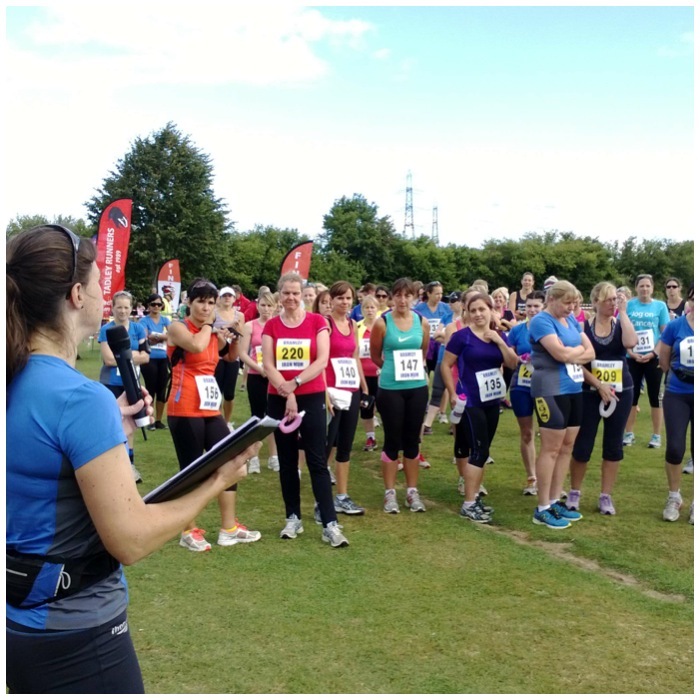 Every September for the last 5 years many of the ladies of Bramley, Hampshire have come together for a very special race. 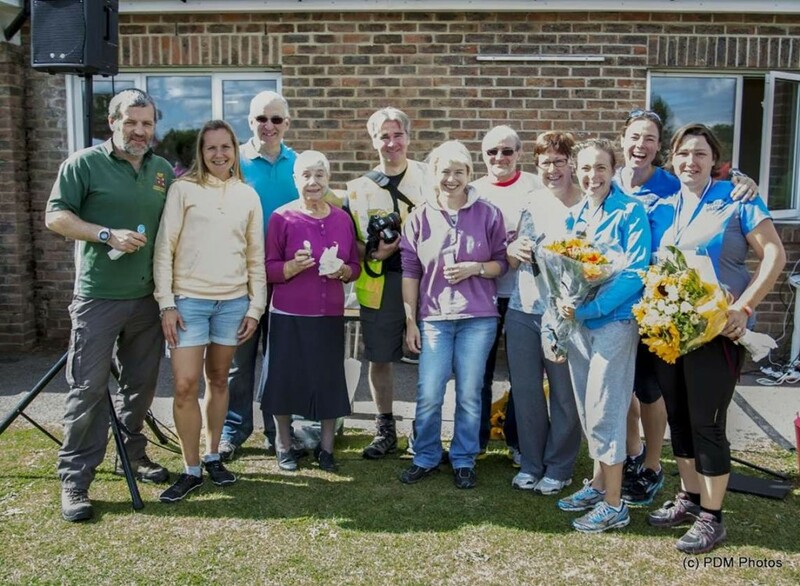 It’s called Iron Mum and these ladies train very hard throughout the months leading up to it. Many will have started for the first that year having not trained in any way for years (or never) and in a matter of a few short months are running, cycling and sprinting in this race. My wife Alison is one of the organisers and for the first few years she had me out on the route doing marshalling. Thankfully that came to an end two years ago when I was redeployed to the fun day, and now I get to play at bushcraft while the ladies are out running. 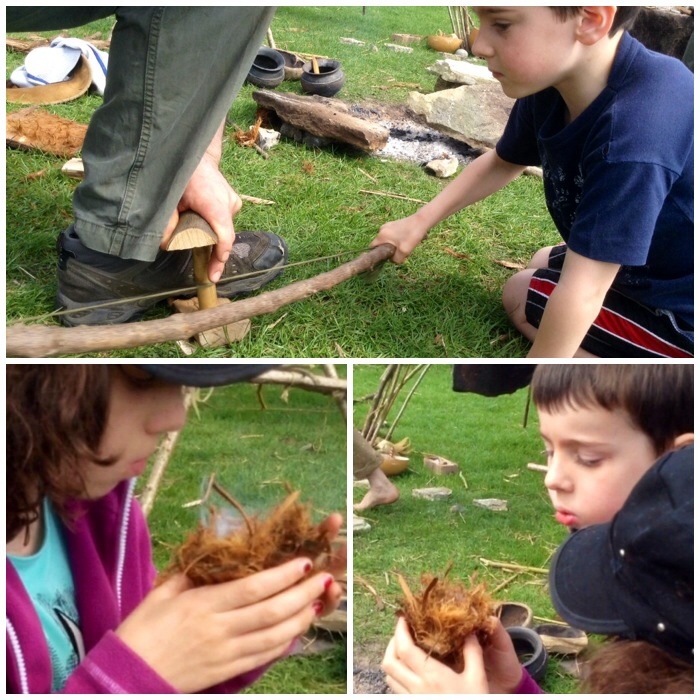 Catch is though, I have to help about 20+ kids (and the occasional mum or dad as well) achieve an ember using a bowdrill. Luckily for me I enjoy the whole fire-making business. 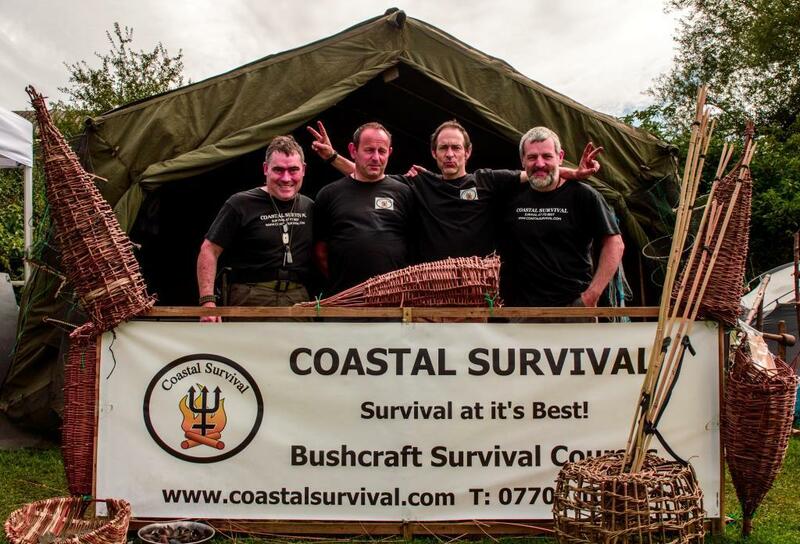 The day for me starts early as I have to set up my bushcraft area and help with setting up the race. 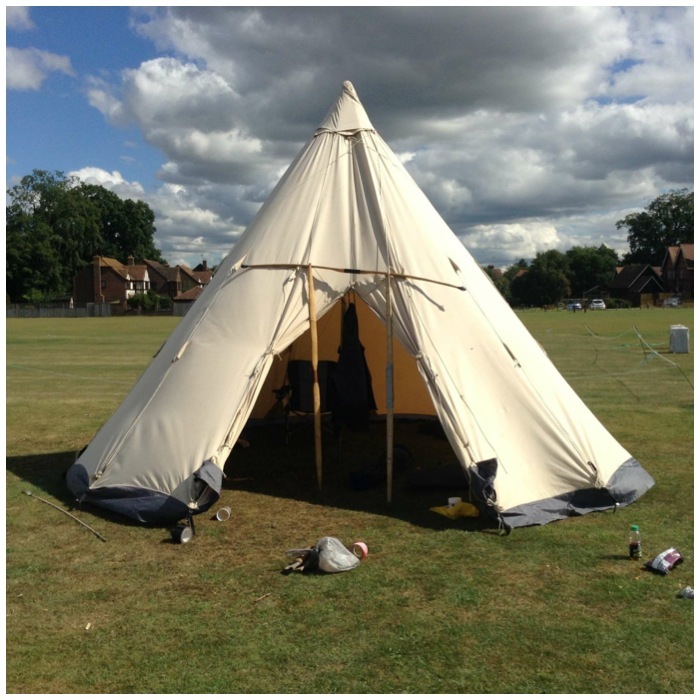 Normally I start about 6am setting up my tipi as a focal point for the bushcraft. 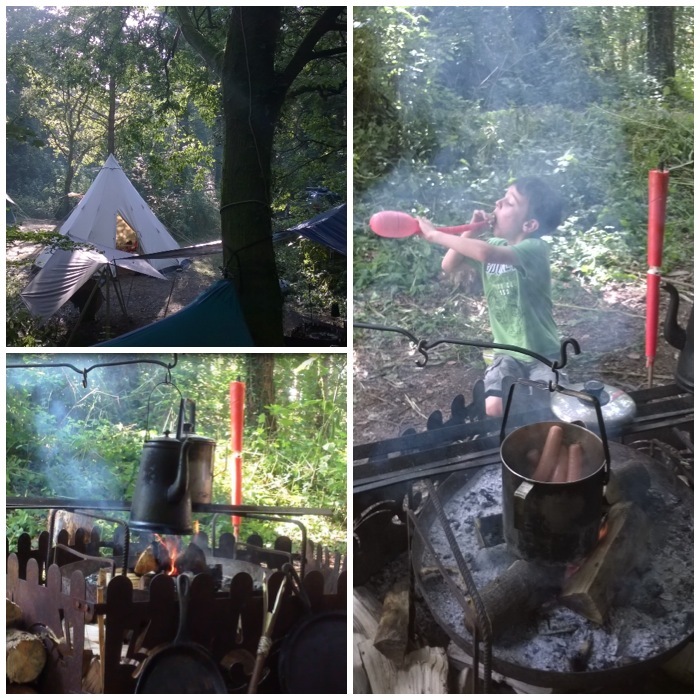 I have the fire area set up near the tipi and an Atlatl range set up behind it. Inside my tipi hanging on a rope from the centre pole is a Burdock hanger for my jacket and bits and bobs. I will be posting a How To…. on these hangers shortly. One of the main things I have to prepare are the drill pieces for the bowdrill. I will go through quite a few before the day is out. Once everything is set up it is good to get a brew on. I like to use the Kelly Kettle for this as the fire area is self contained. 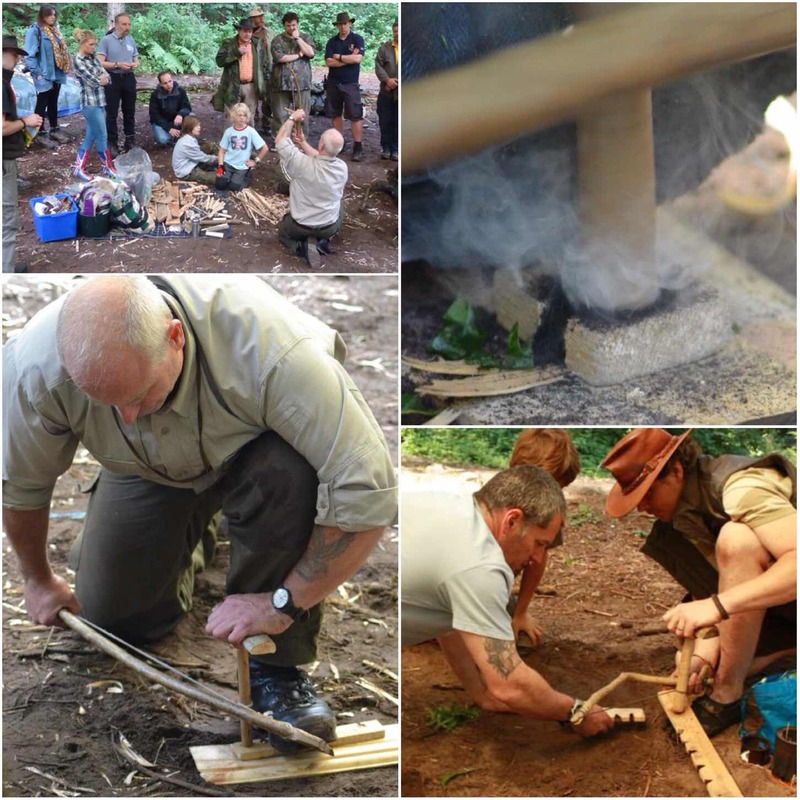 Also it is good for these kind of shows as people can learn some basic fire starting skills using one. 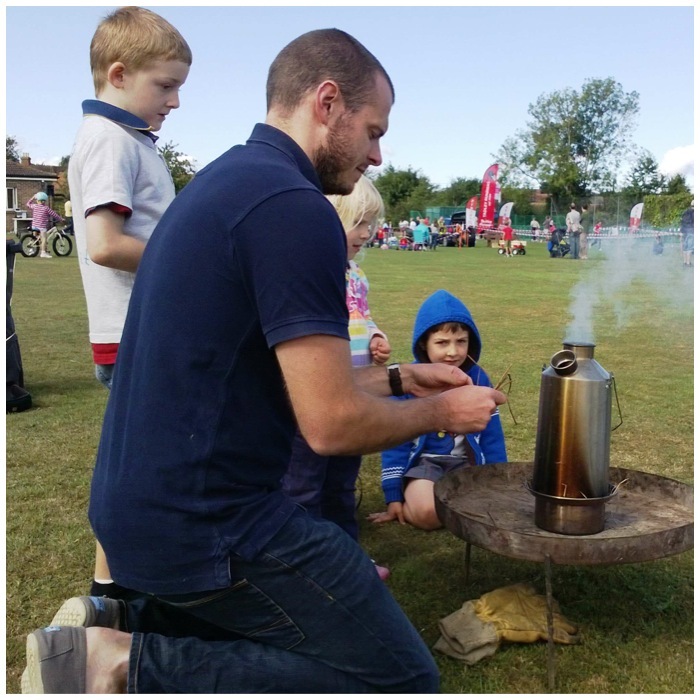 In this picture though is Tom Gilbert (a fellow member of BCUK) who was perfectly capable of getting the Kelly going and a brew on. Last year I got my first customers even before the race started. 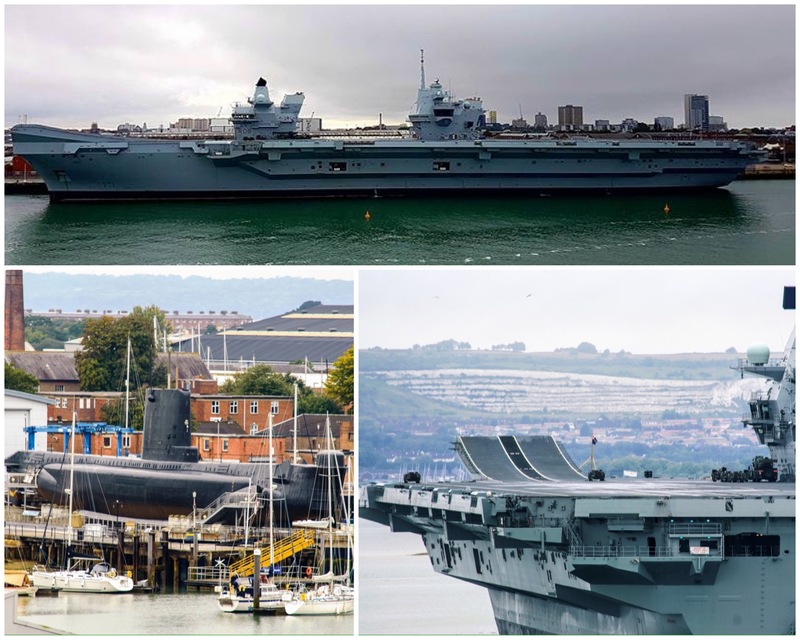 I try and explain all the different parts but sometimes the queue is too big or the kids just have that look in their eye that says ‘Just get on with it!’. To give that feeling of teamwork (and maximise the number of kids having a shot) I try to get them to double up with me. 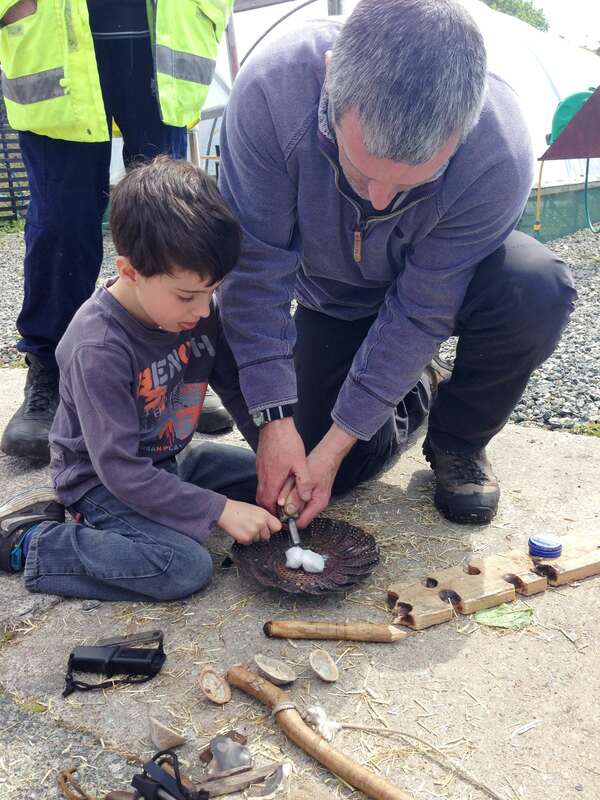 The need to master the bowdrill solo only starts to take hold in the teenage years, so all the kids I work with are usually very happy to work as part of a team in firemaking. My son Finlay though was very insistent on just the two of us having a go. Thankfully the day was warm, the wind was gentle and steady and I had plenty of dry timber, so we got lots of embers really quickly. 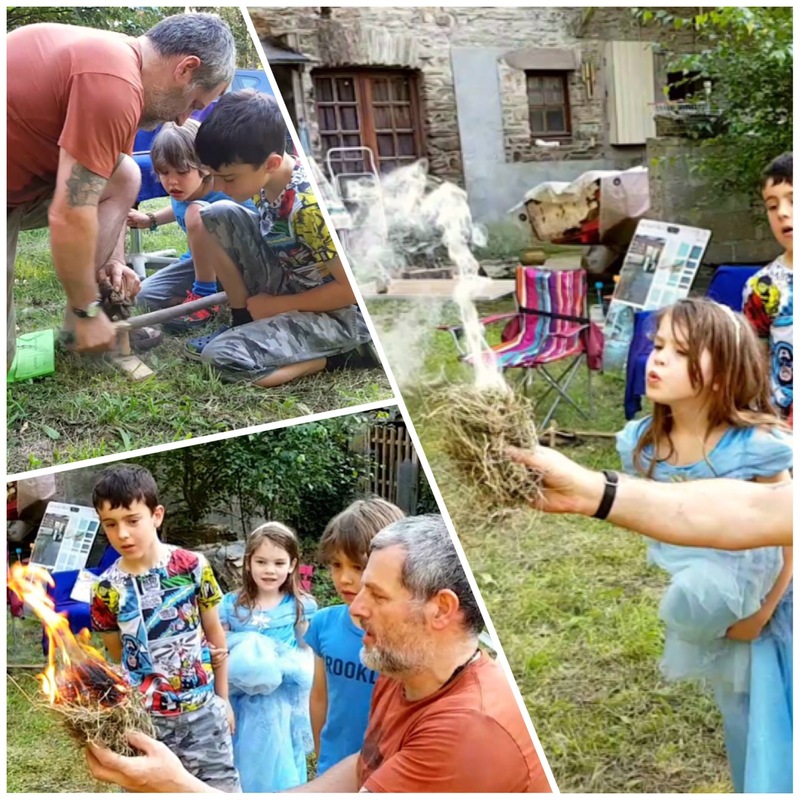 The kids were pretty enthralled with seeing a glowing ember and were really protective of what they had just created. The wind was just strong enough to be helpful with the embryonic ember’s start in life but potentially strong enough to immediately blow it apart if it was not protected. Kind of a Catch 22 situation, but the kids managed to protect their embers until they were strong enough to pop into a tinder bundle. Each ember produced a nice bundle of flame. 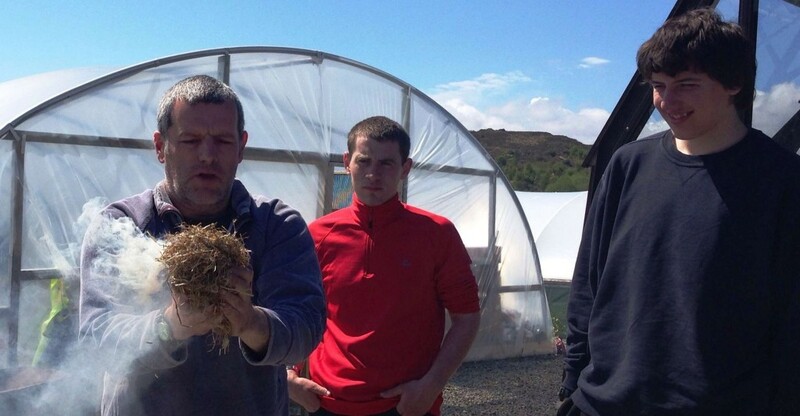 With these tinder bundles I generally hold them unless the kids are really keen to do so. 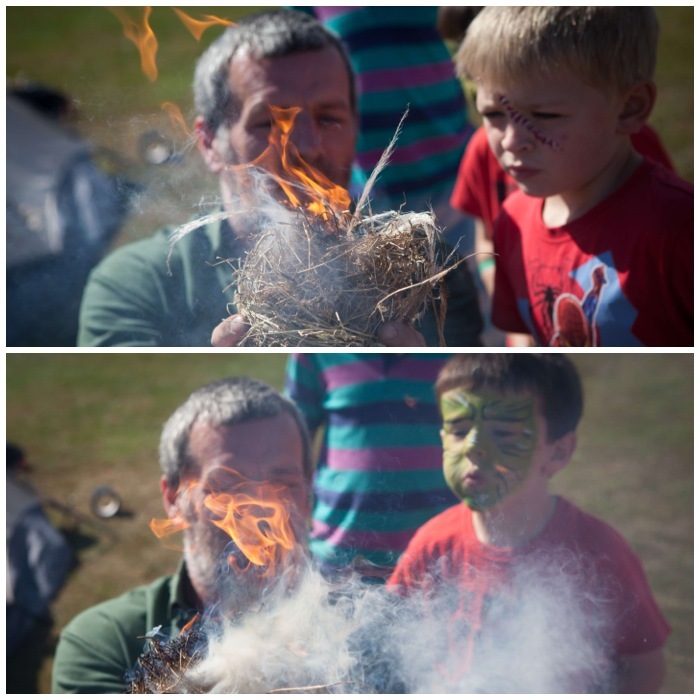 I then get all the kids to queue up behind my shoulder and take turns blowing it into flame. 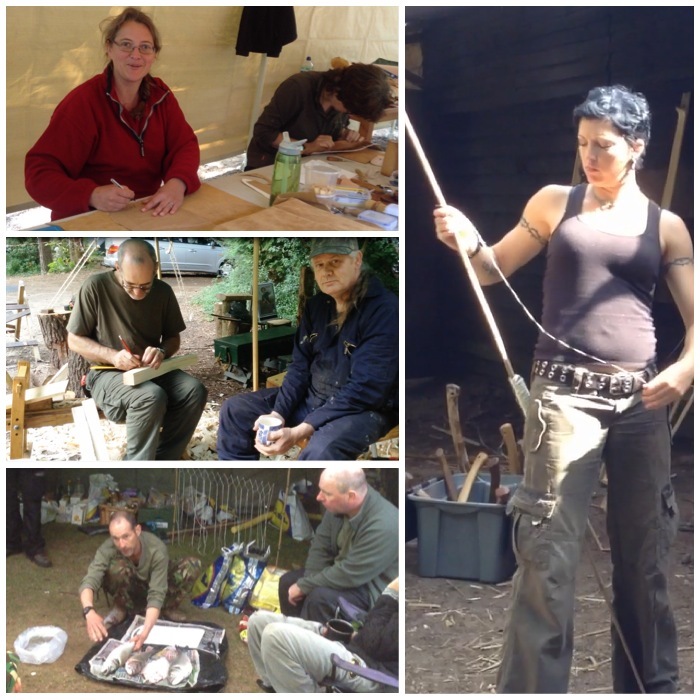 The other activity I offer is an Atlatl range. It is very small but it has a good turnover of kids. Michael is quite happy to run this stand for me (thanks mate). 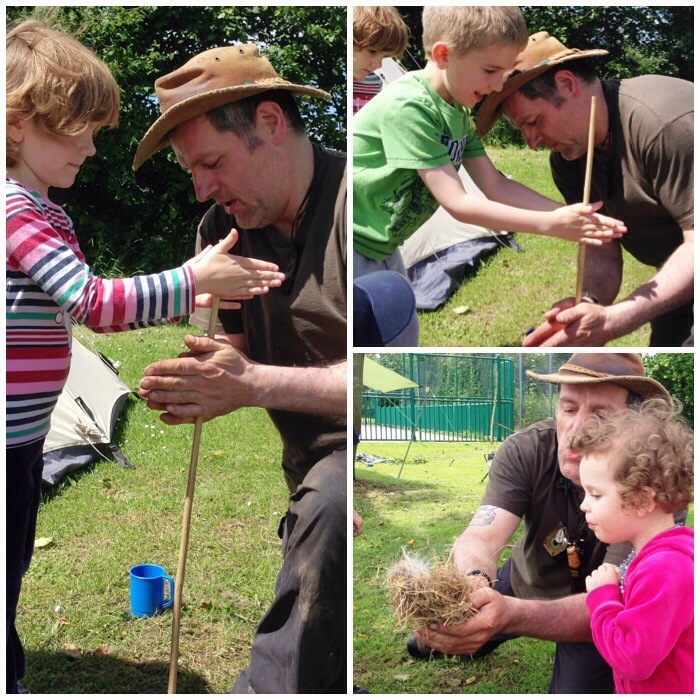 I have a range of different Atlatls for the kids to use so that even 3 year olds can use them. 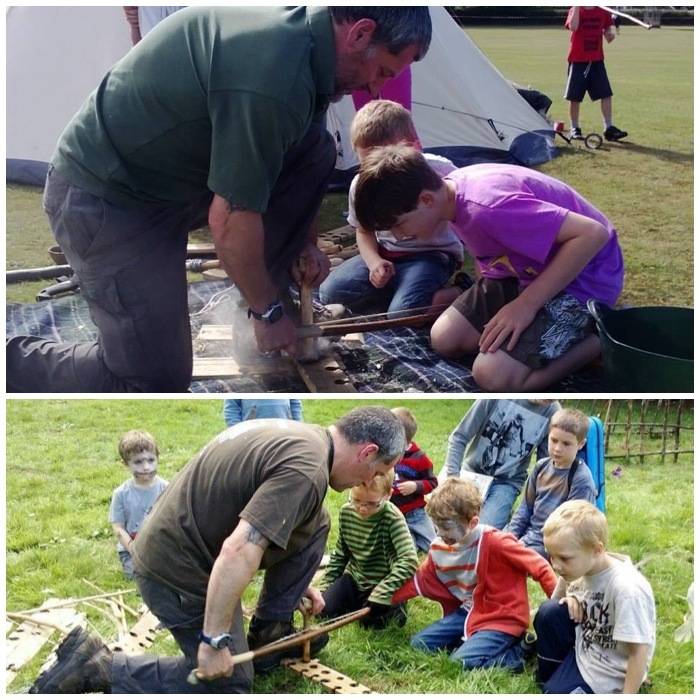 We give each of the kids a bit of tuition to begin with before letting them loose with what is basically a spear-chucking device. The range is strictly controlled with a clear target and launch area. 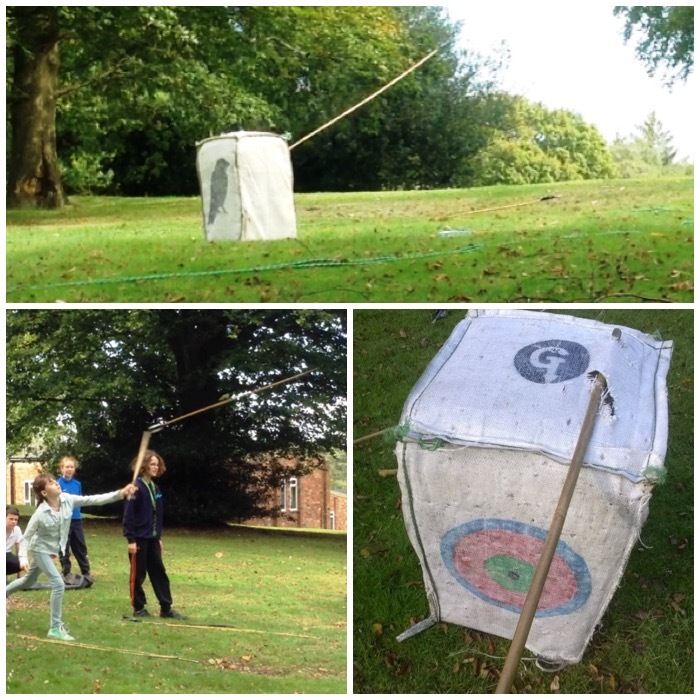 After a few tries most of the kids can get the dart into the roped off area. There is something fundamentally satisfying about throwing an Atlatl dart and I find whoever picks one up and uses it gets the same satisfaction. 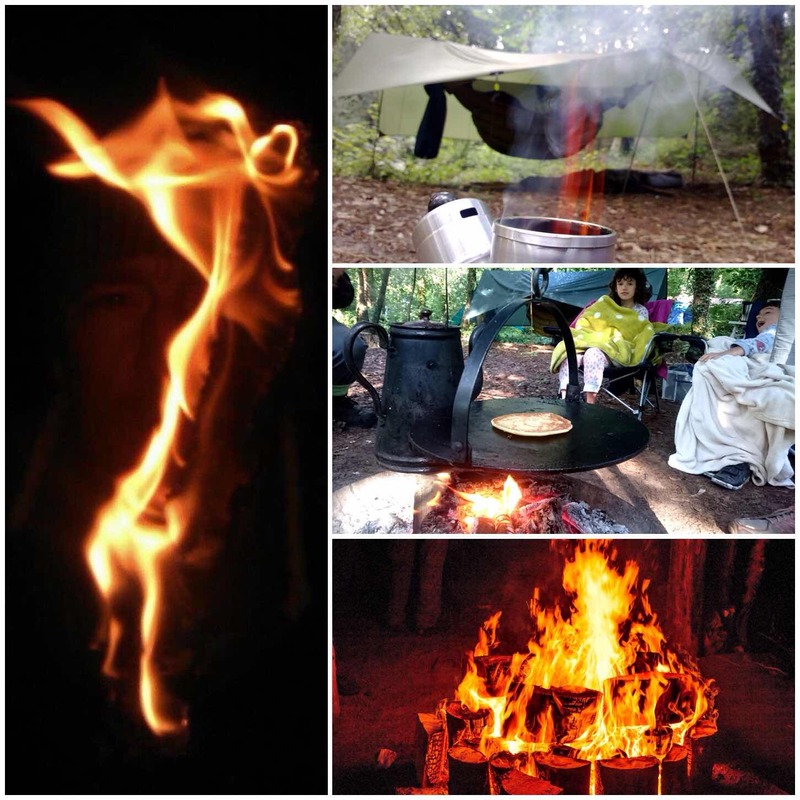 Must be something imprinted into our genetic makeup (like watching the flames in a campfire). After the race (I saw nothing of it to tell the truth) those volunteers who had helped out at all 5 races received a lovely gift of an engraved metal wine stopper. 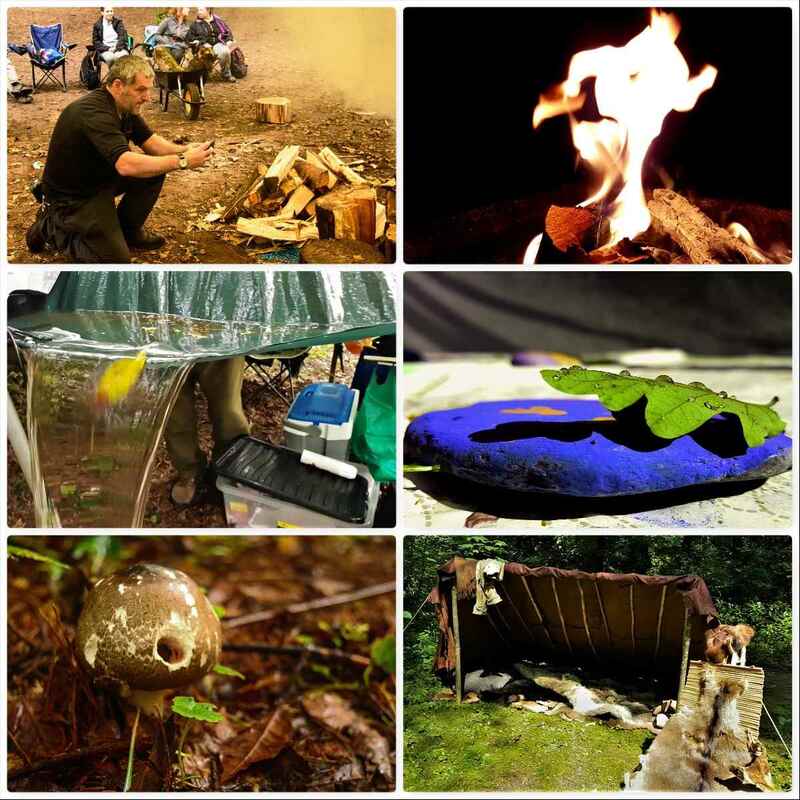 I posted up the next instalment in the Bushcraftage series for Kevin’s Natural Lore page. All about fire this time. 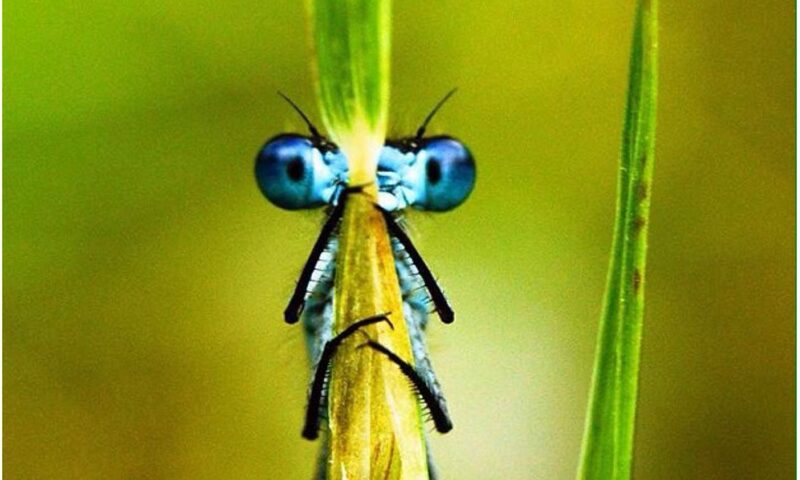 Please pop over on the link below and have a look.